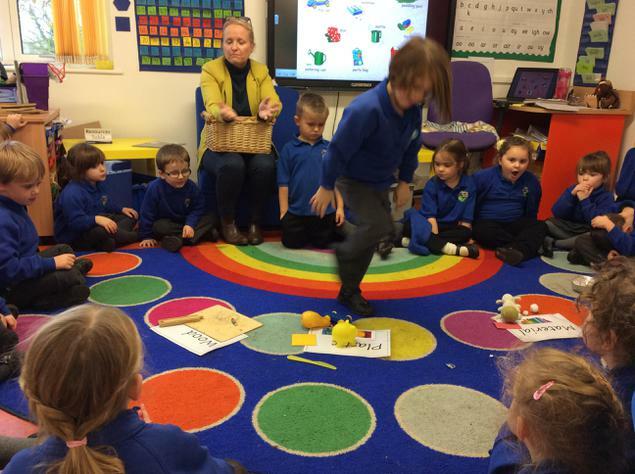 We are continuing with Little Red Hen and rehearsing for our concert on Thursday. 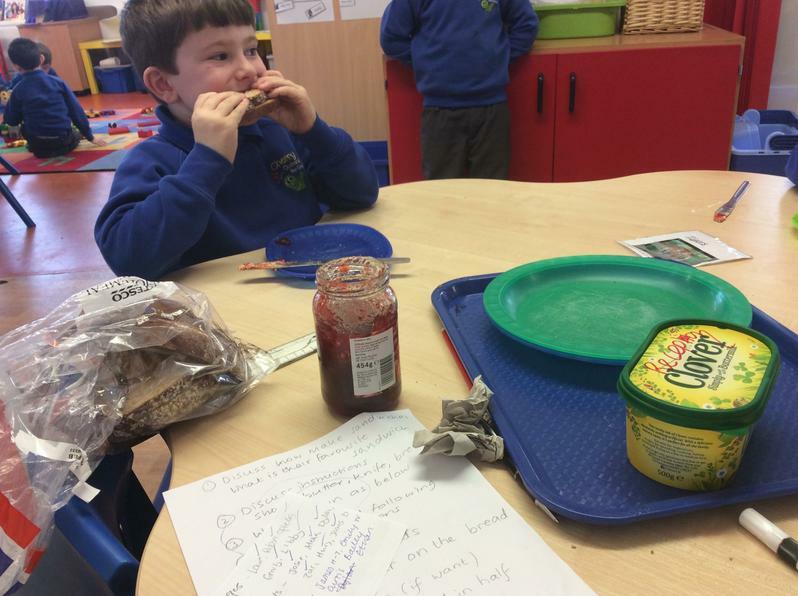 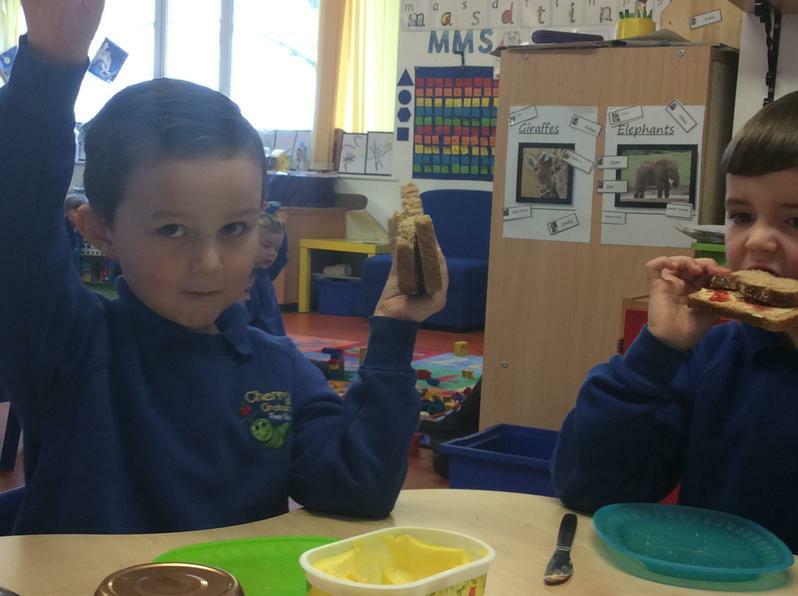 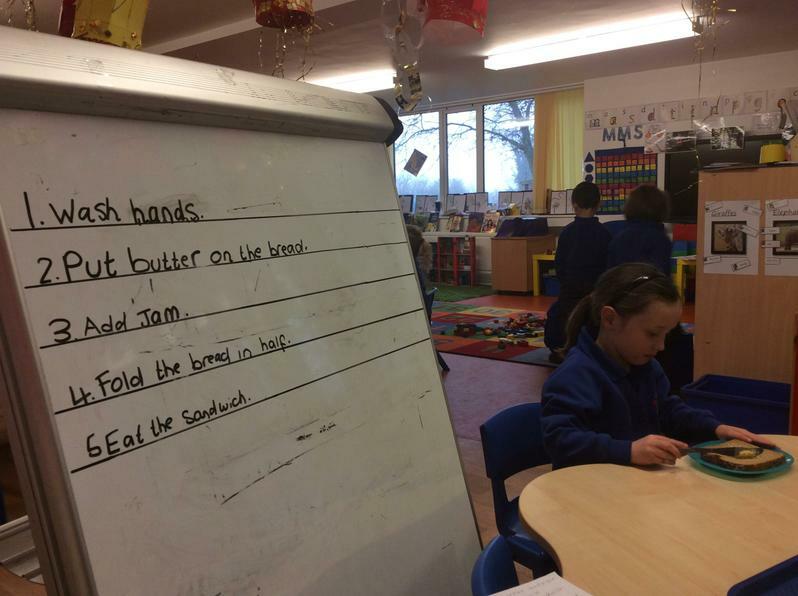 We followed instructions to make sandwiches. 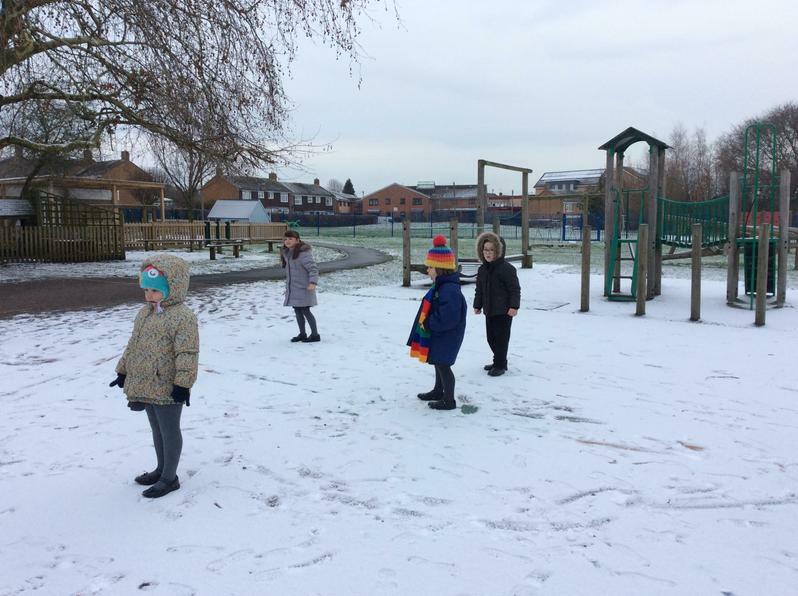 We wrapped up and had a walk in the snow. 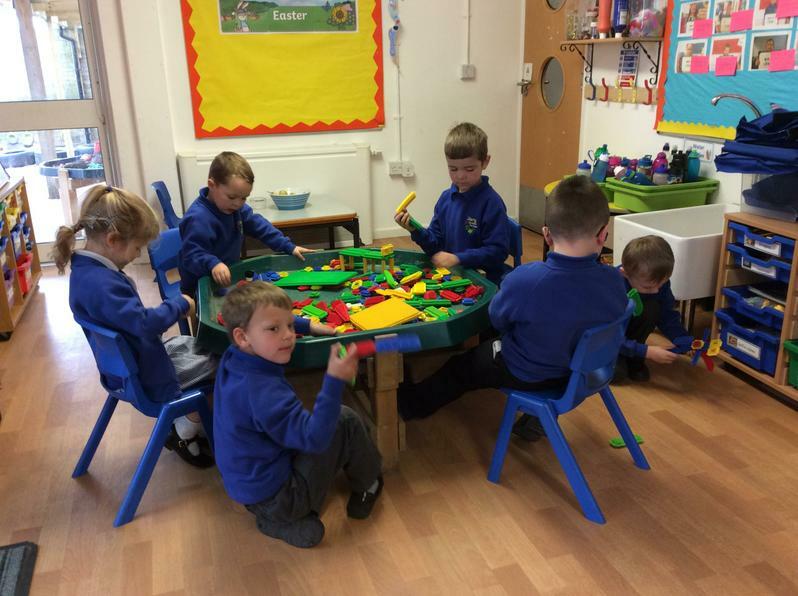 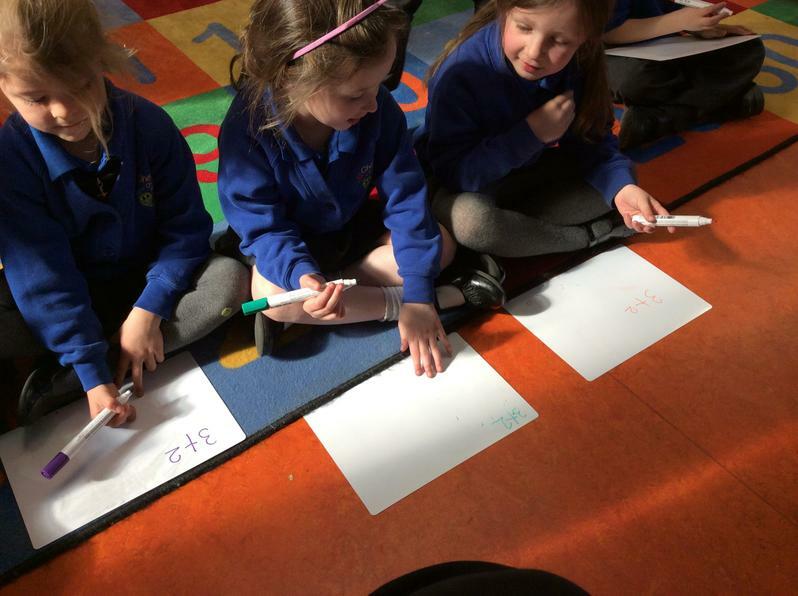 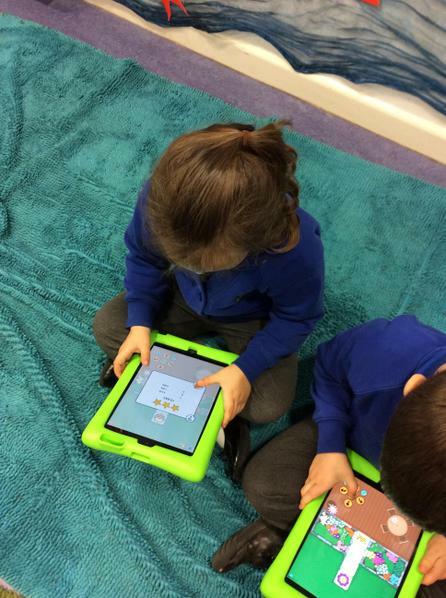 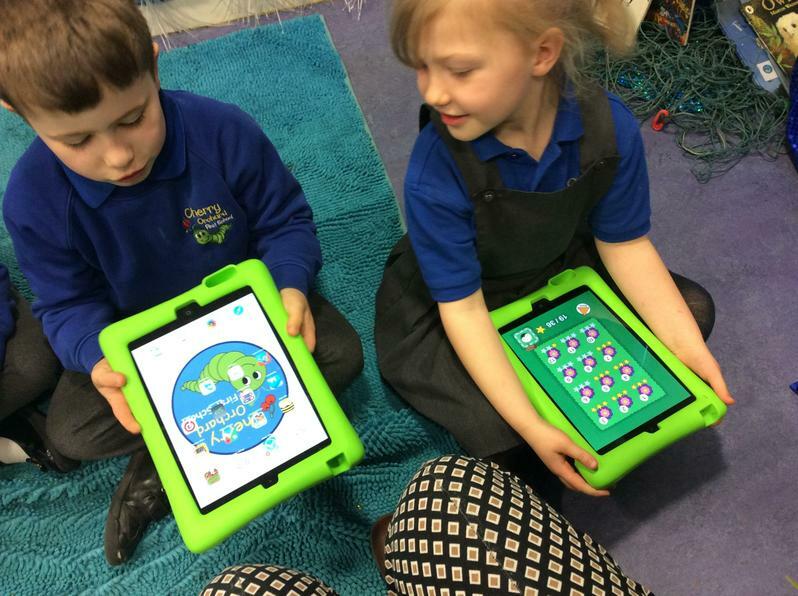 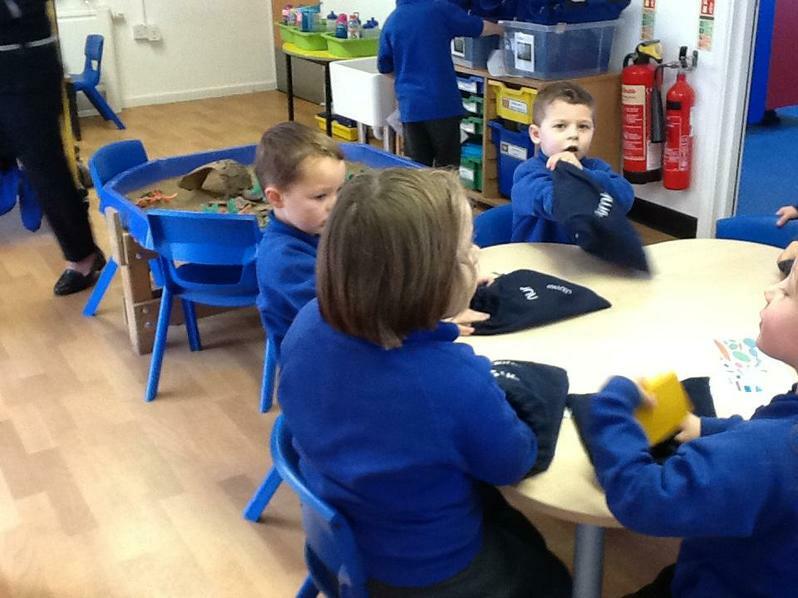 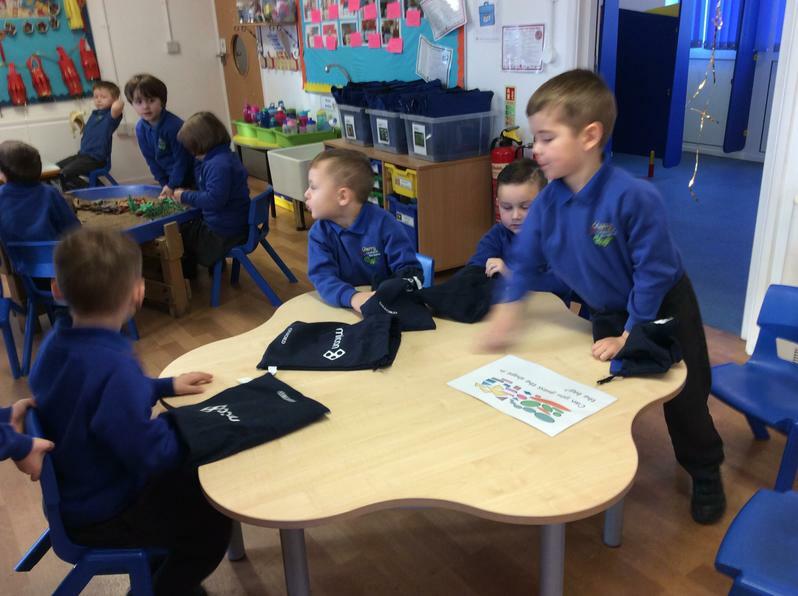 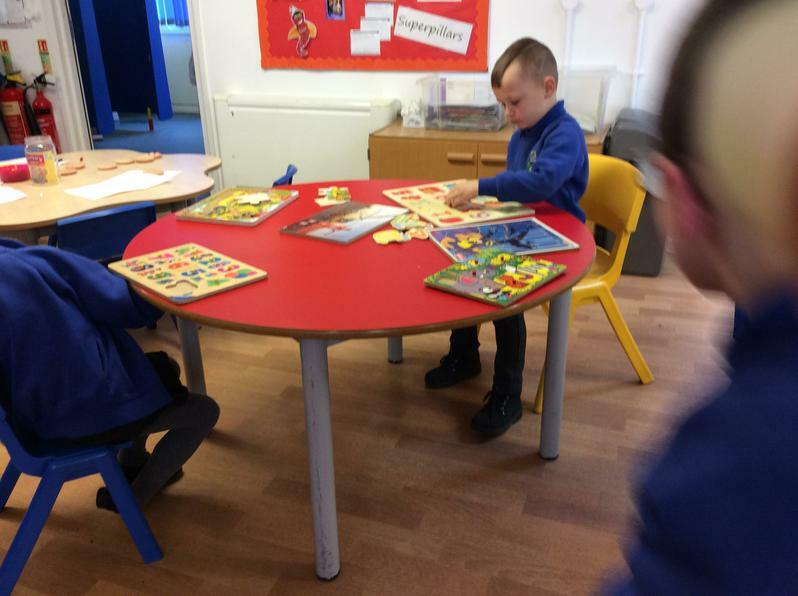 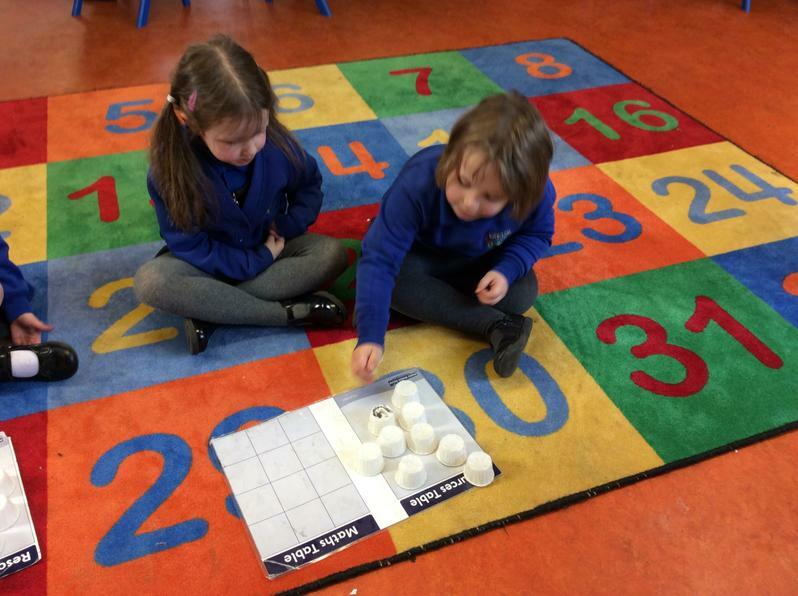 We having been playing Snakes and Ladders; taking turns and practising our counting skills. 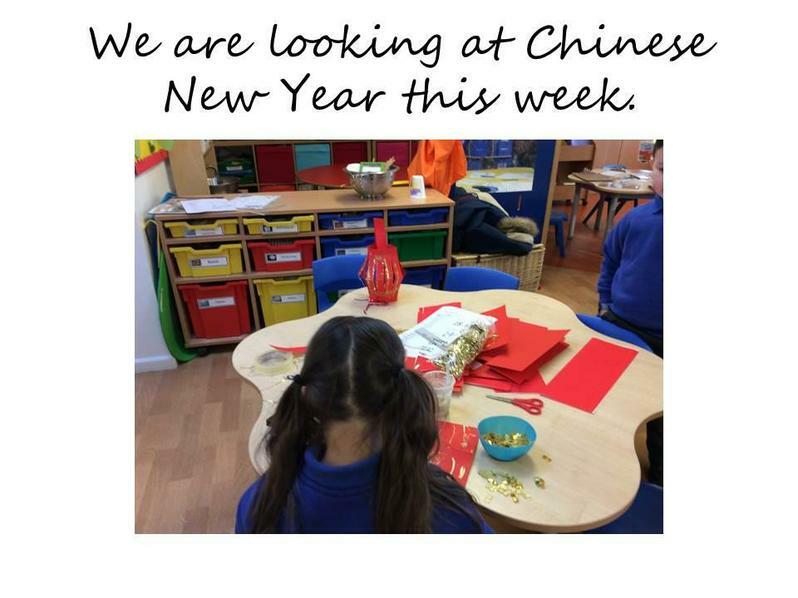 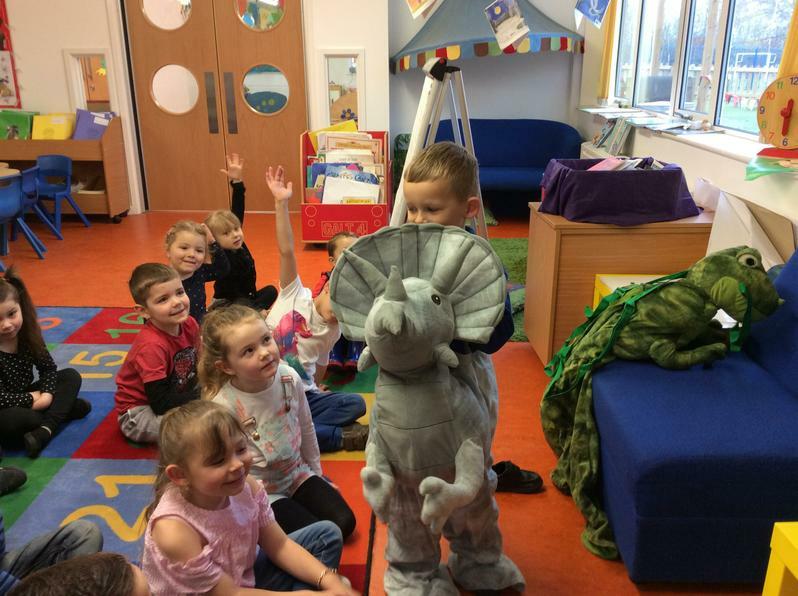 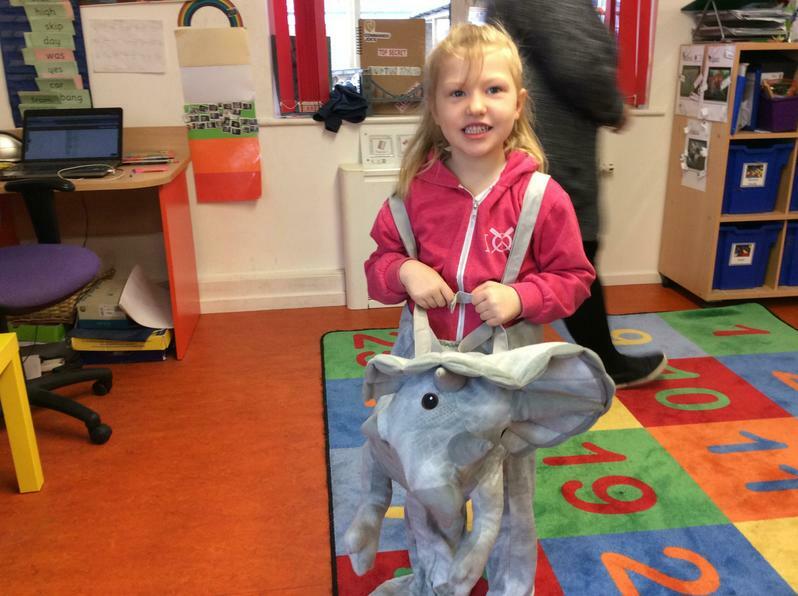 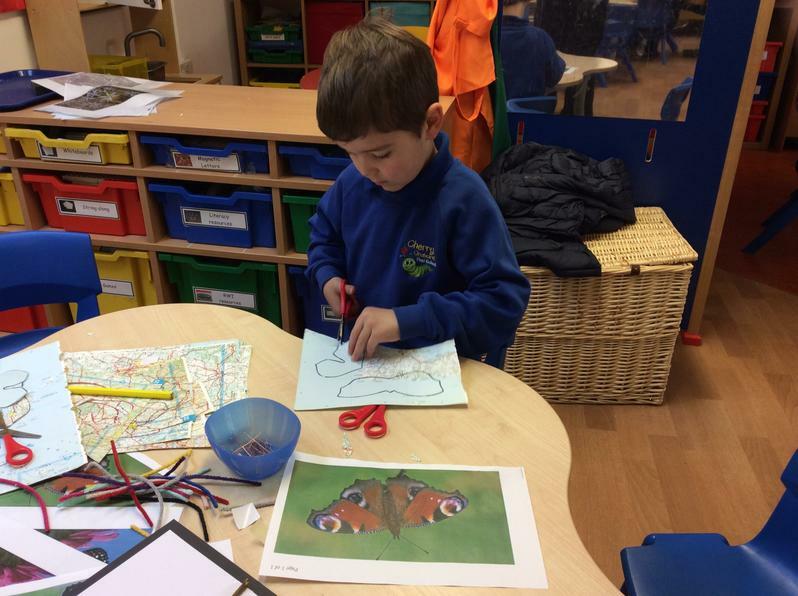 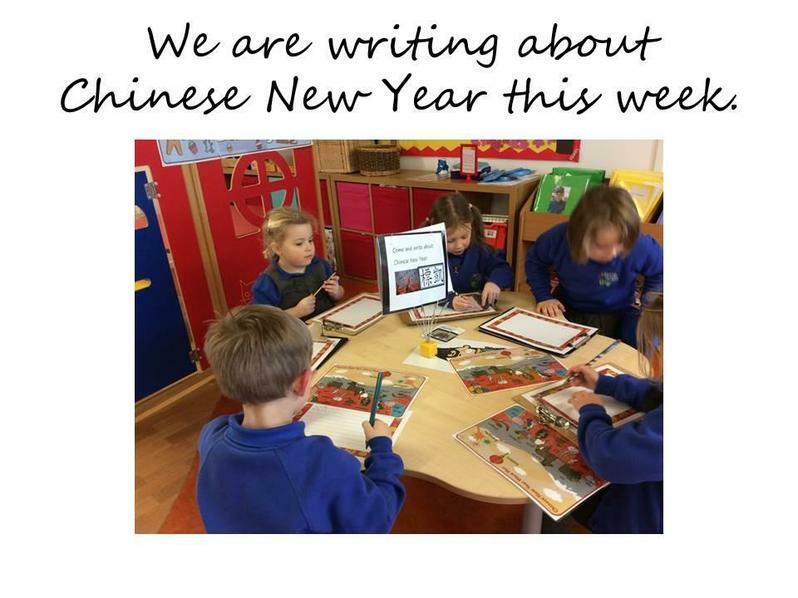 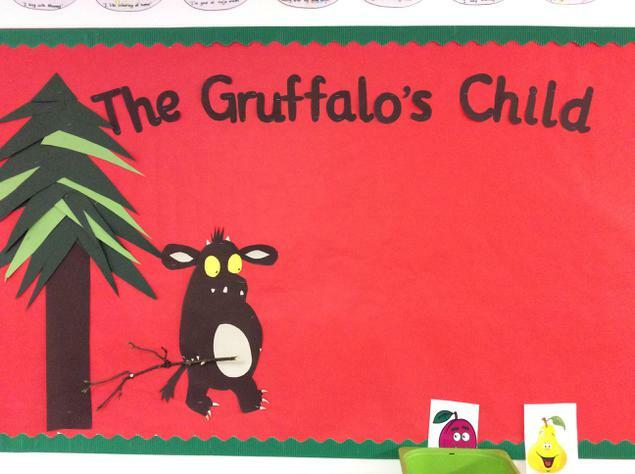 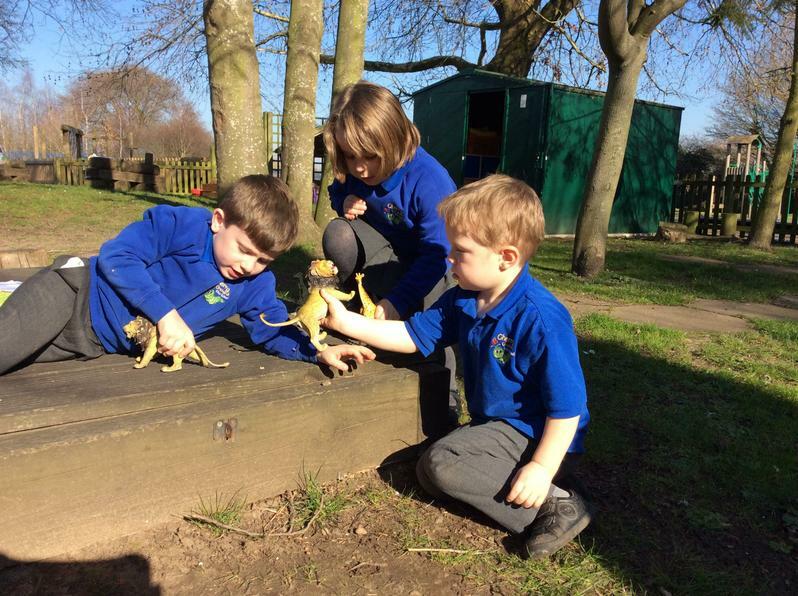 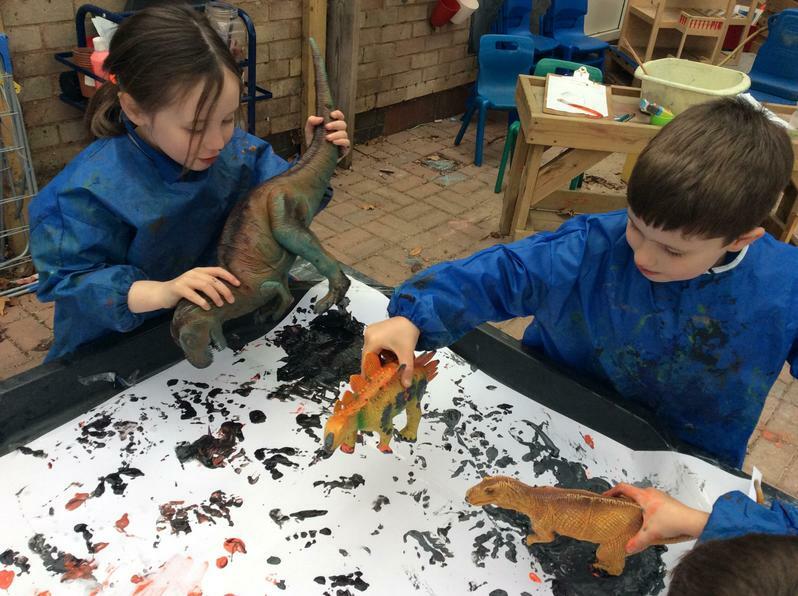 This week(29.1.18) we are looking at animals and their young. 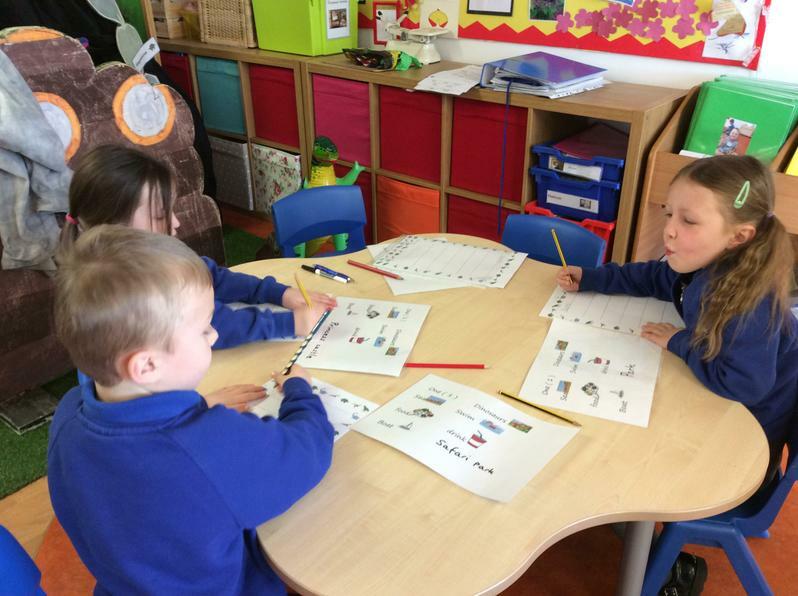 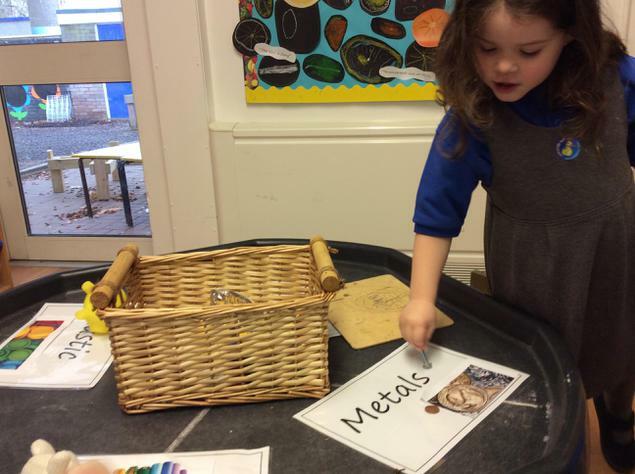 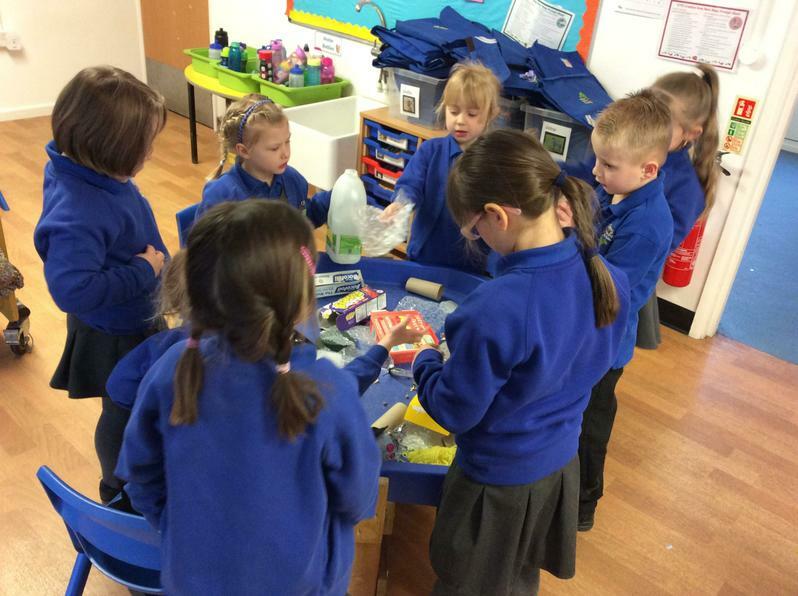 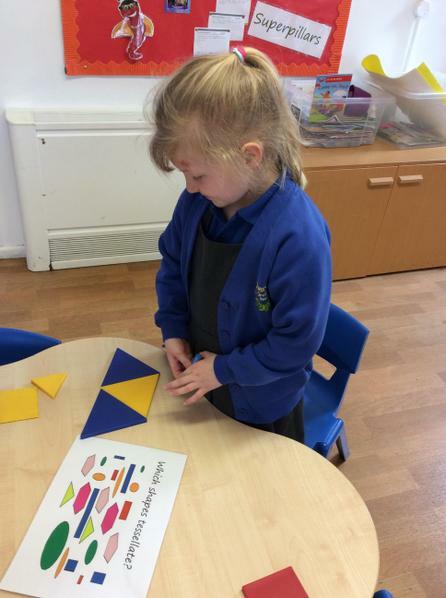 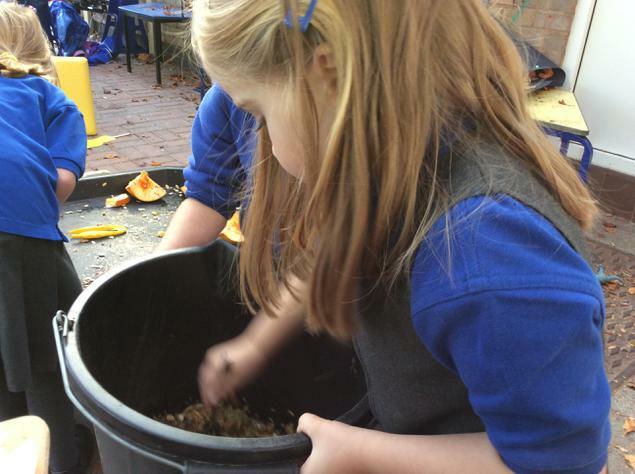 On Thursday we sorted materials into dull and shiny. 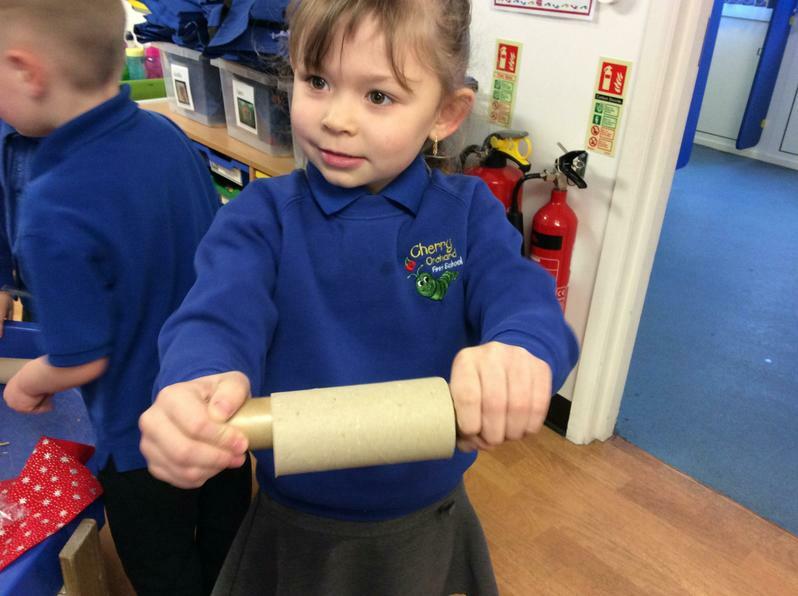 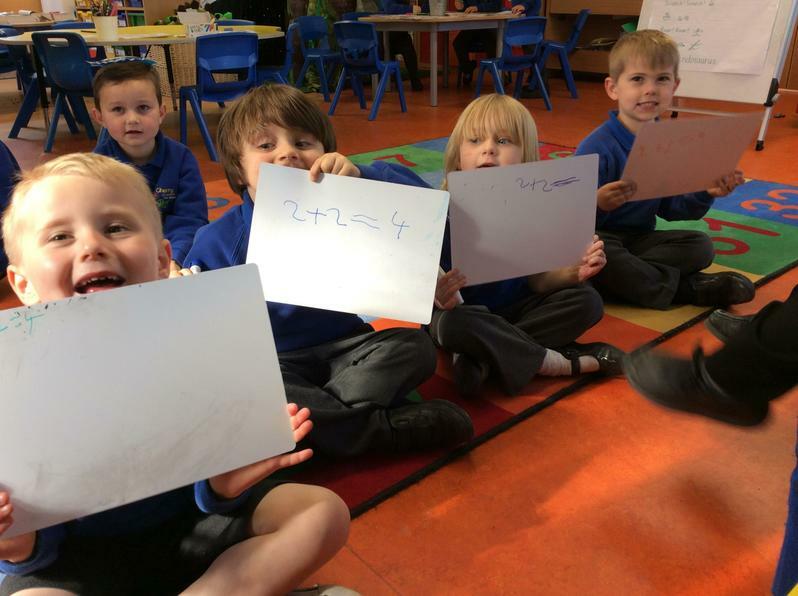 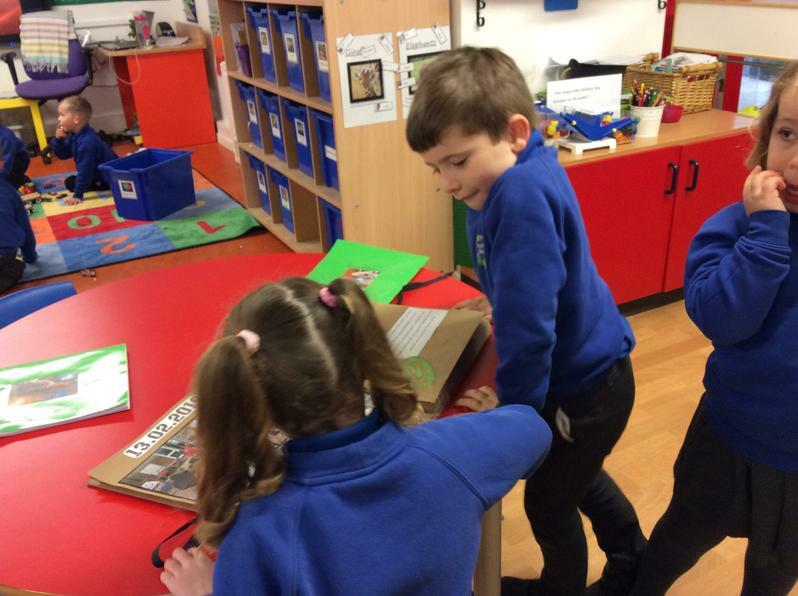 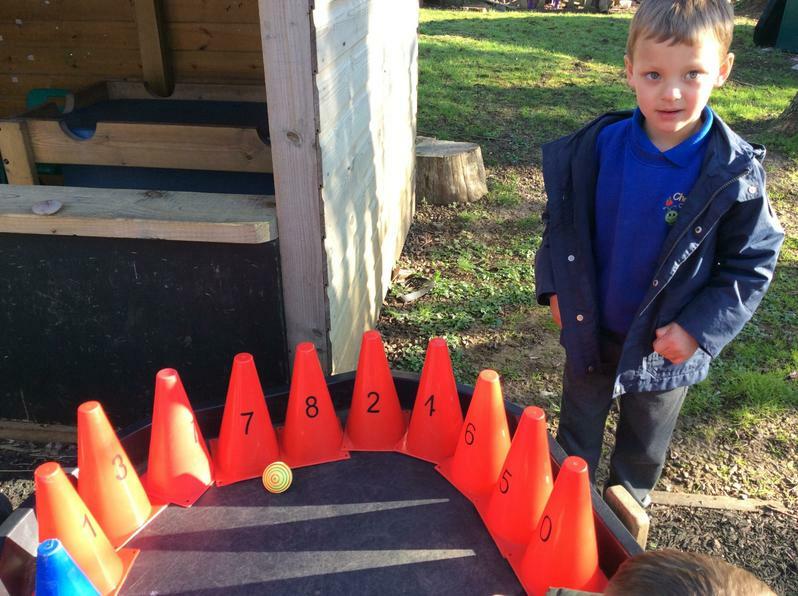 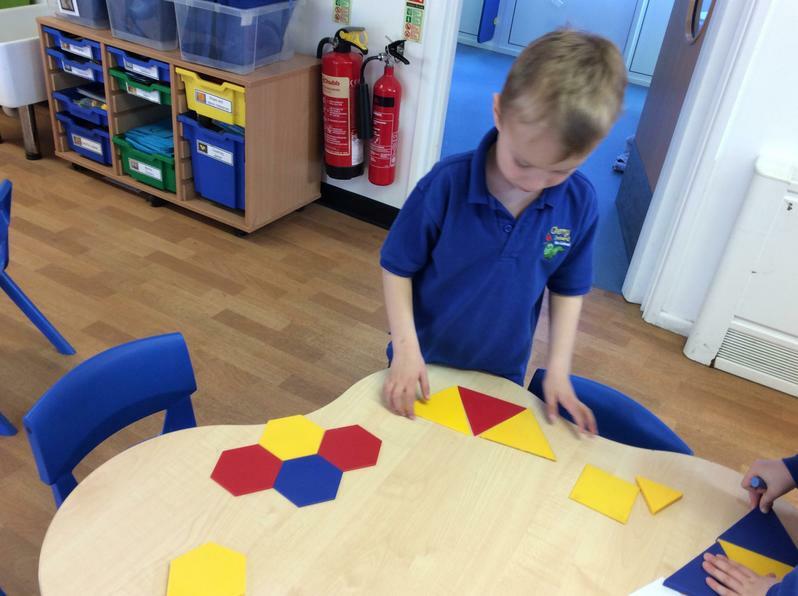 In Maths we found different ways to show 6 by using anything in the classroom. 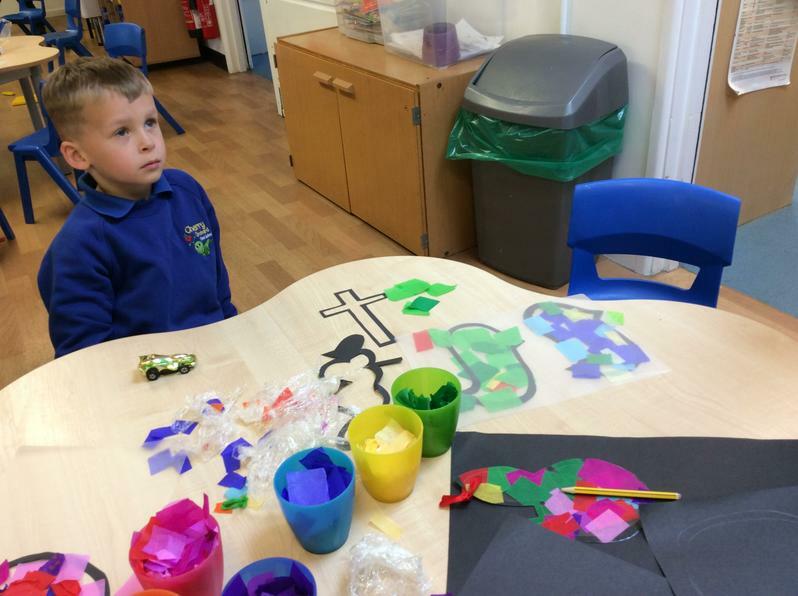 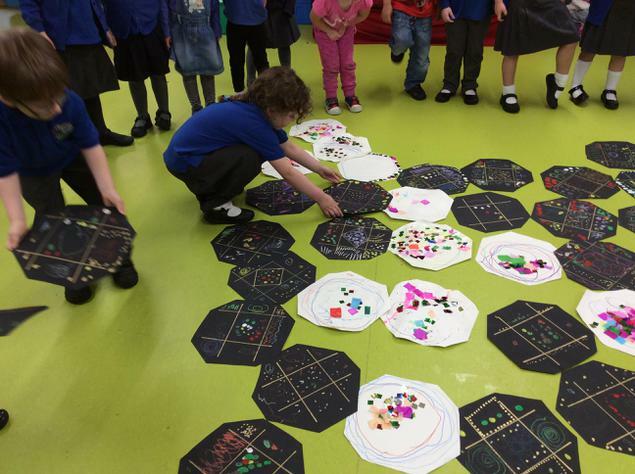 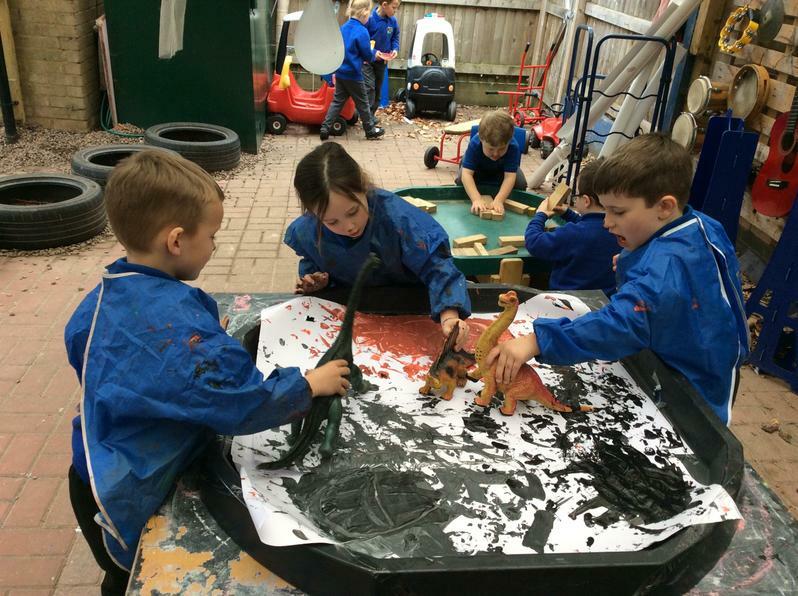 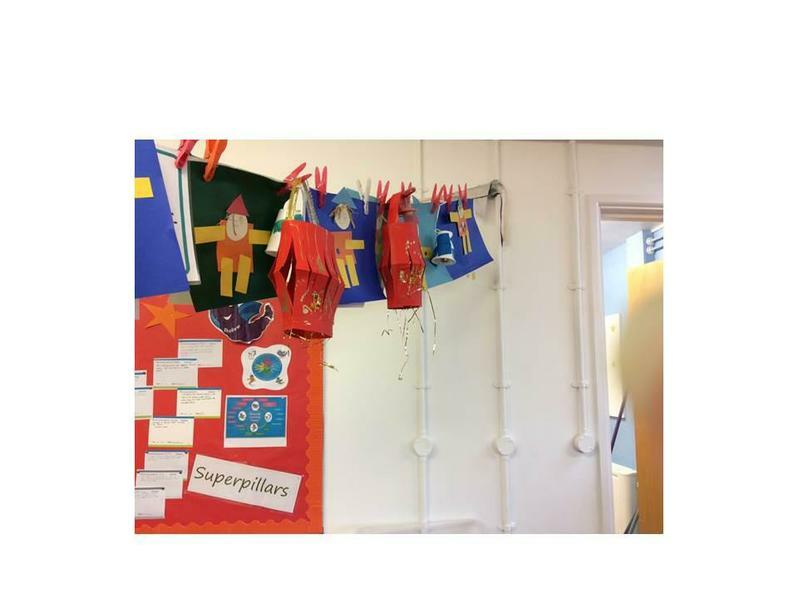 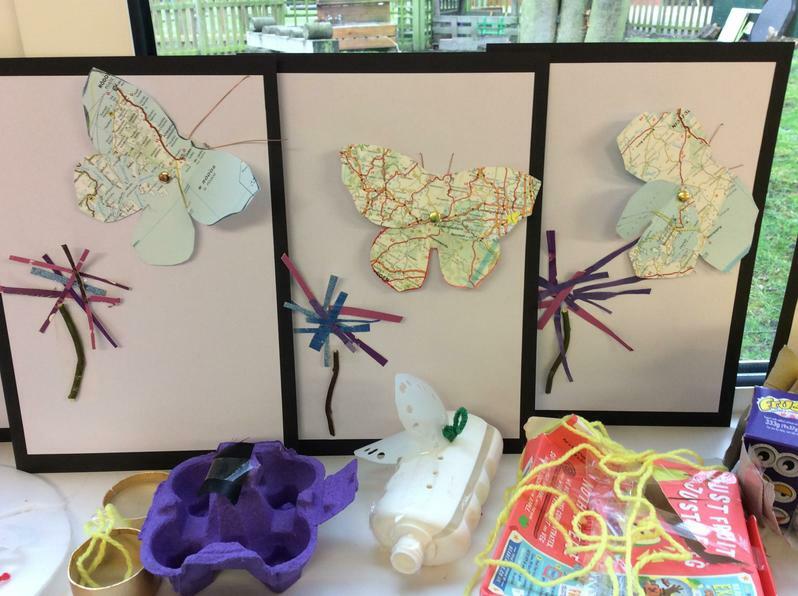 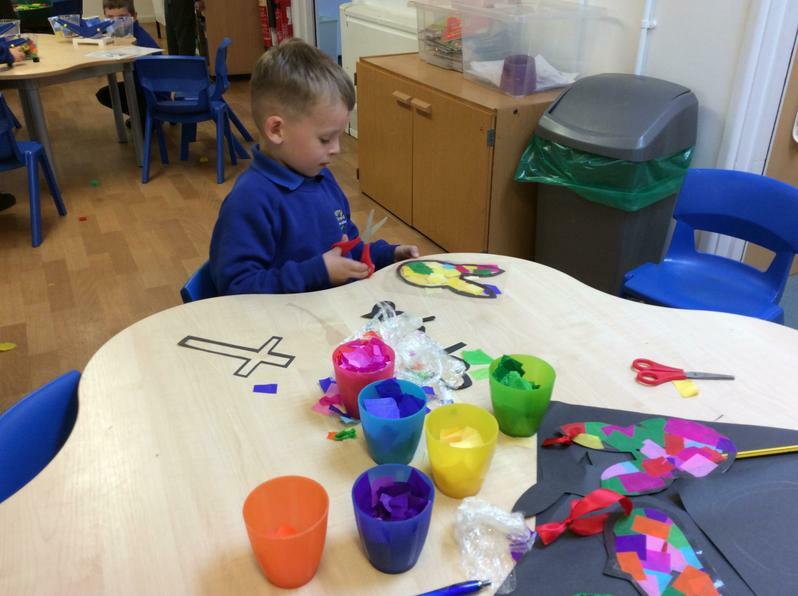 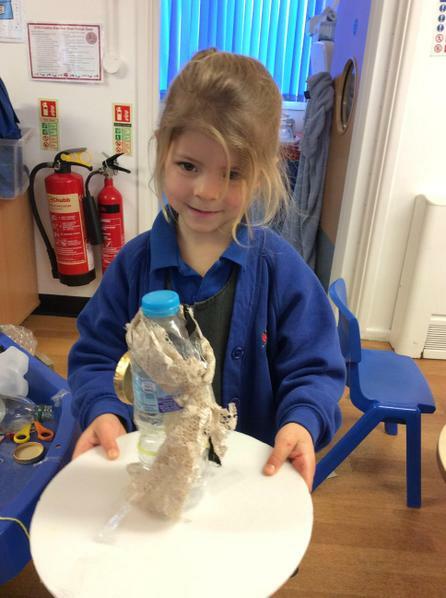 The children made their own rainbow fish. 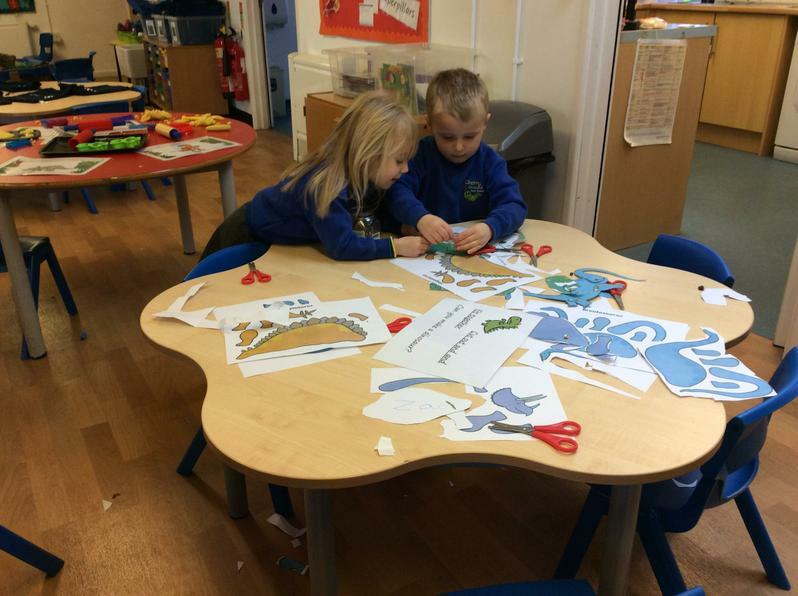 Today we sorted animals into categories including birds, fishes and mammals linked to their characteristics. 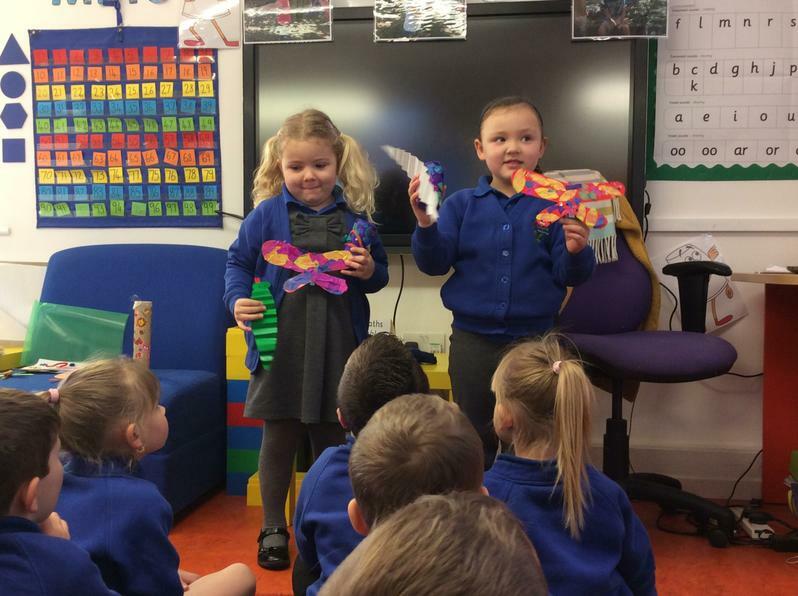 This week we are looking at The Rainbow Fish ( 8.1.18). 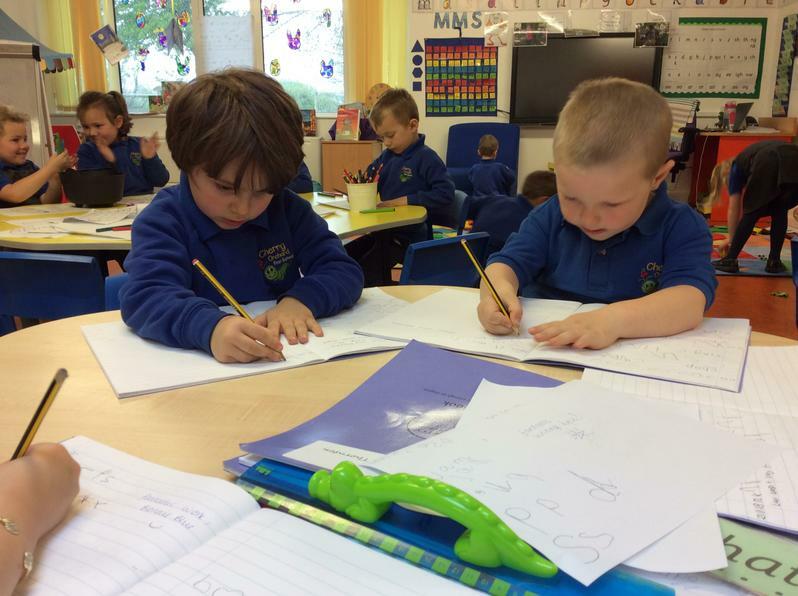 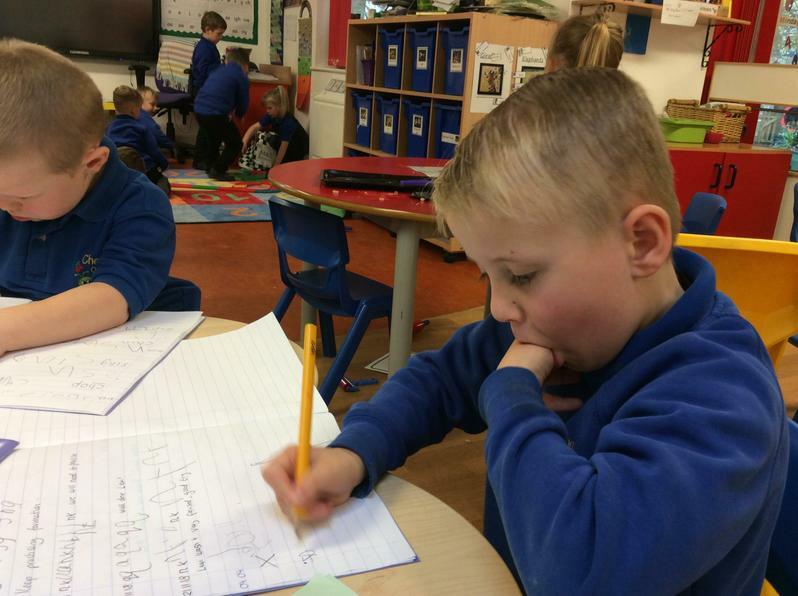 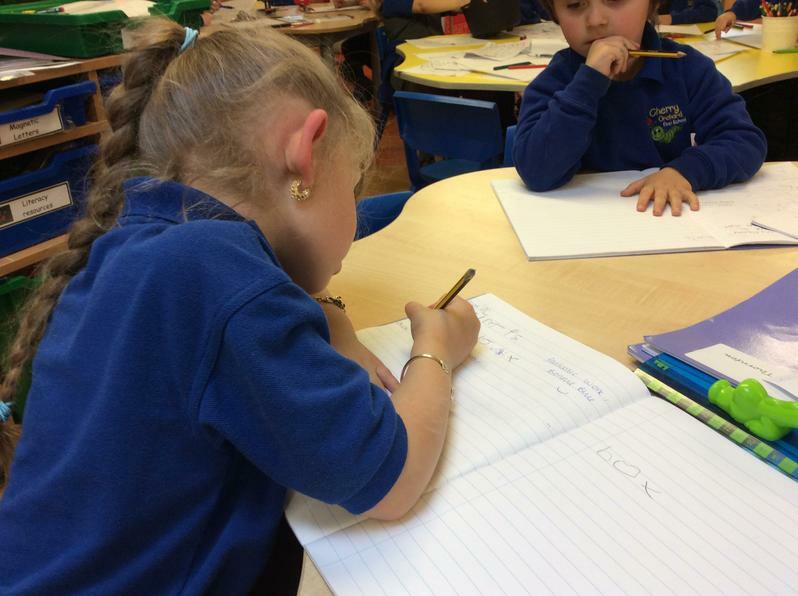 We are writing and learning a story map for it. 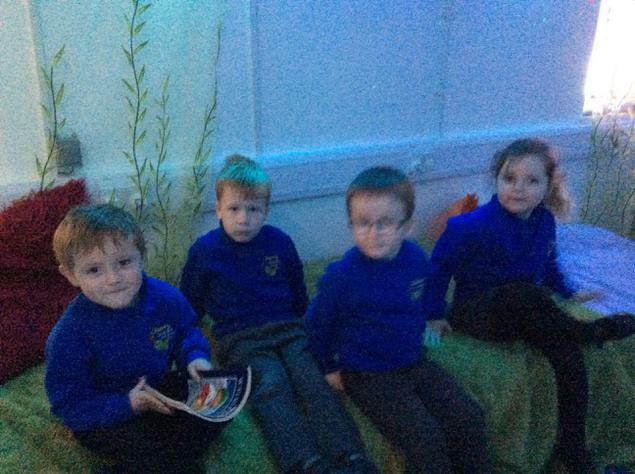 On Wednesday we visited the library and sang Christmas songs and listened to Christmas stories. 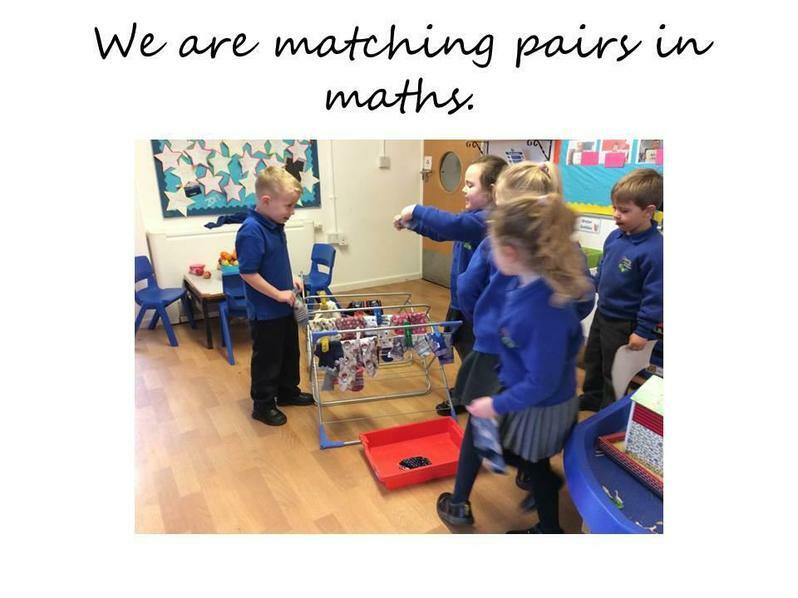 This week is Science week( 3.12.17) and we have been looking at materials and sorting them. 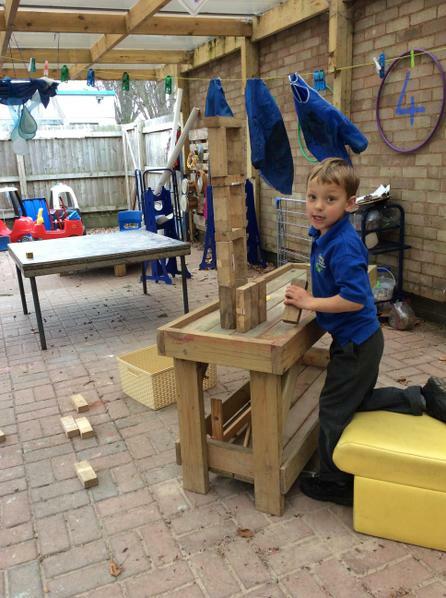 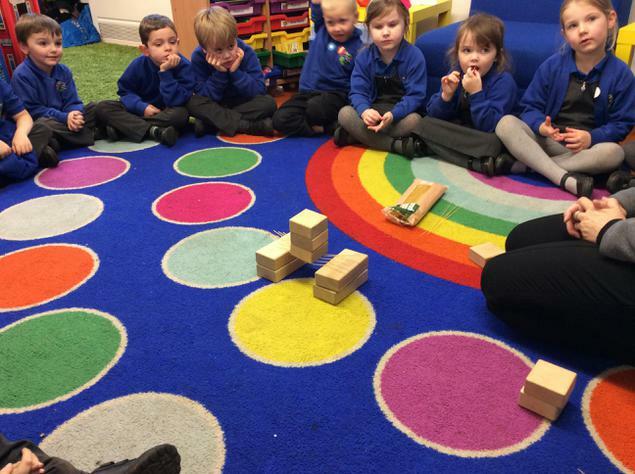 We then conducted an experiment to see how many blocks spaghetti can hold. 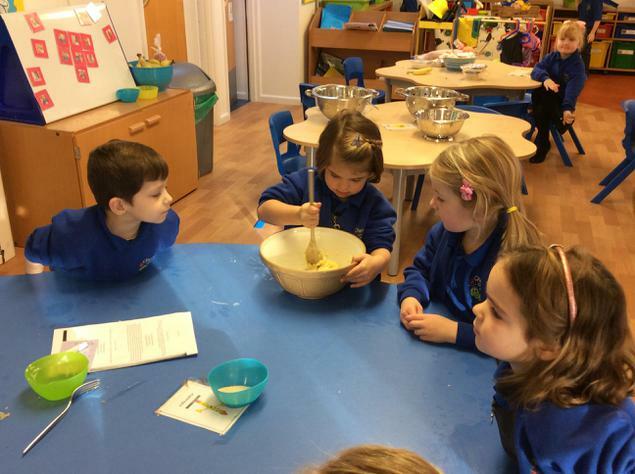 We started off with 5 pieces and then tested 10 pieces of spaghetti . 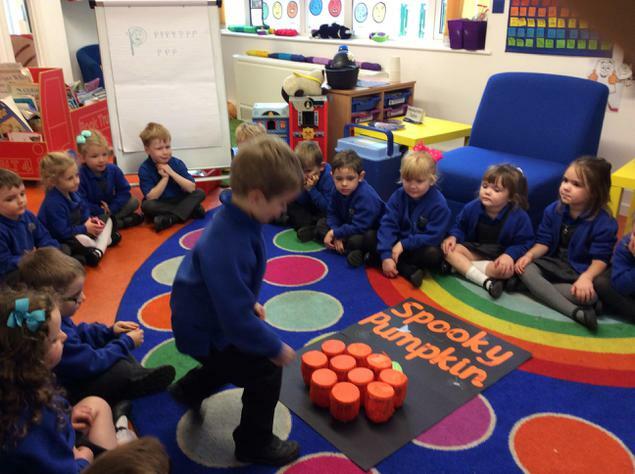 We guessed how many blocks each time. 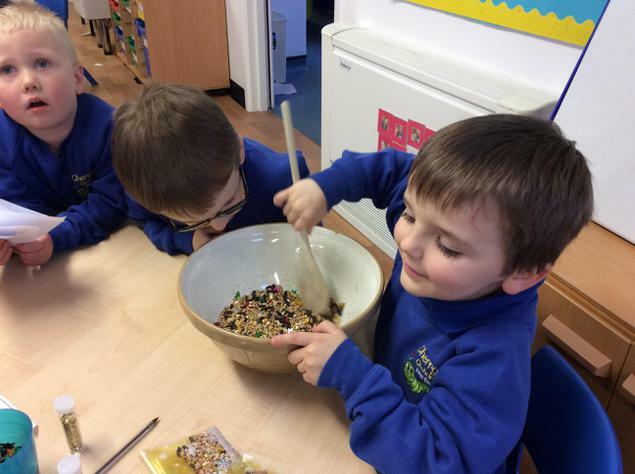 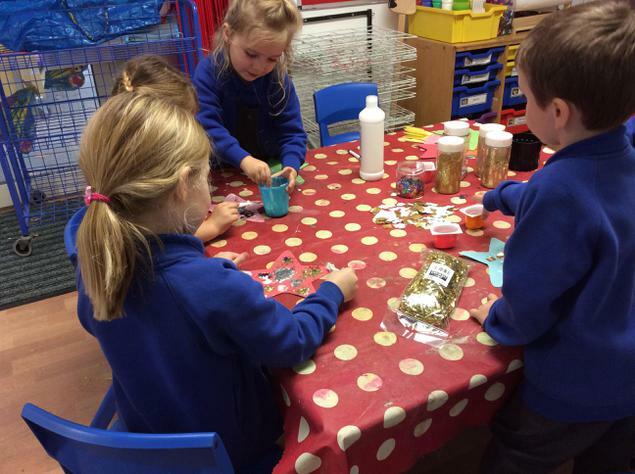 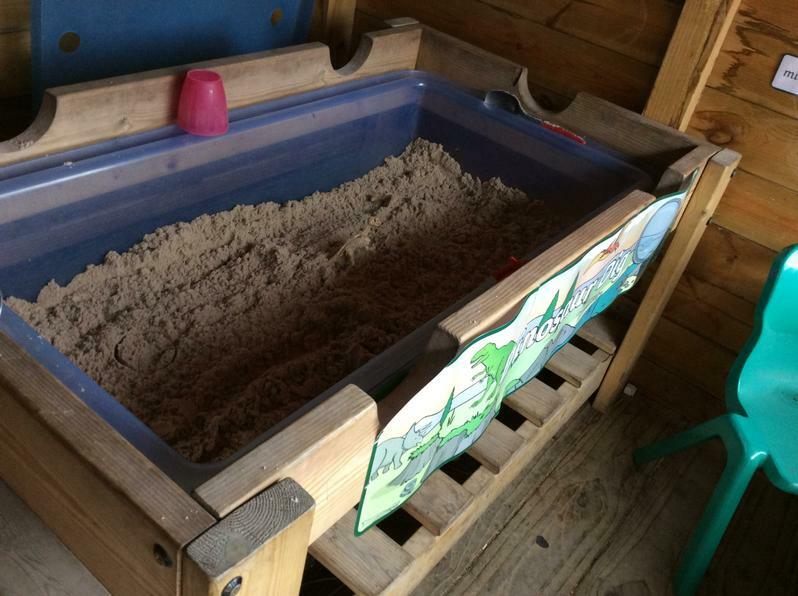 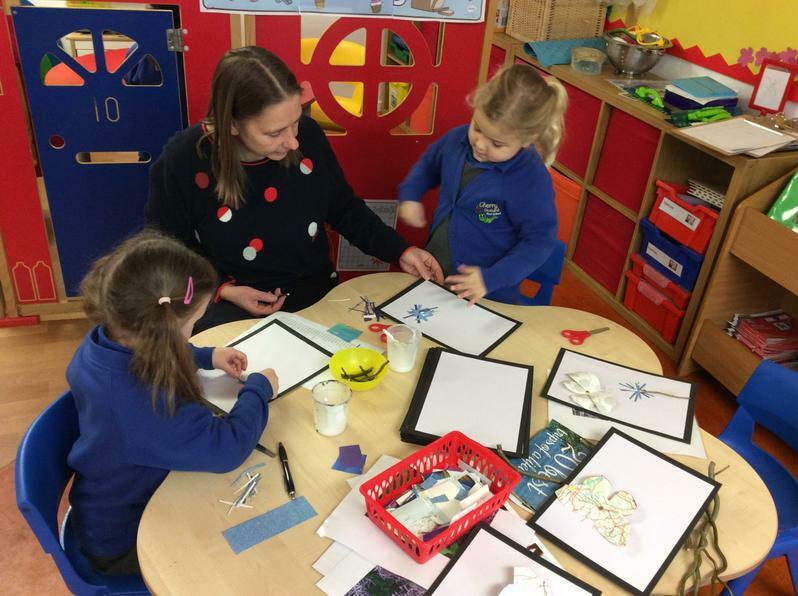 We have made some magical reindeer food for the Christmas Fair. 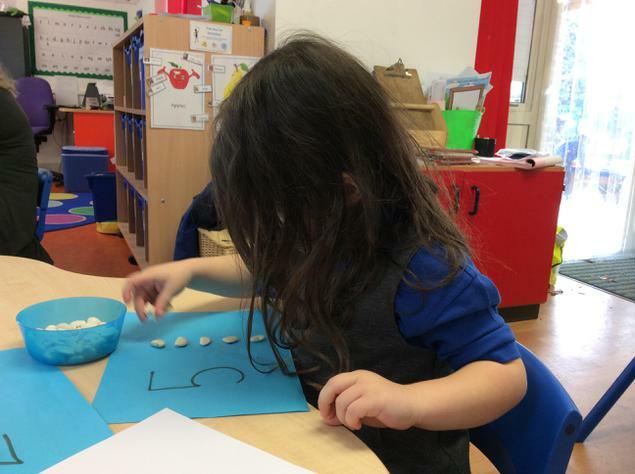 with number and looking and more and less than a number. 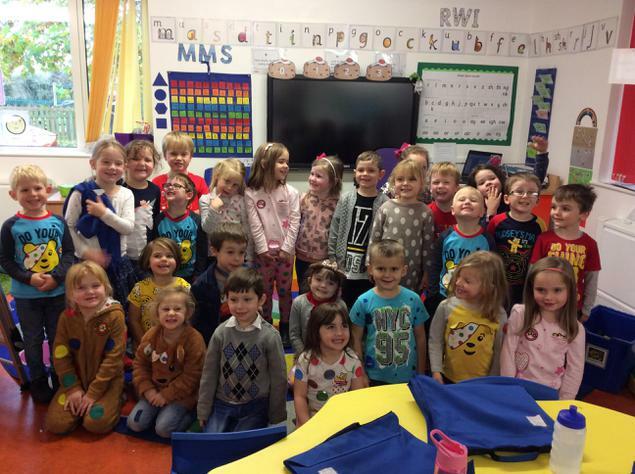 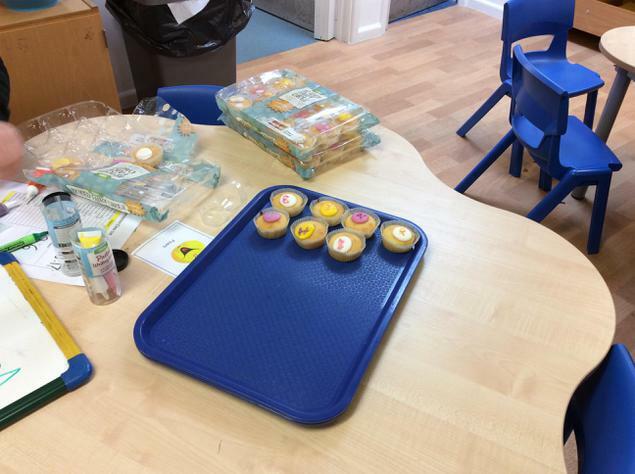 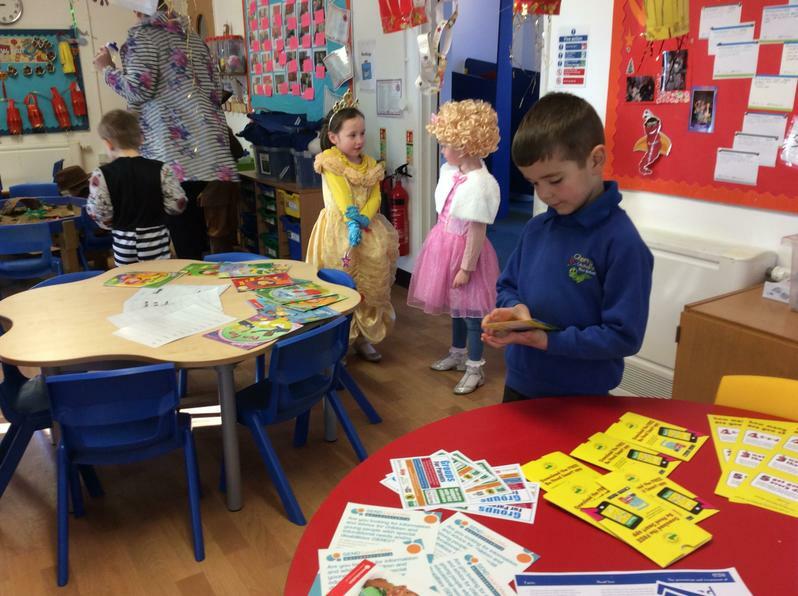 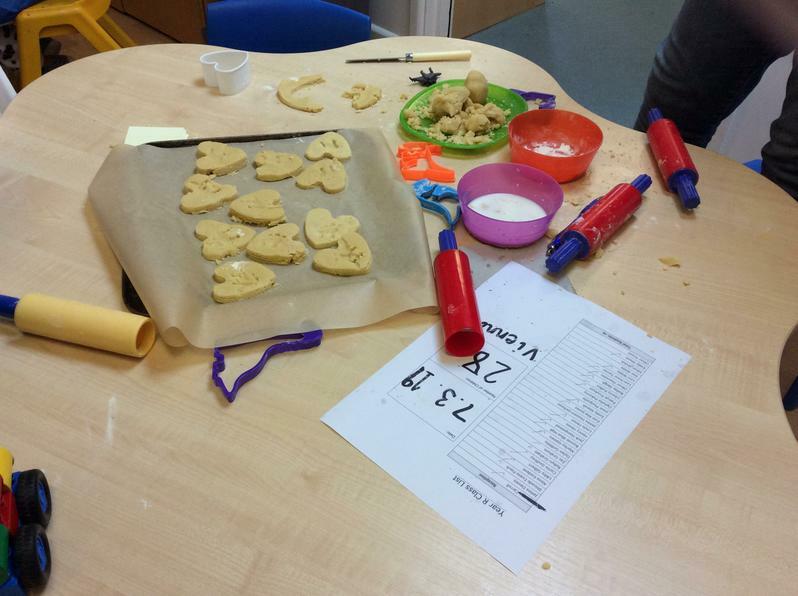 We had great fun on Children in Need day and we raised over 30 pounds from our biscuit sale. 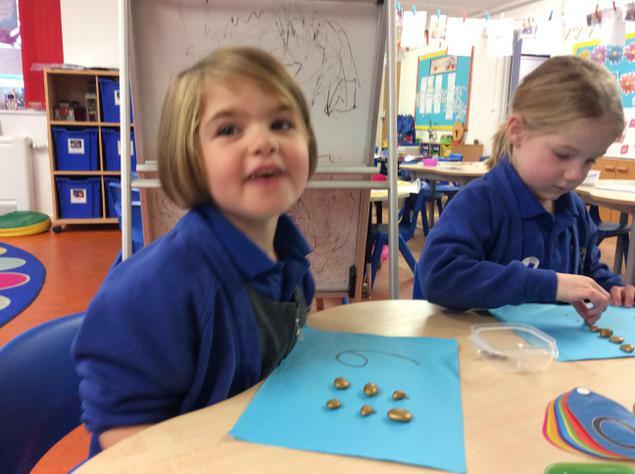 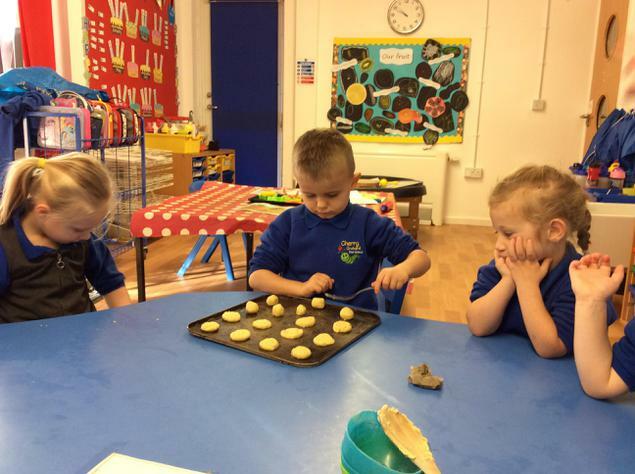 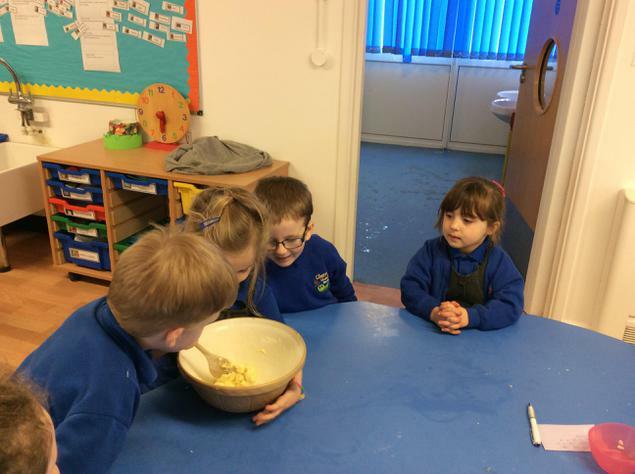 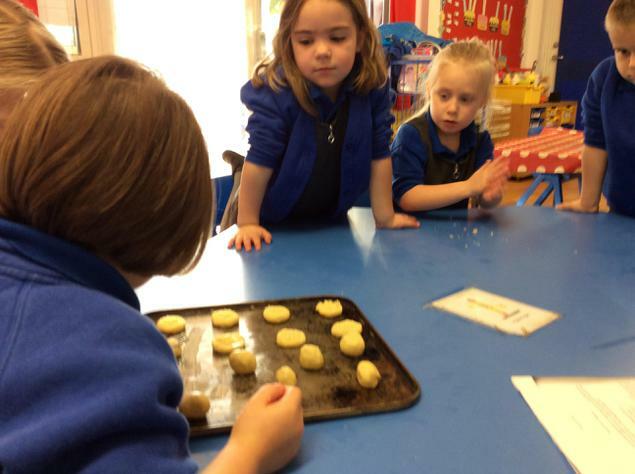 On Thursday we made the biscuit mix and then cooked it ready for icing on Friday. 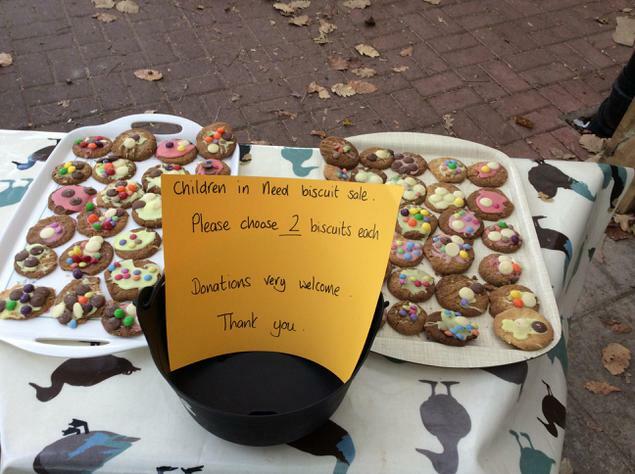 We are selling the biscuits to raise money for Children in Need. 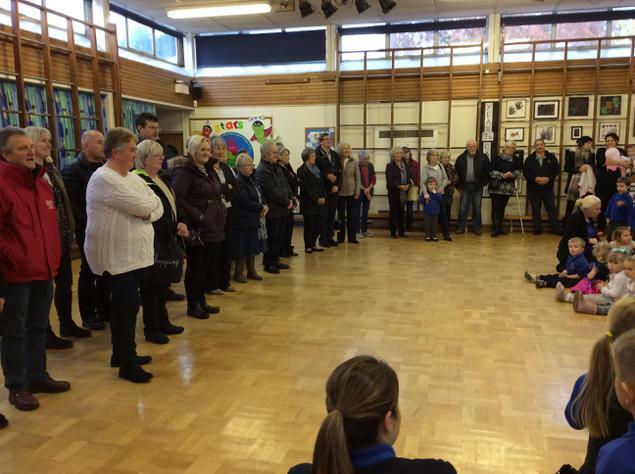 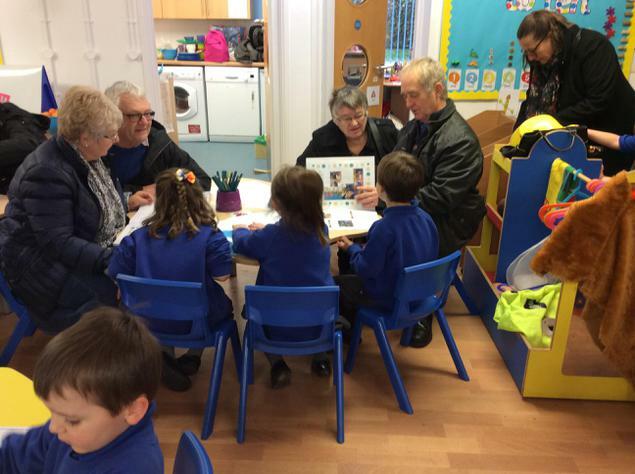 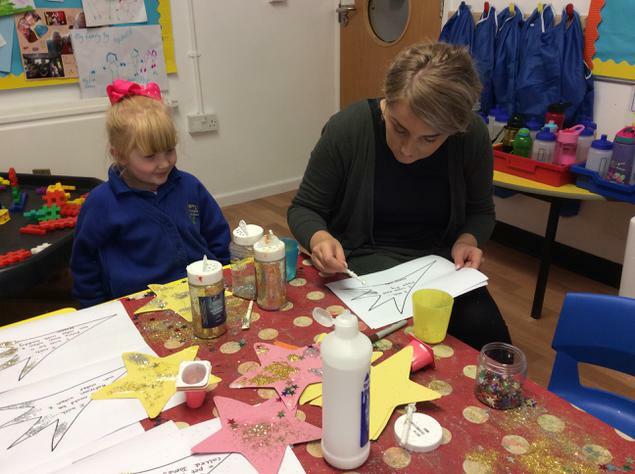 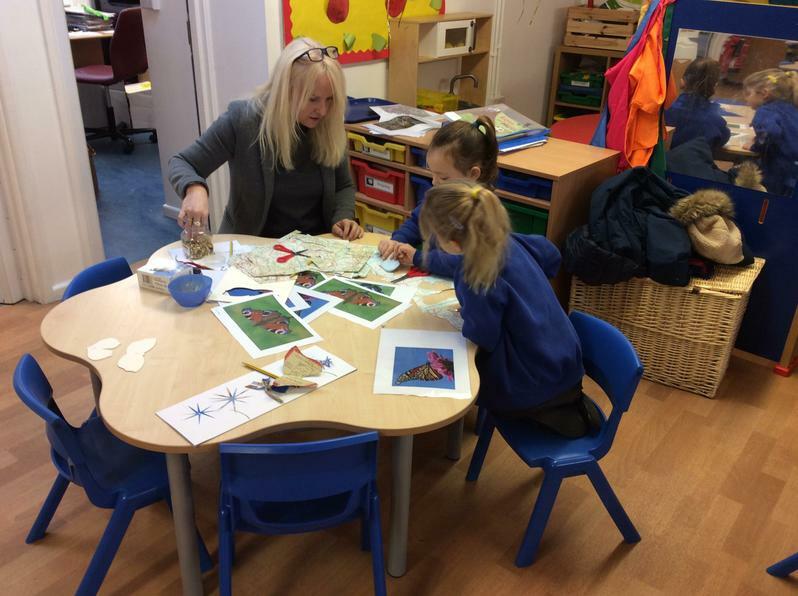 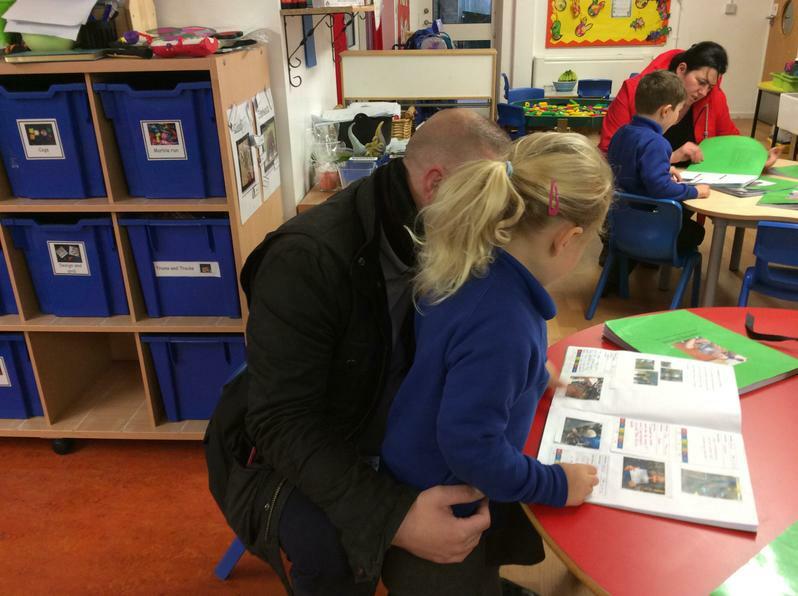 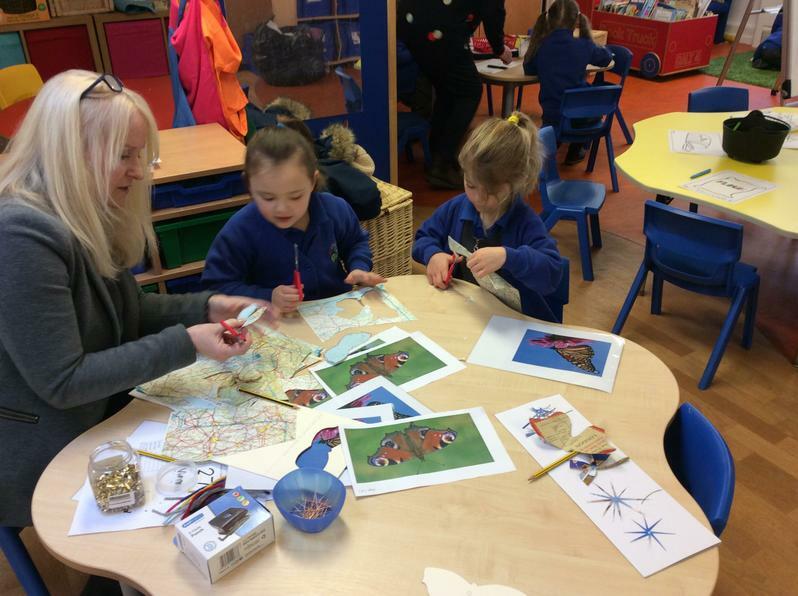 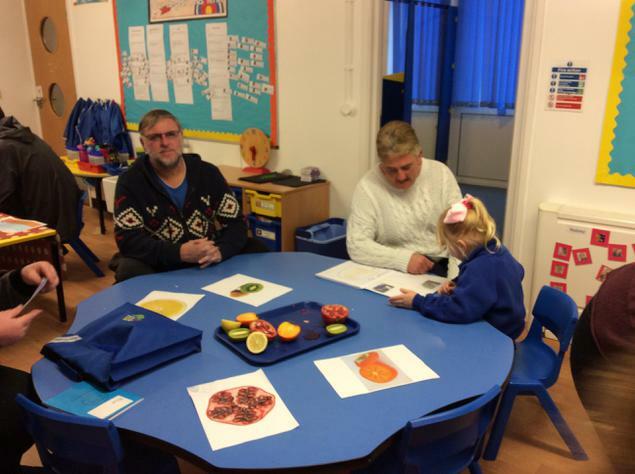 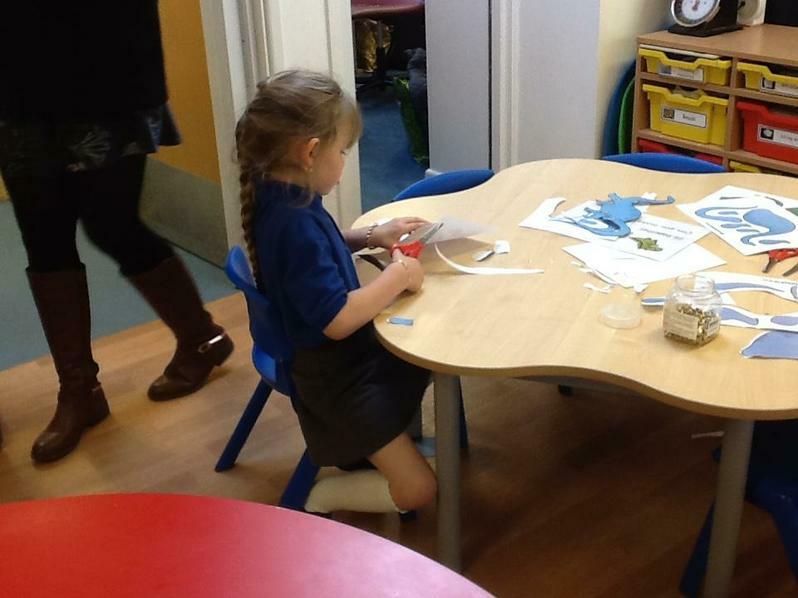 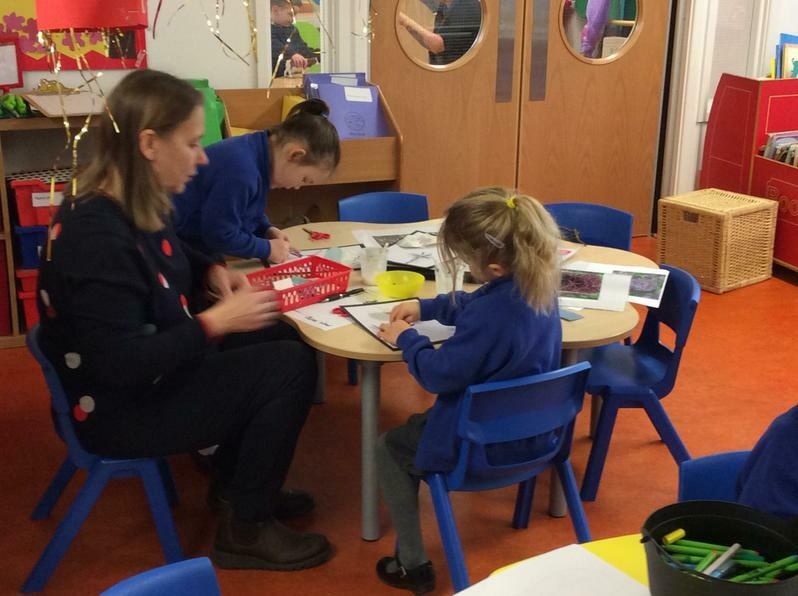 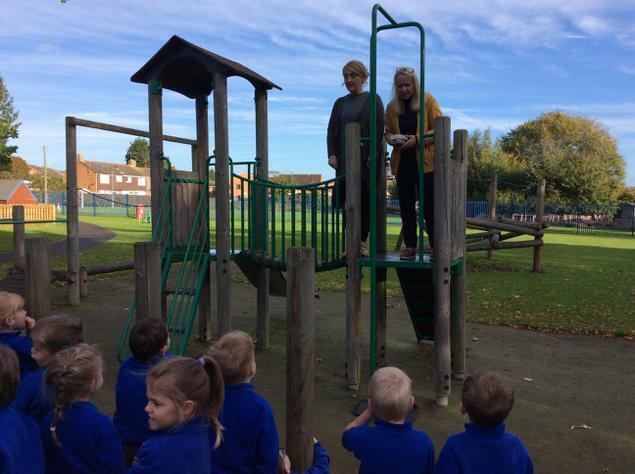 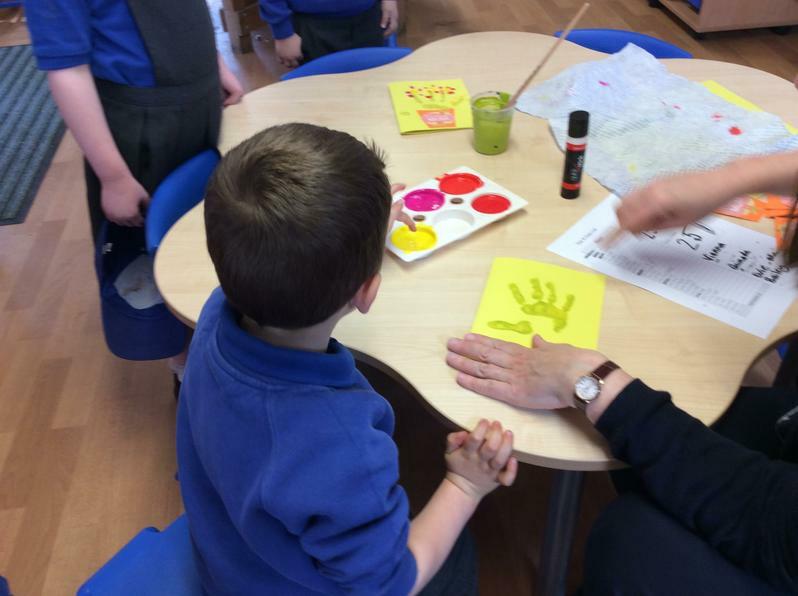 Thank you to all the grandparents who came to our Grandparents afternoon on Tuesday 14th November. 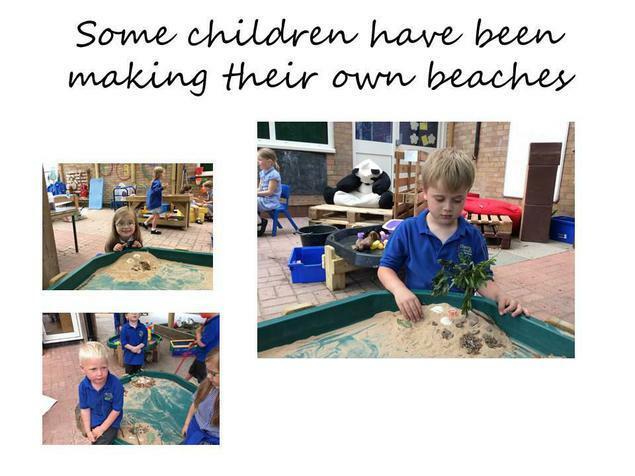 The children loved sharing their learning experiences and successes. 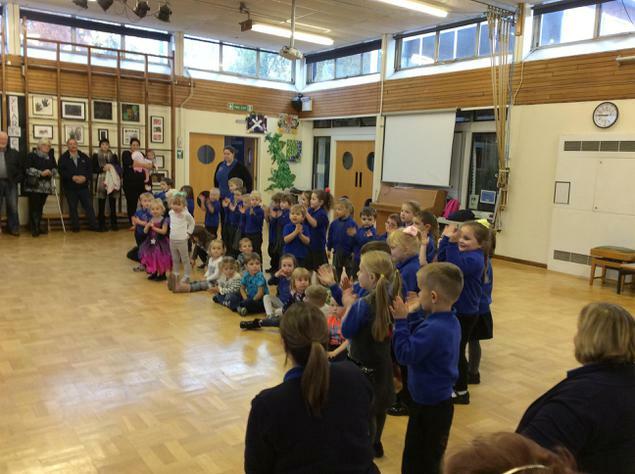 They also loved singing their special songs for them at the end . 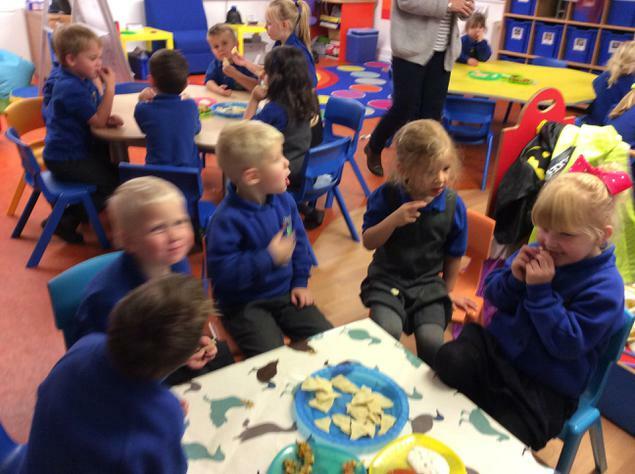 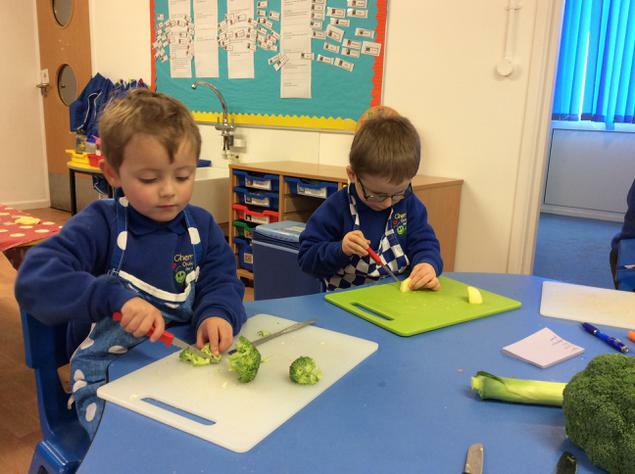 This week ( 13.11.17)we are continuing with Oliver's Vegetables but expanding onto Oliver's Fruit salad. 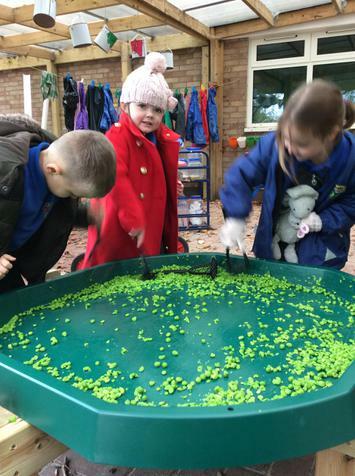 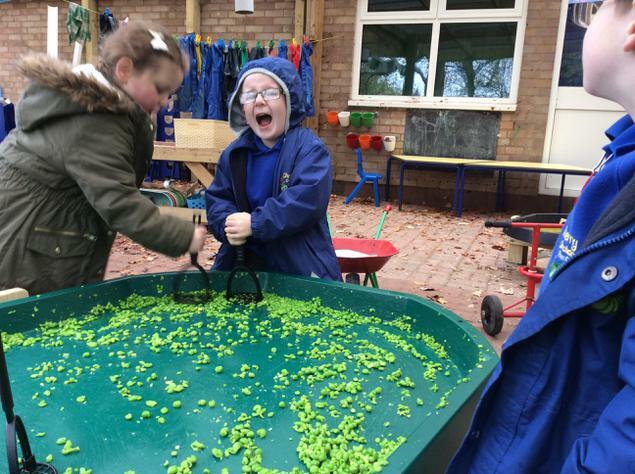 We enjoyed mashing the evil peas. 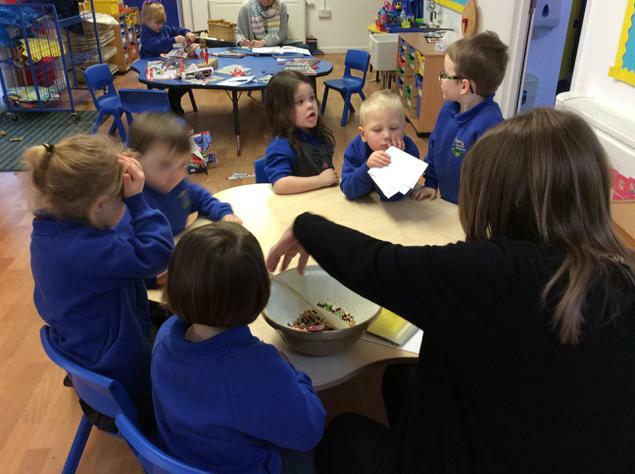 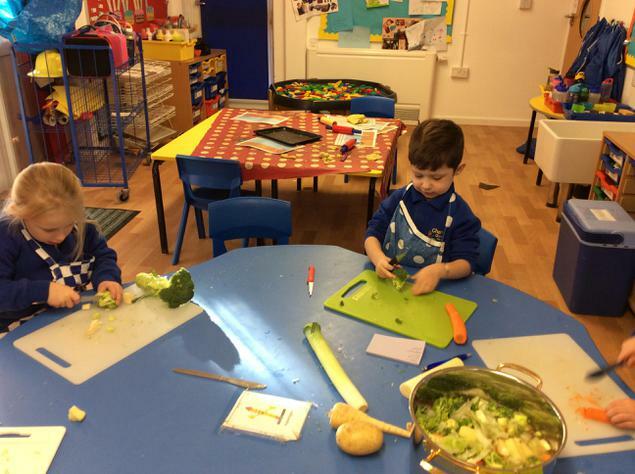 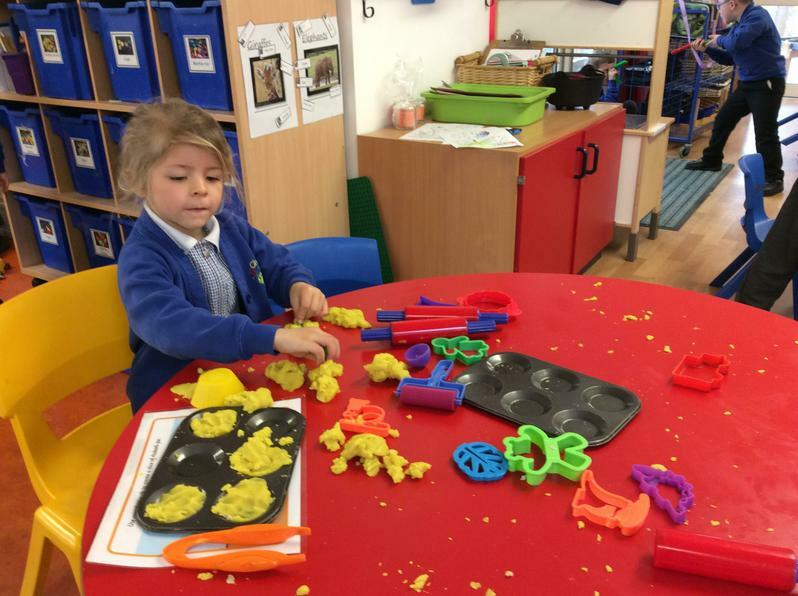 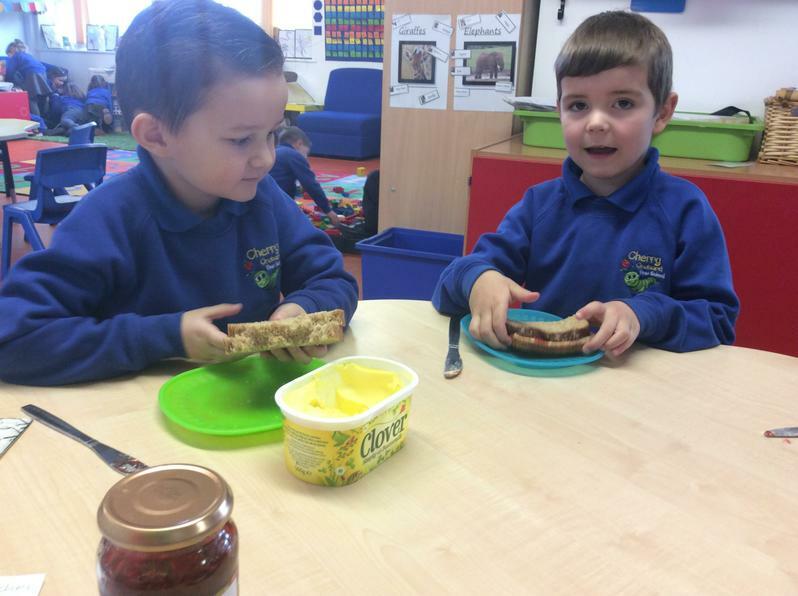 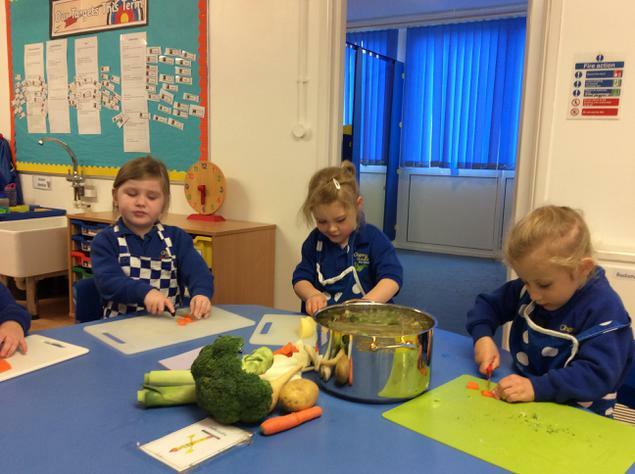 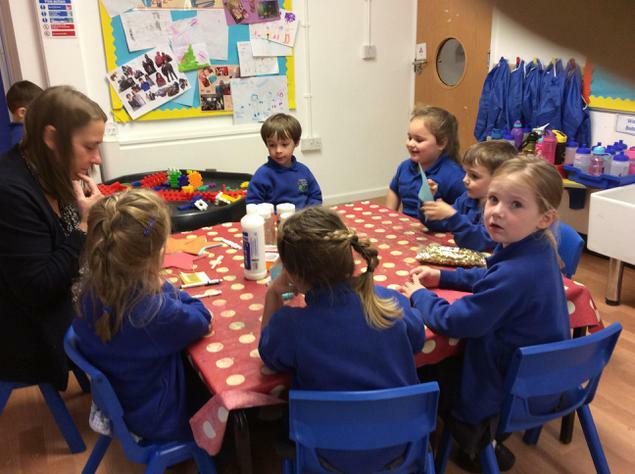 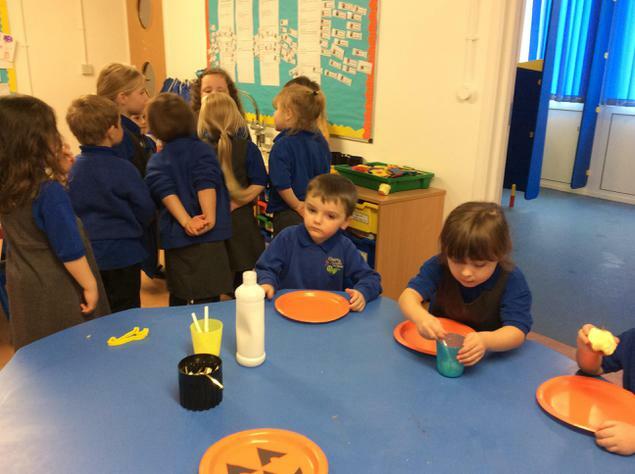 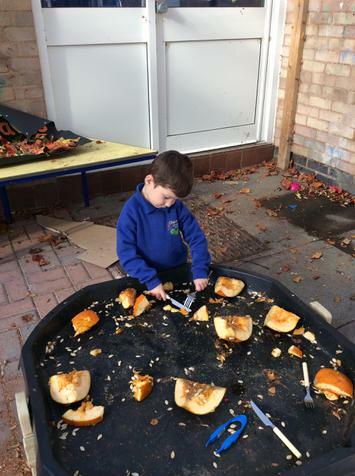 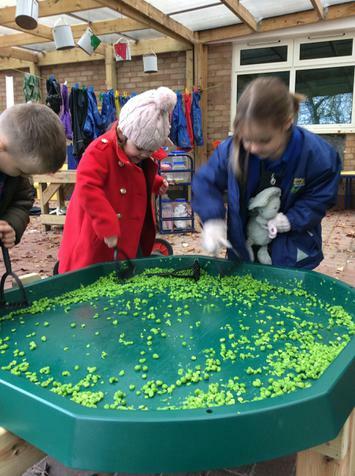 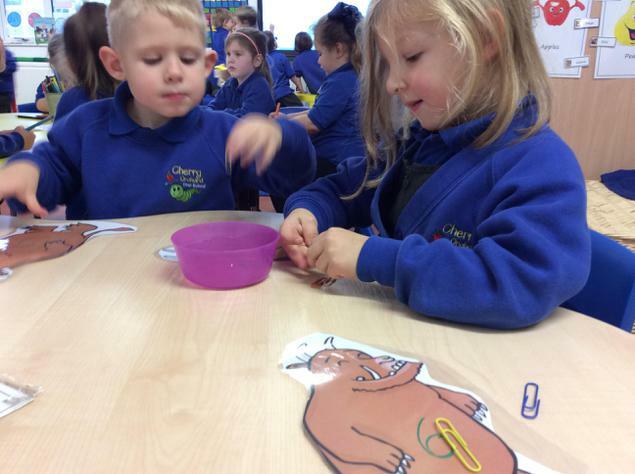 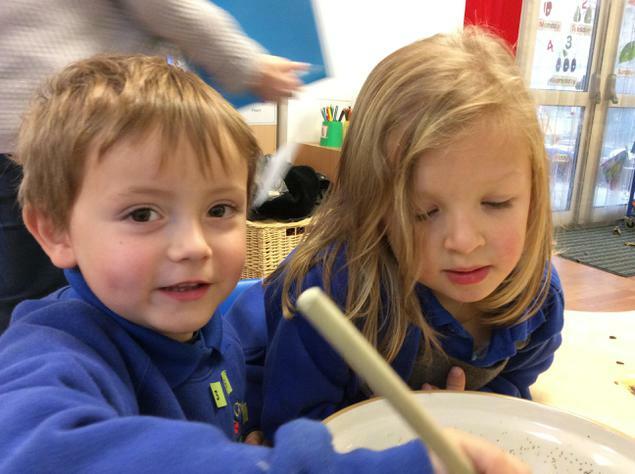 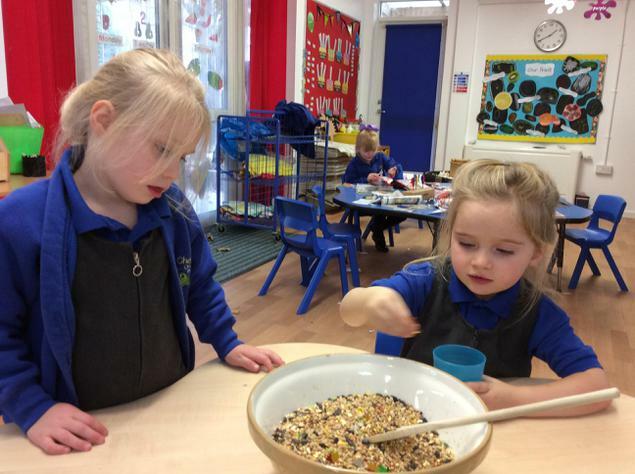 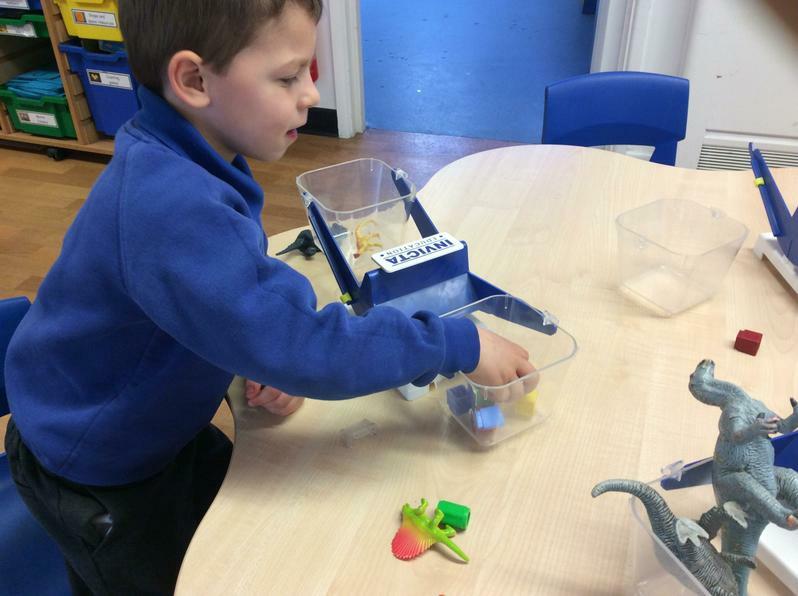 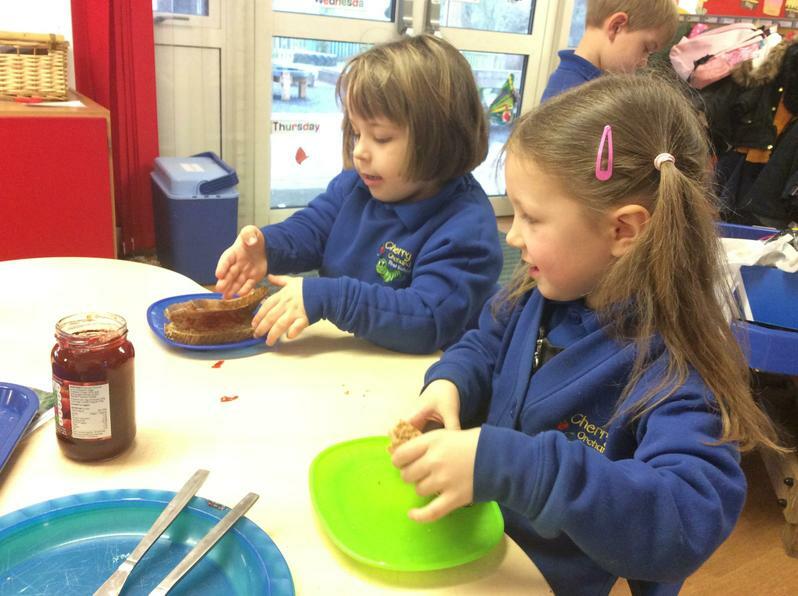 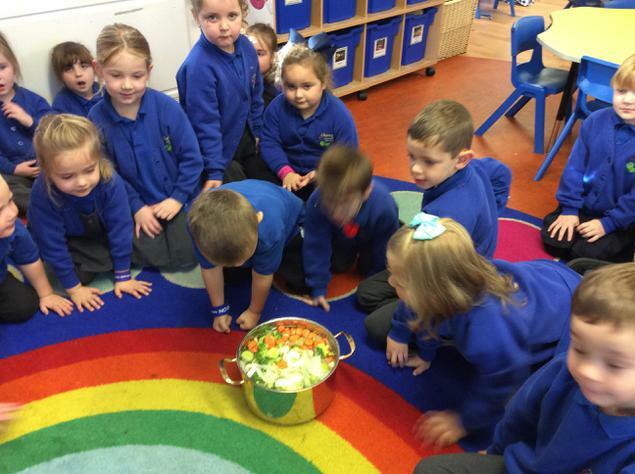 This week we made vegetable soup linking to Oliver's Vegetables. 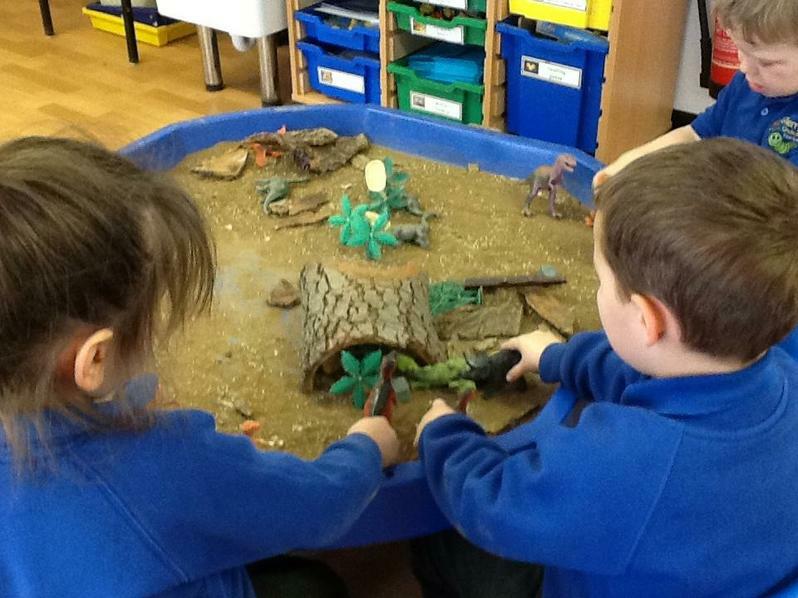 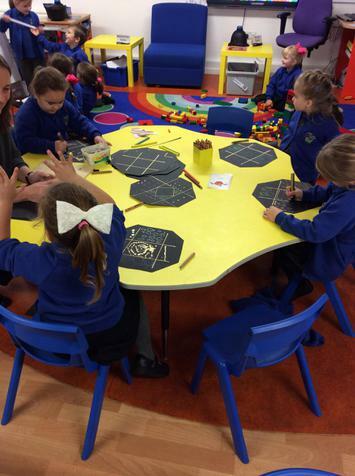 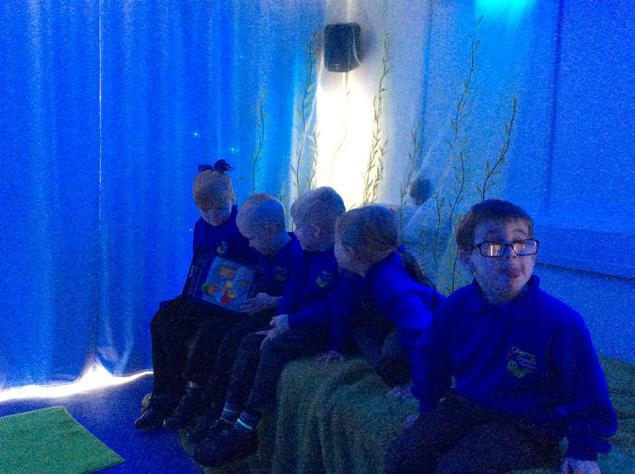 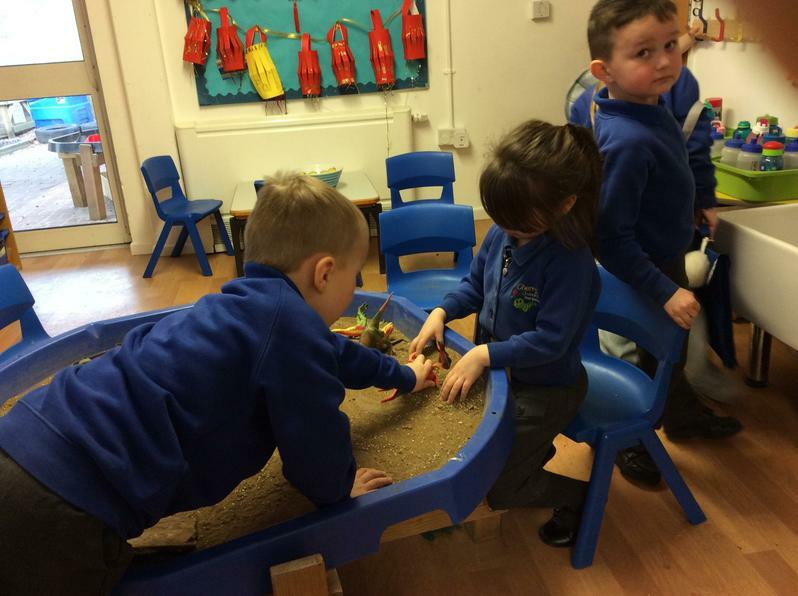 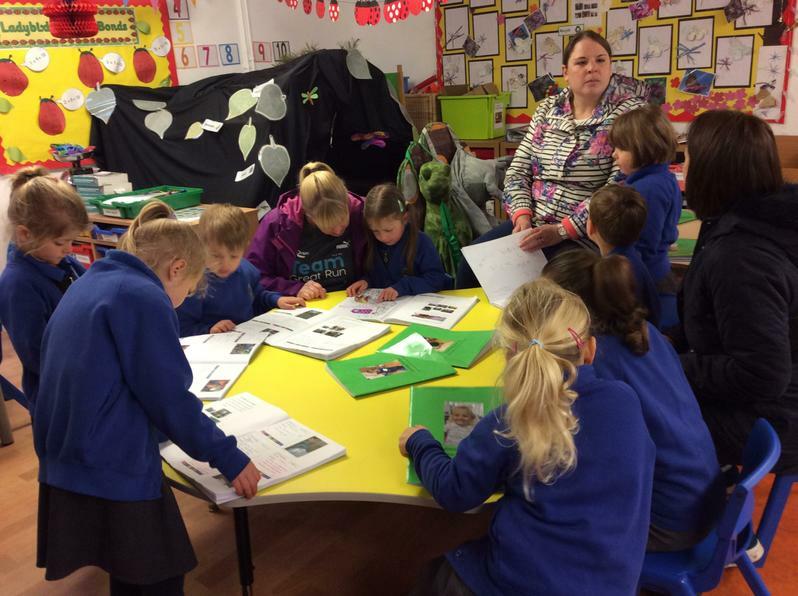 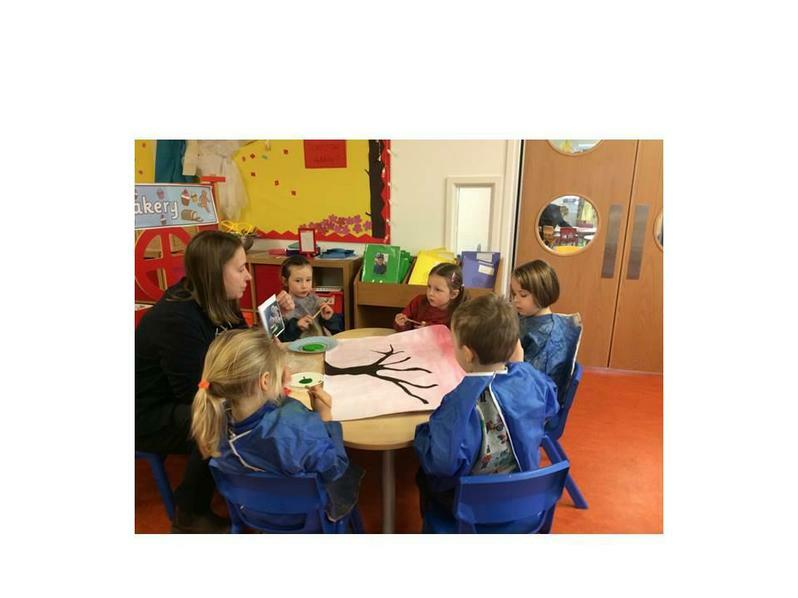 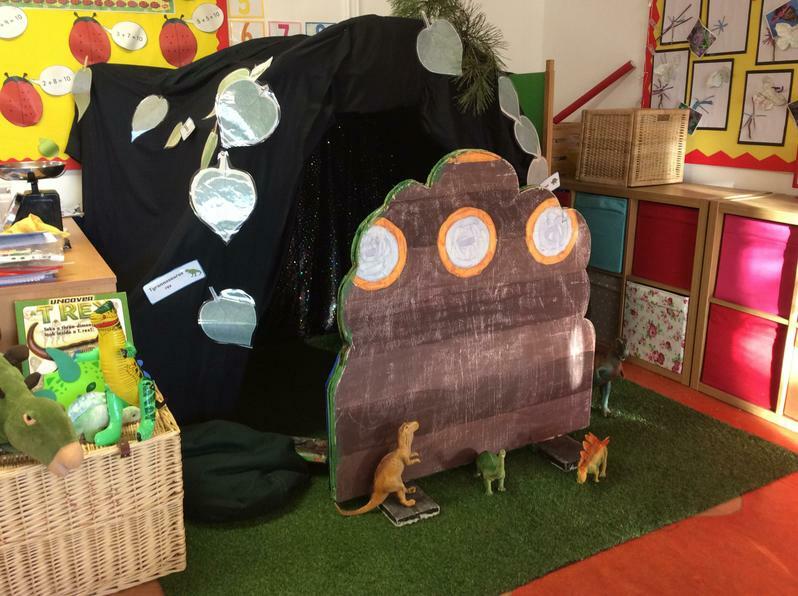 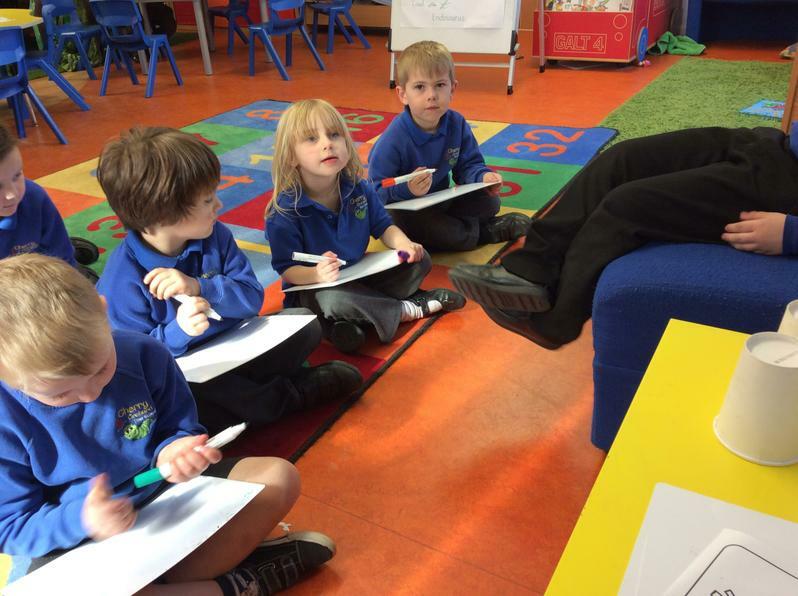 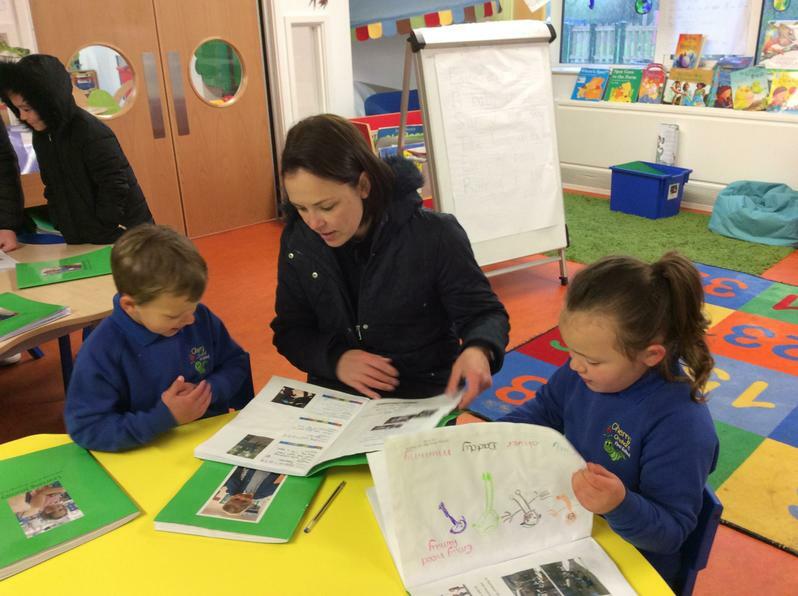 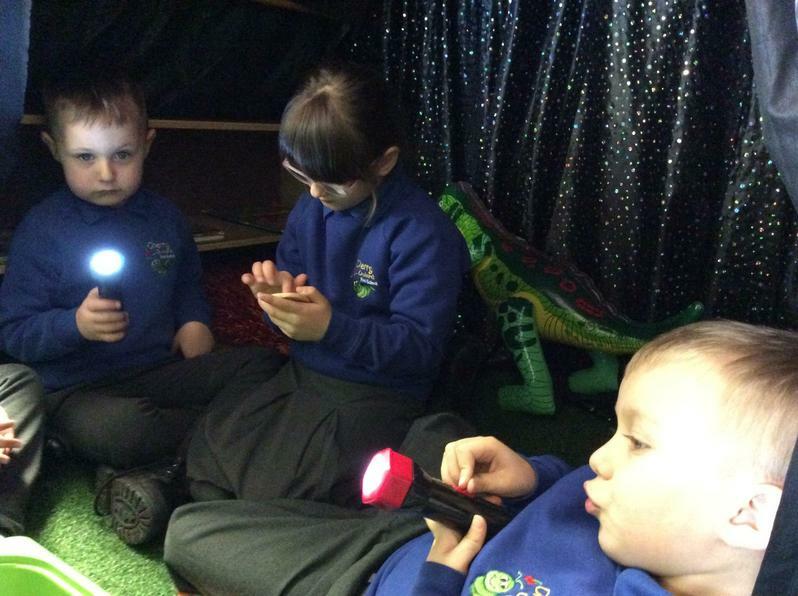 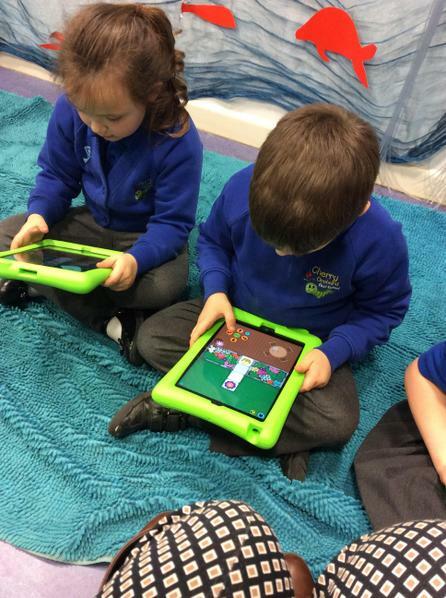 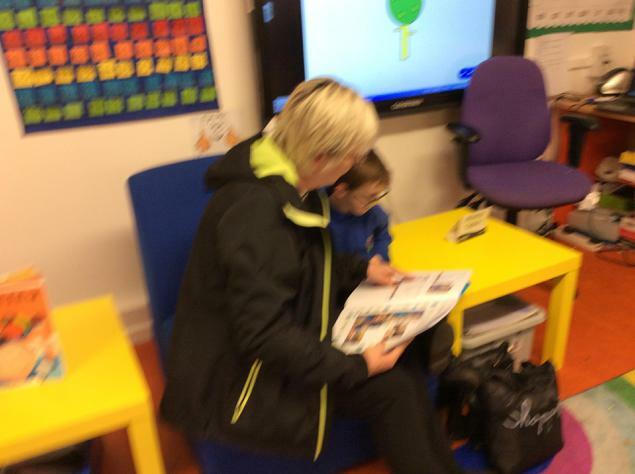 This week we have been doing our guided reading sessions in the sensory room. 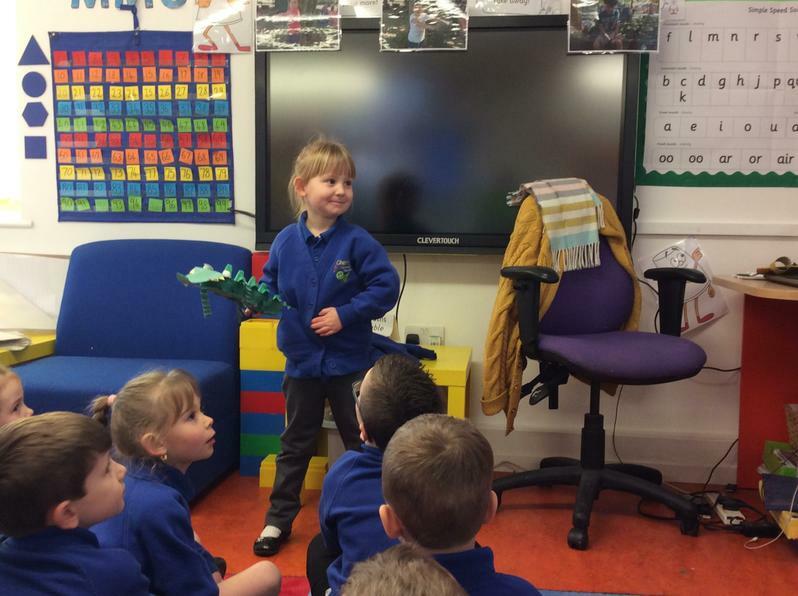 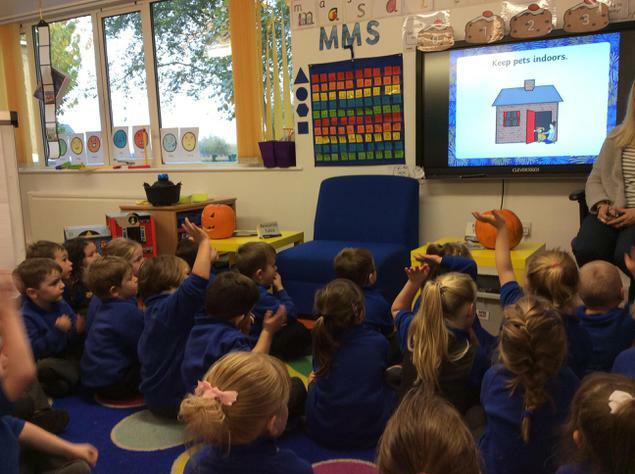 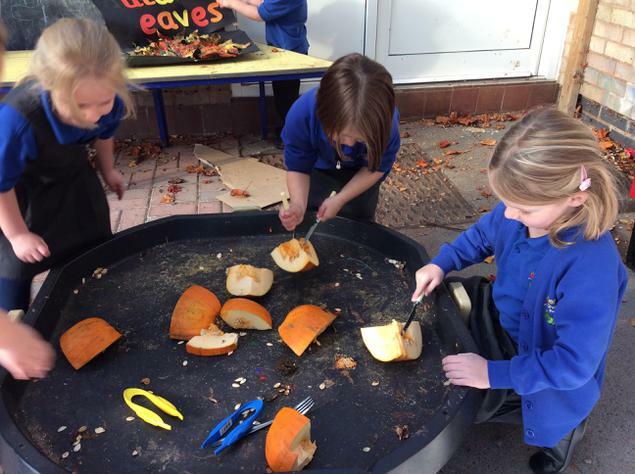 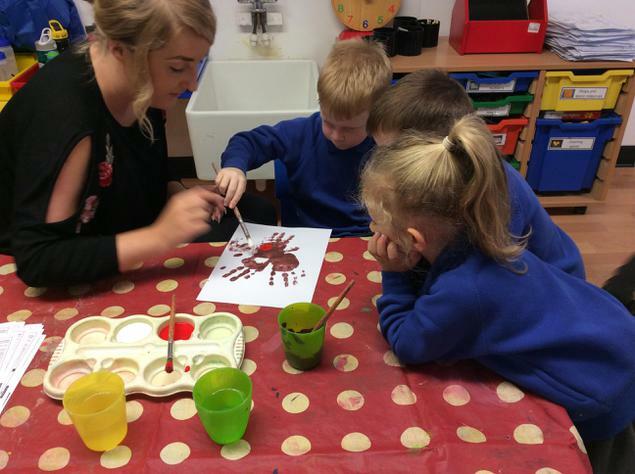 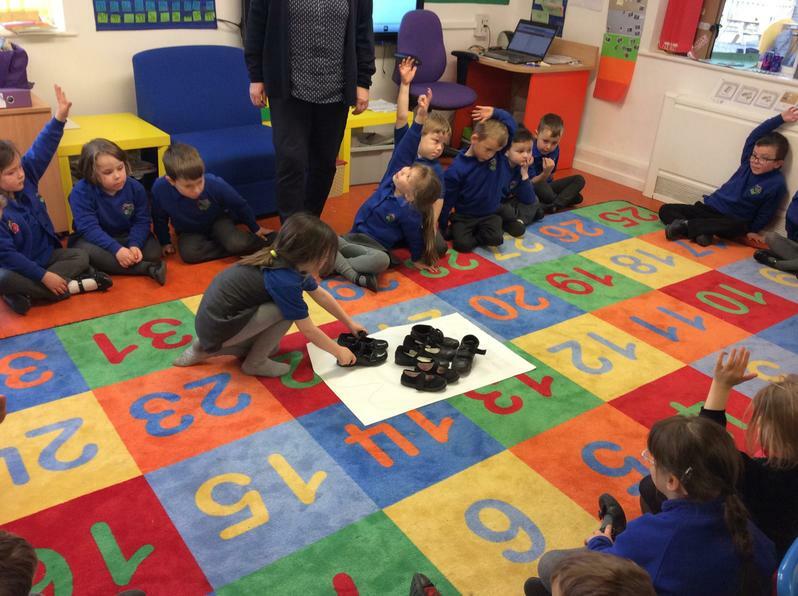 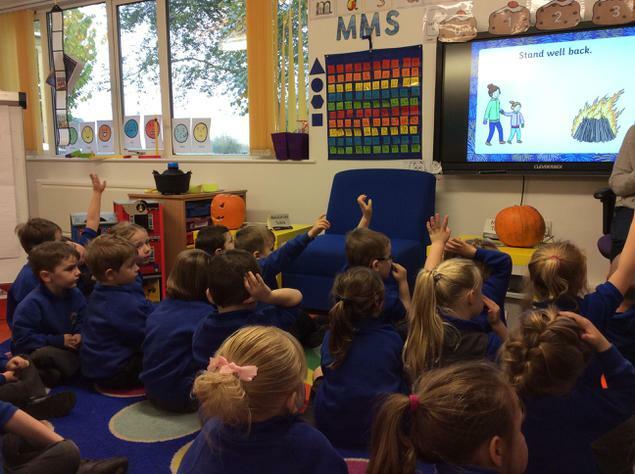 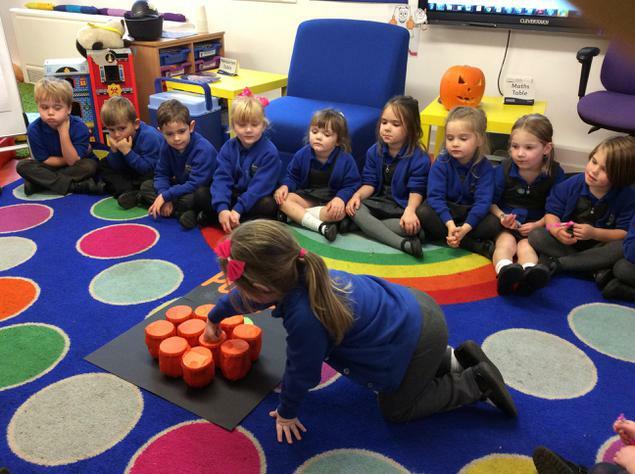 On Thursday we discussed Bonfire Night and safety. 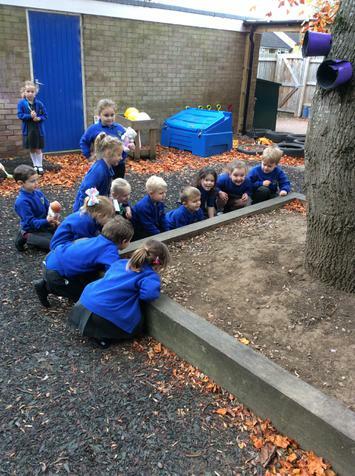 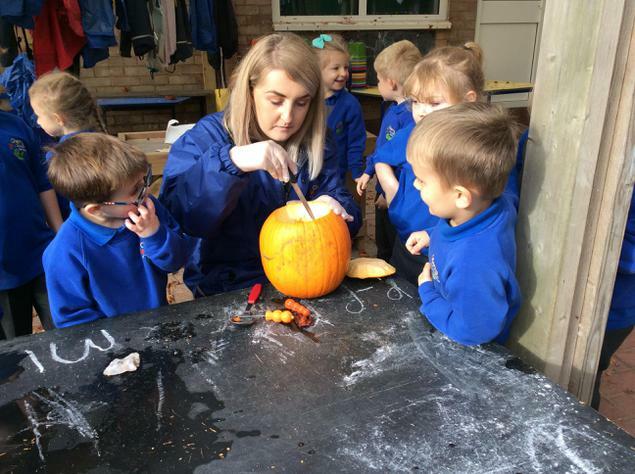 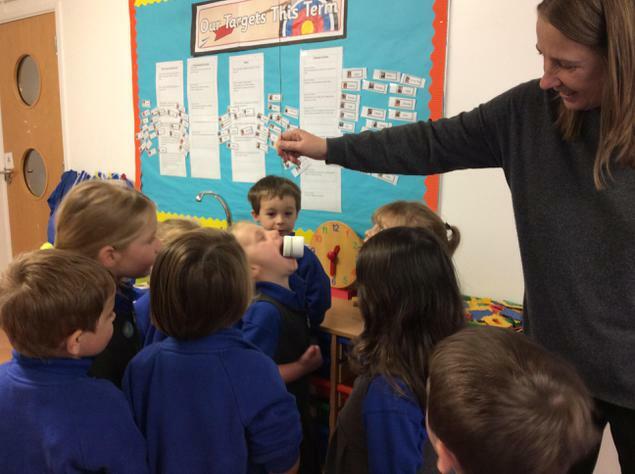 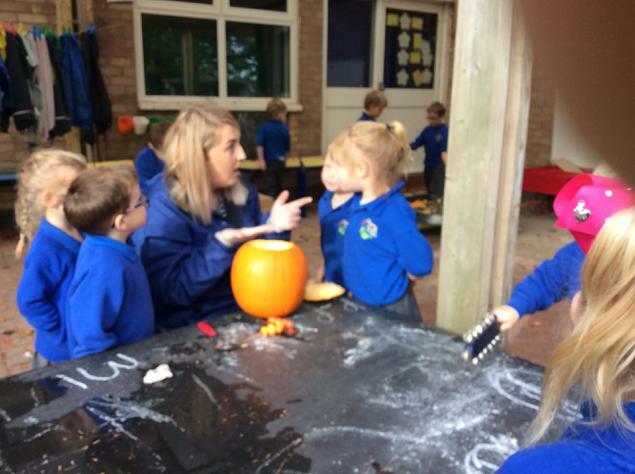 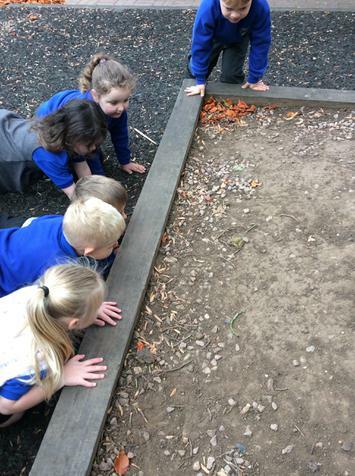 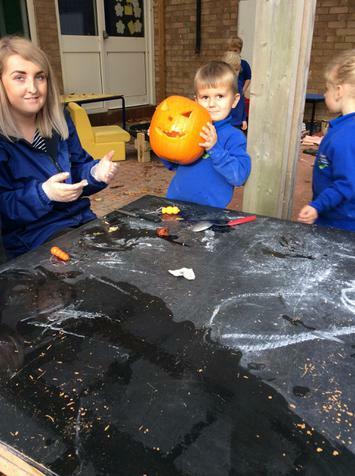 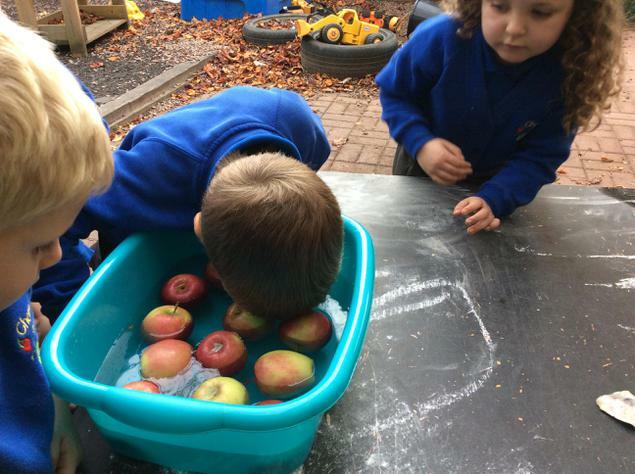 We had a spooky afternoon where we played some traditional games like apple bobbing and eating a marshmallow . 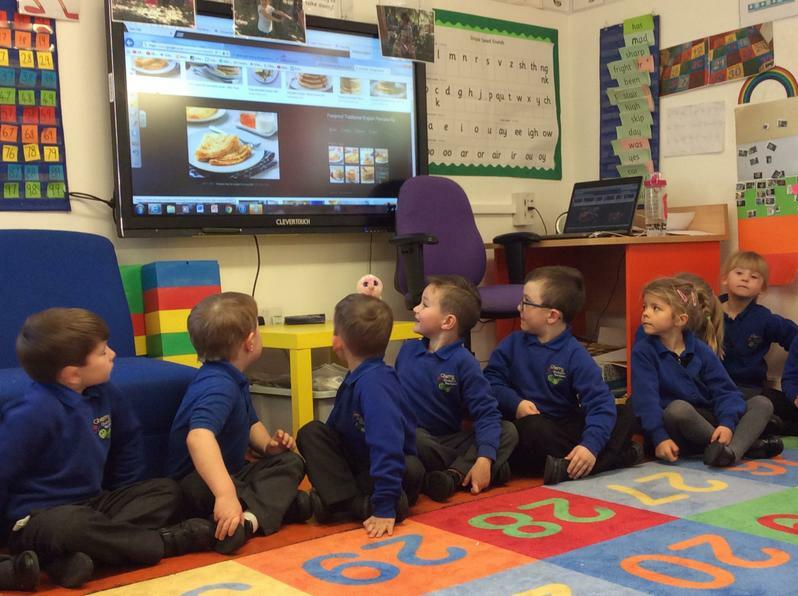 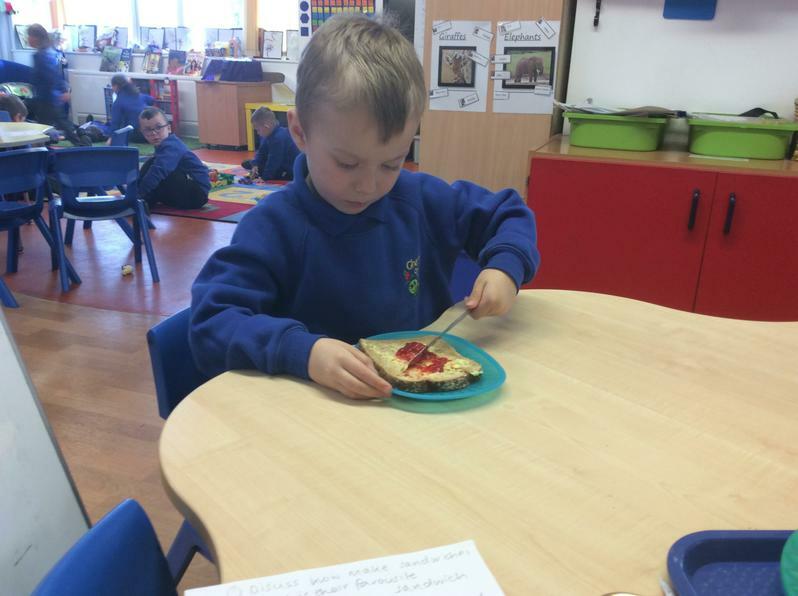 Learning Pat A Cake ;using a story map. 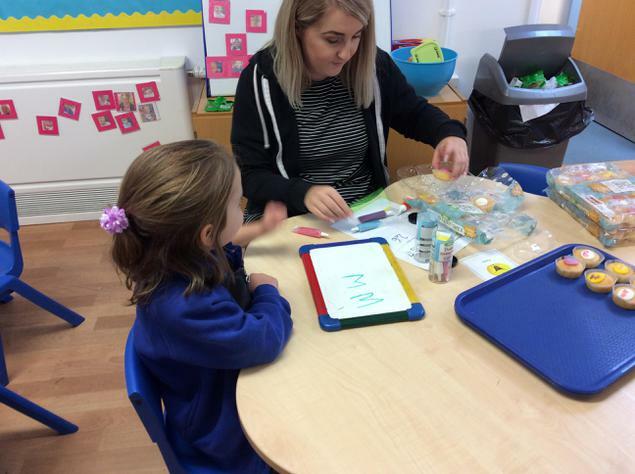 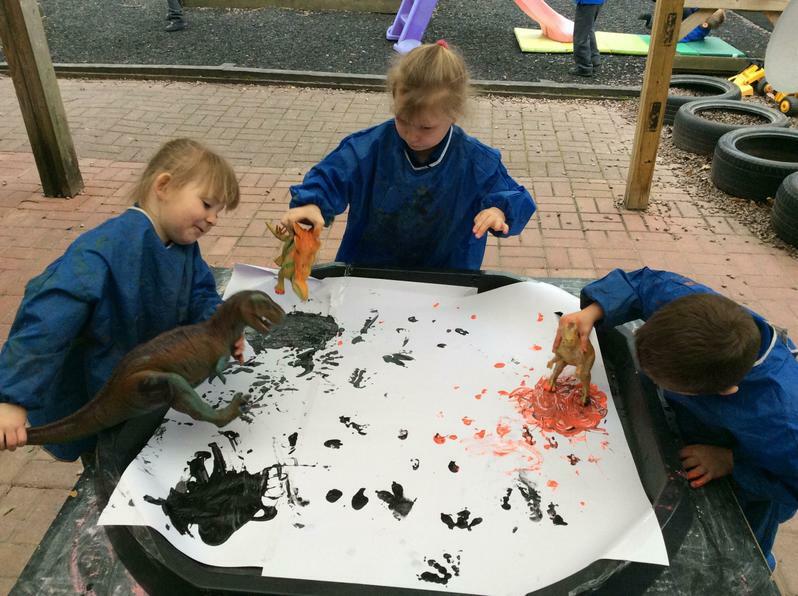 16.10.17 This week we will be looking at the nursery rhyme, Pat A cake, we will be baking cakes and composing music for our nursery rhymes. 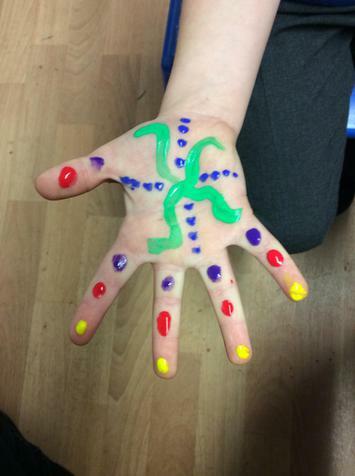 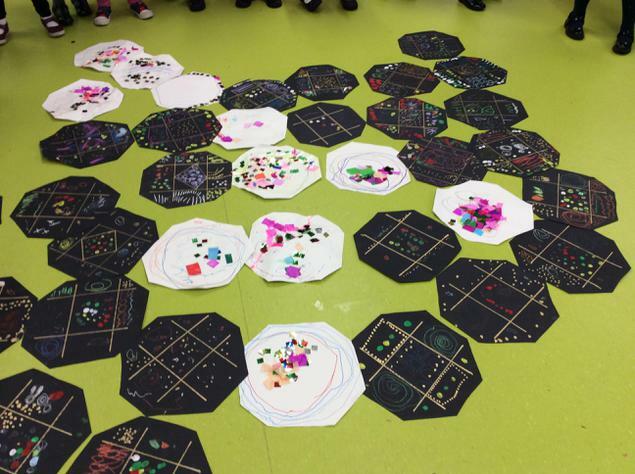 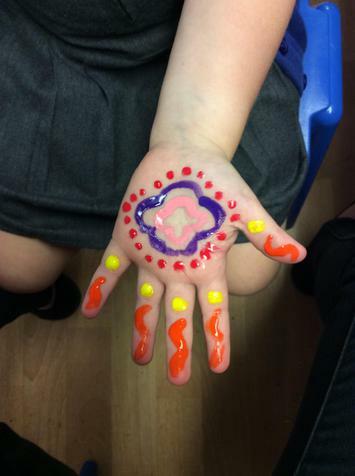 On Thursday we aim to have a Diwali day where we will be doing Rangoli patterns, tasting Indian food and learning a dance. 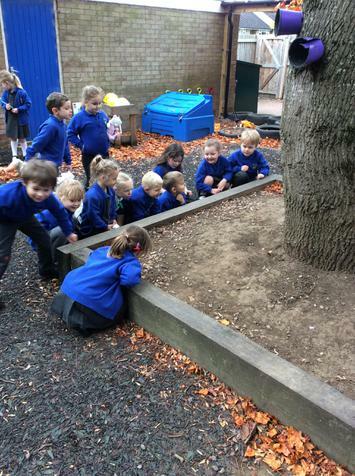 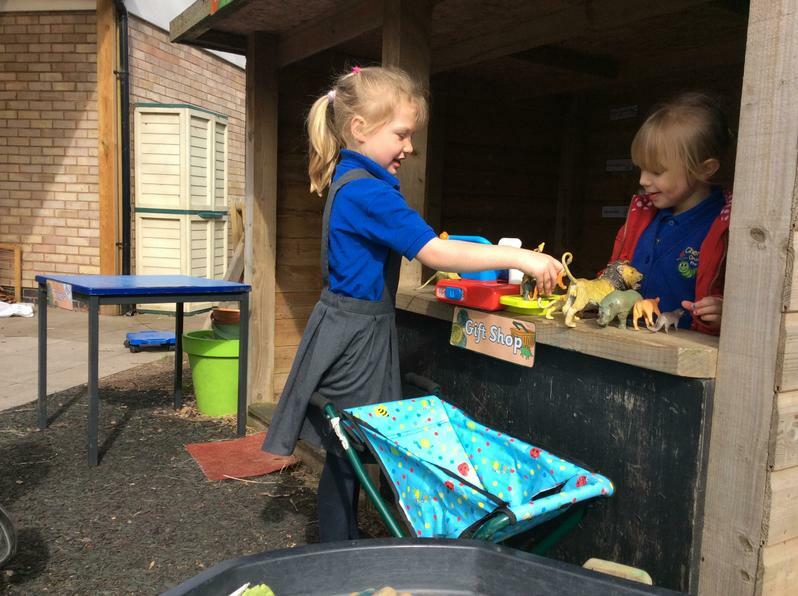 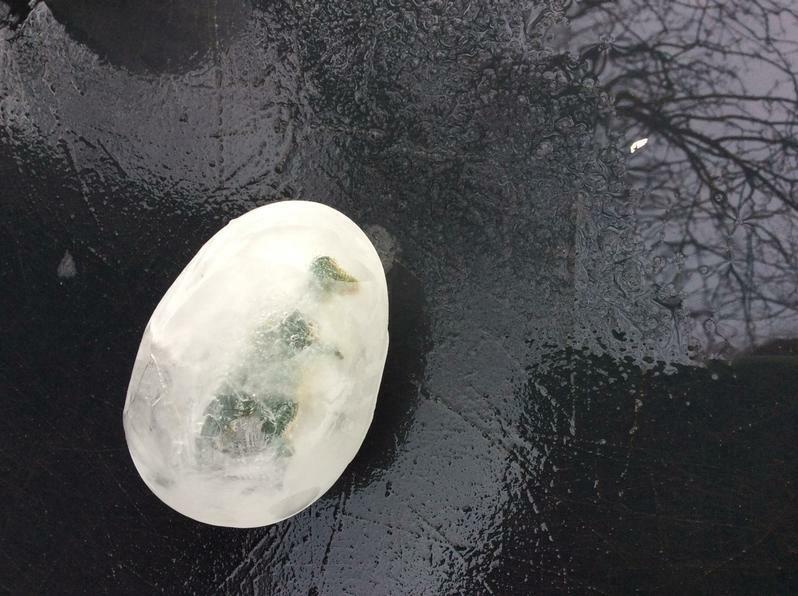 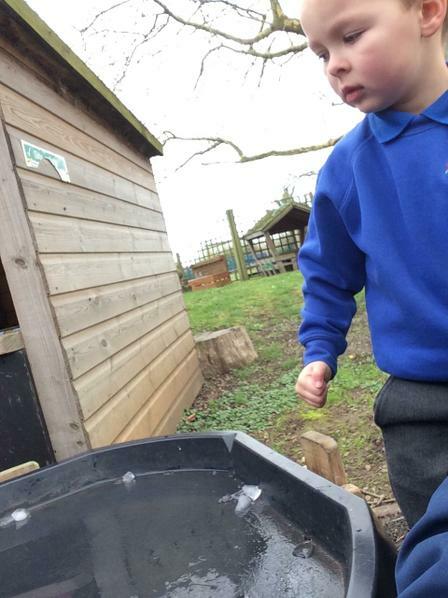 On Wednesday we had a visitor to our outside area....a frog. 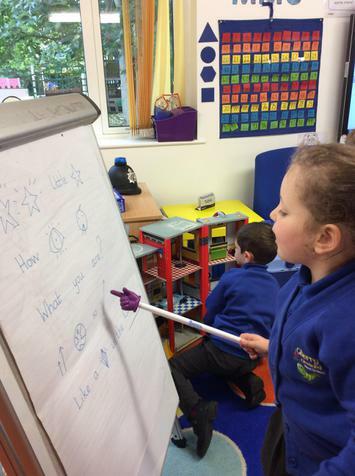 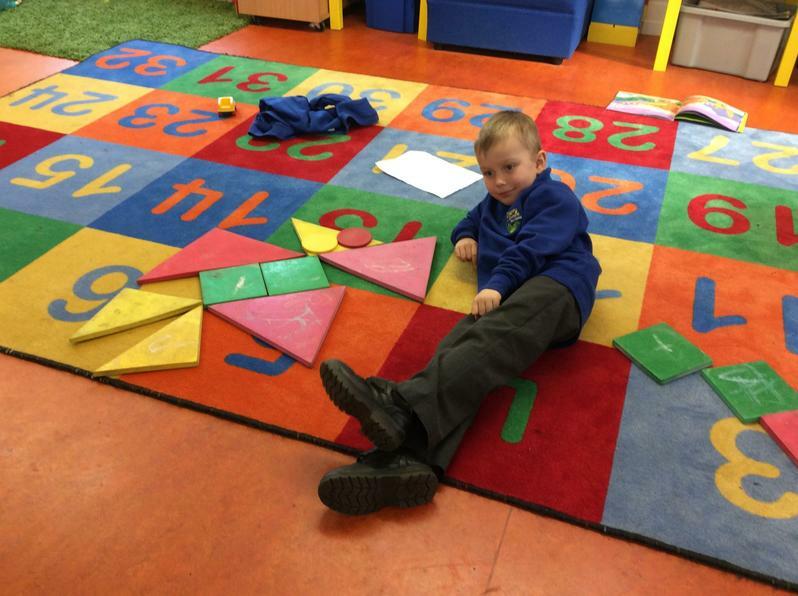 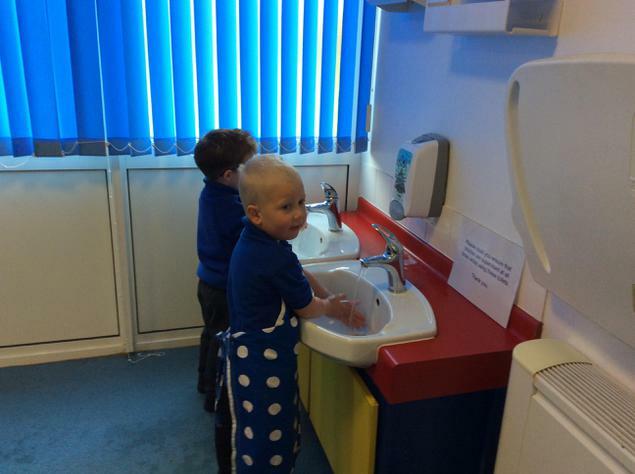 We will be learning the actions for Twinkle , Twinkle Little Star. 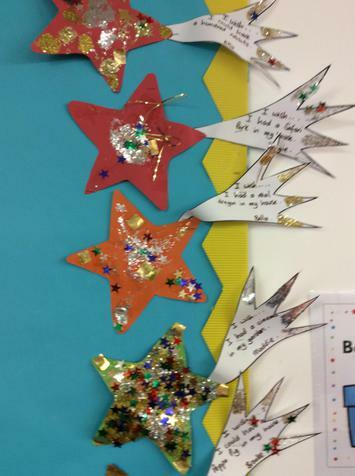 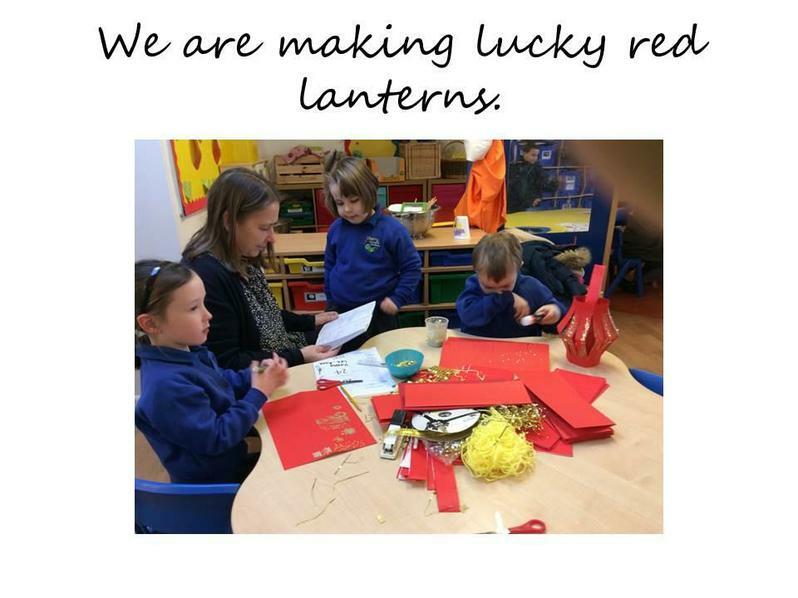 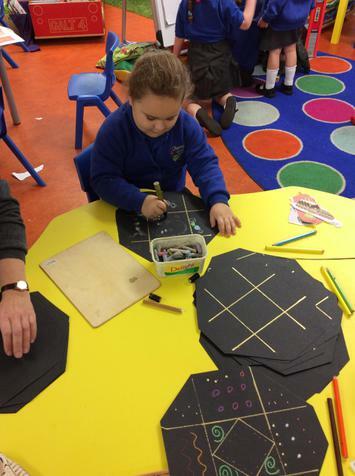 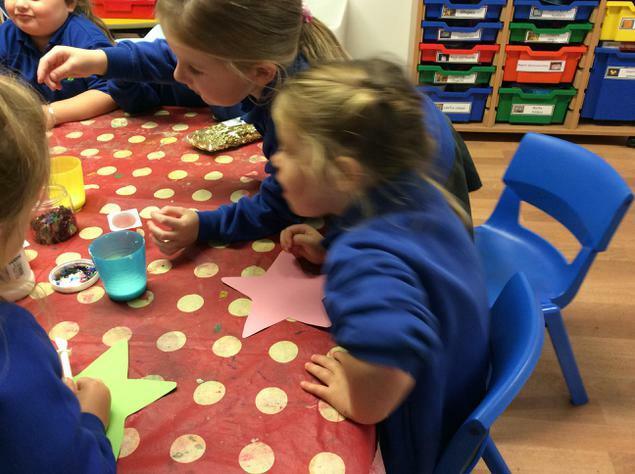 We will be learning about star shapes and their properties; wishing upon a star; and parachute games . 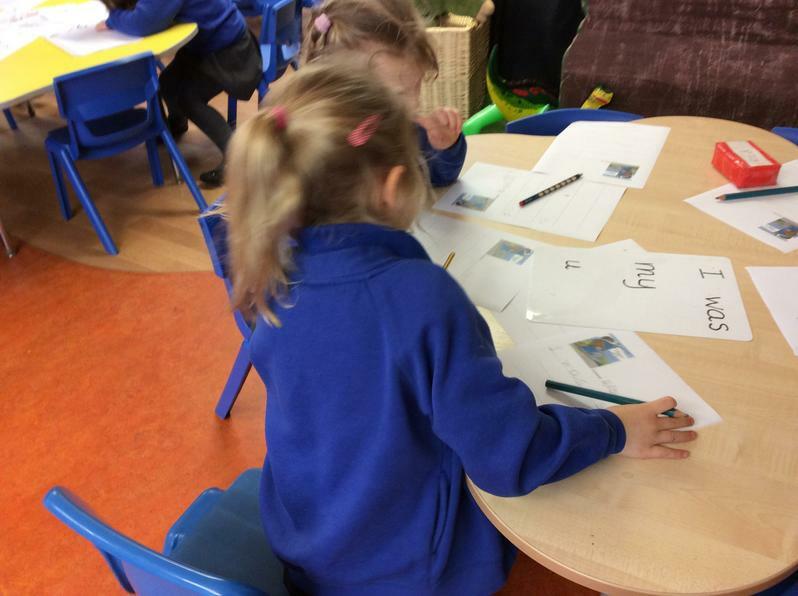 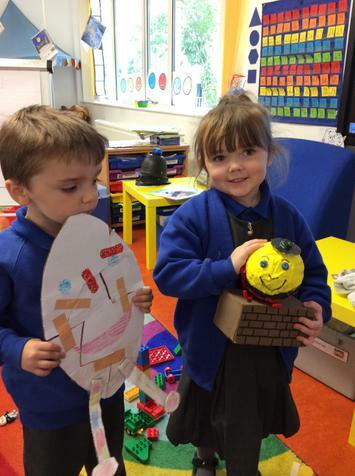 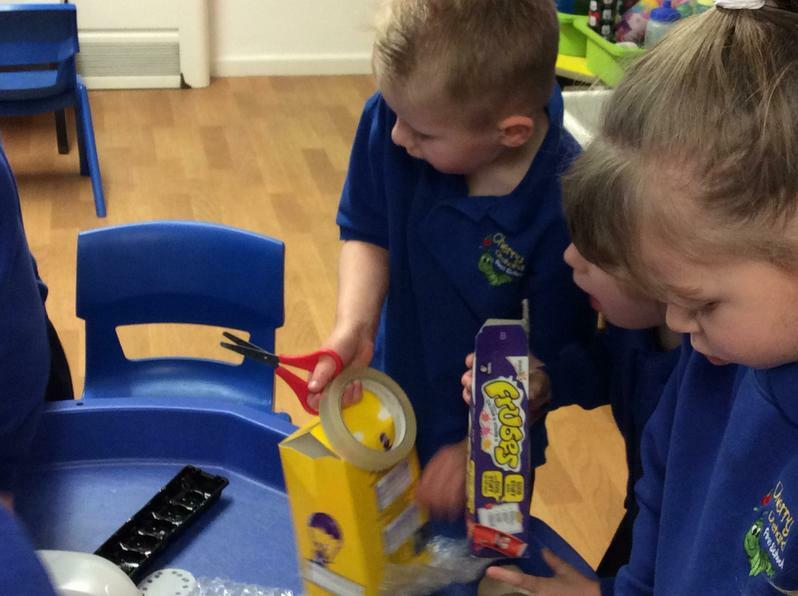 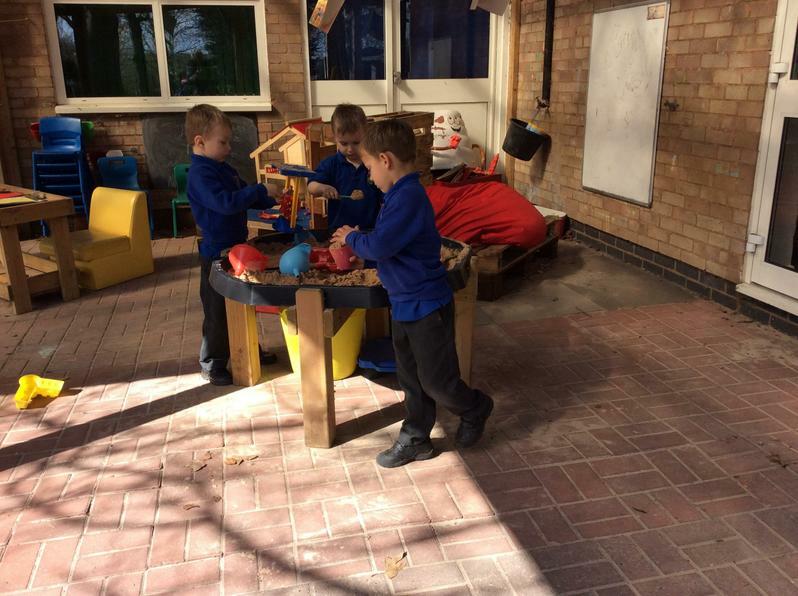 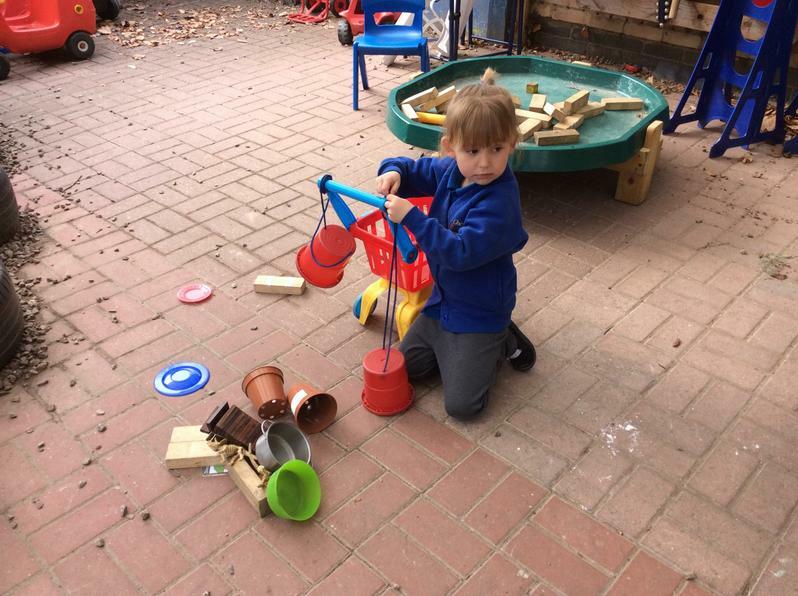 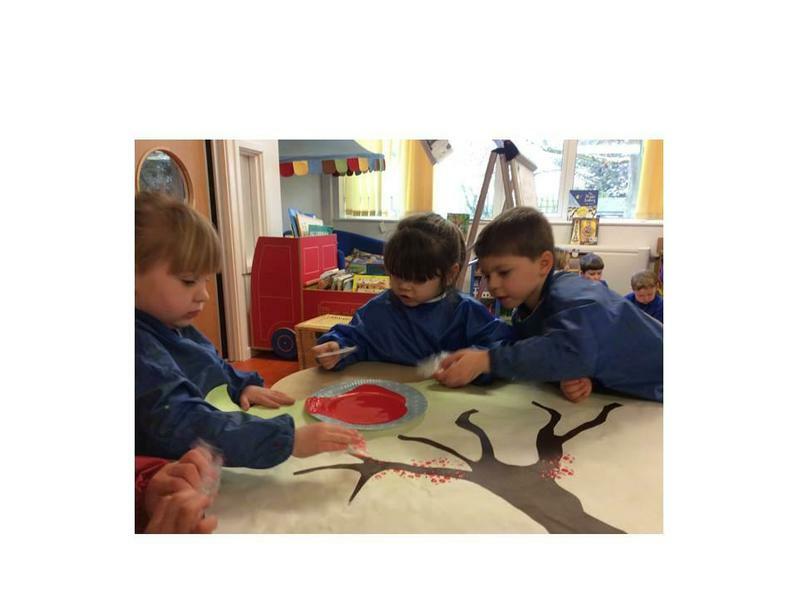 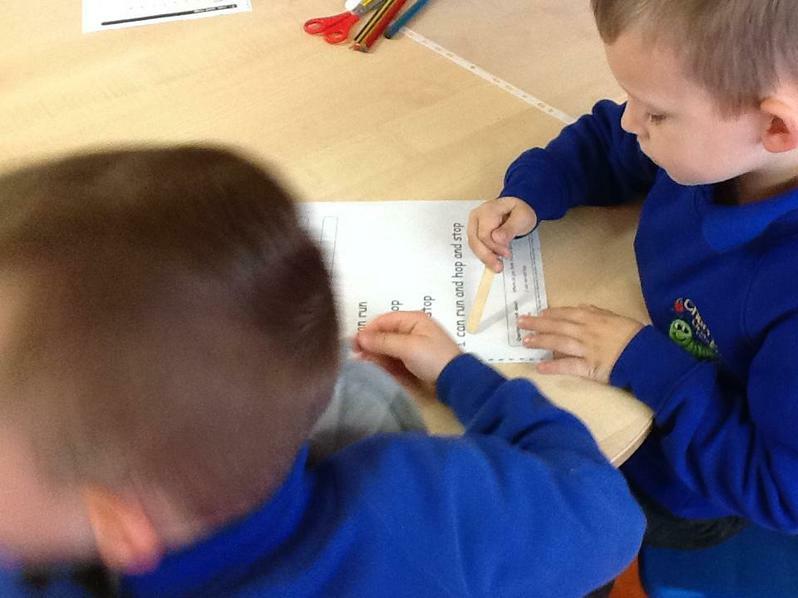 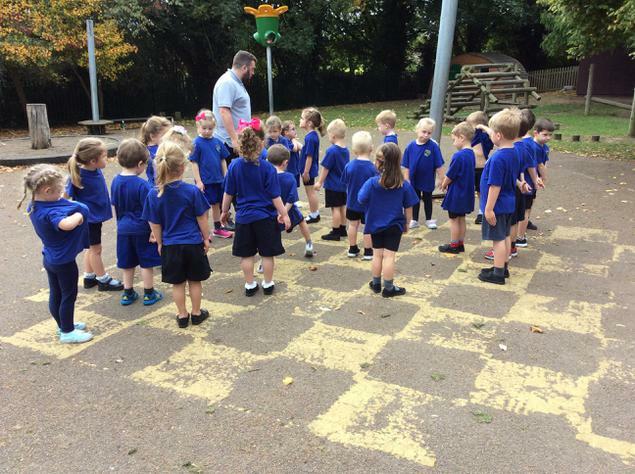 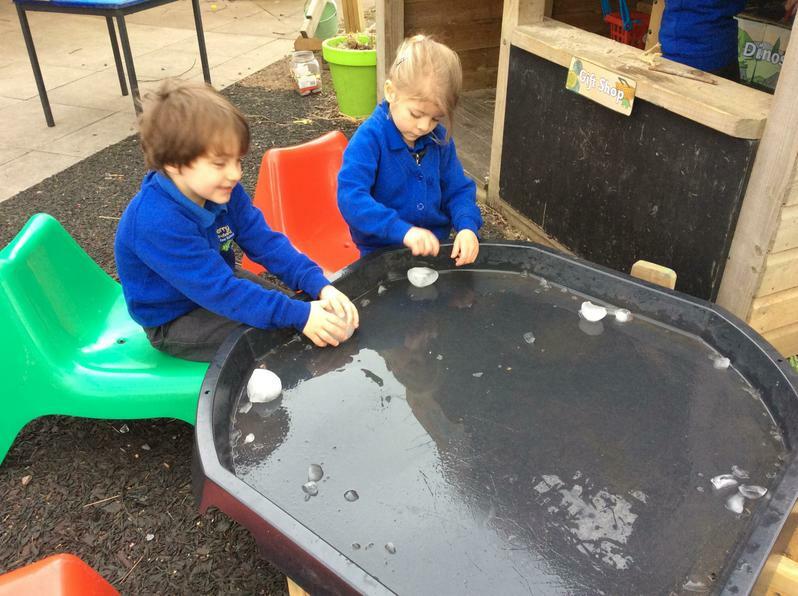 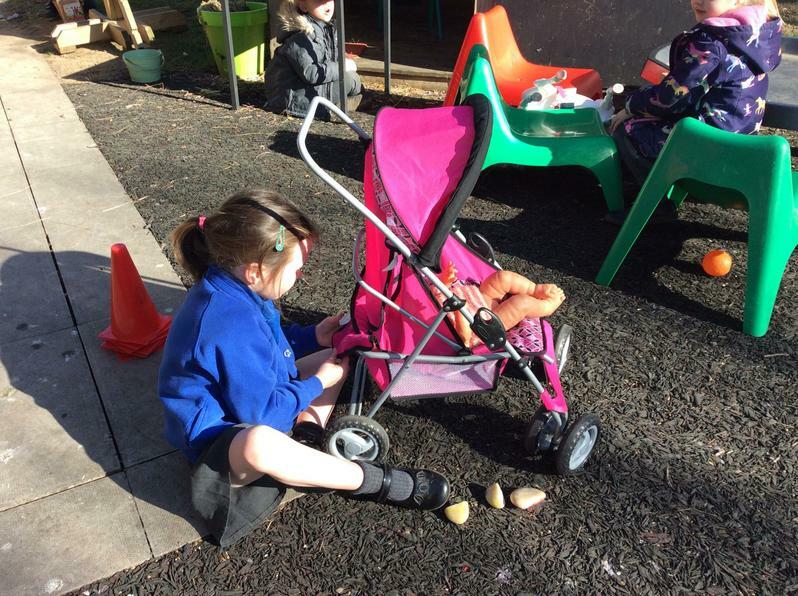 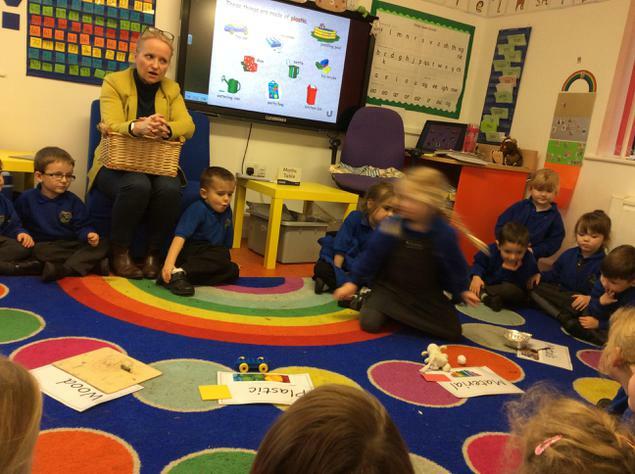 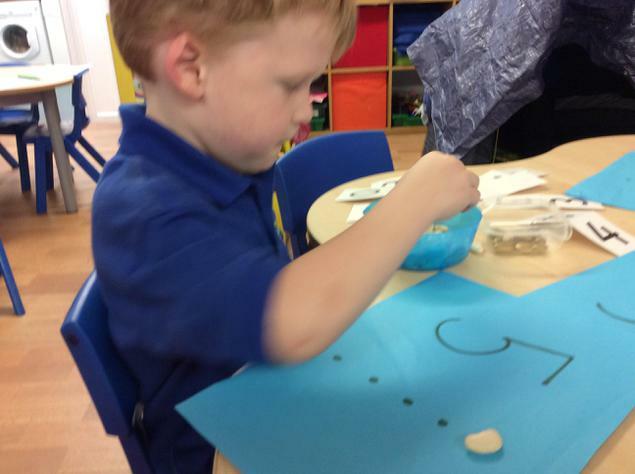 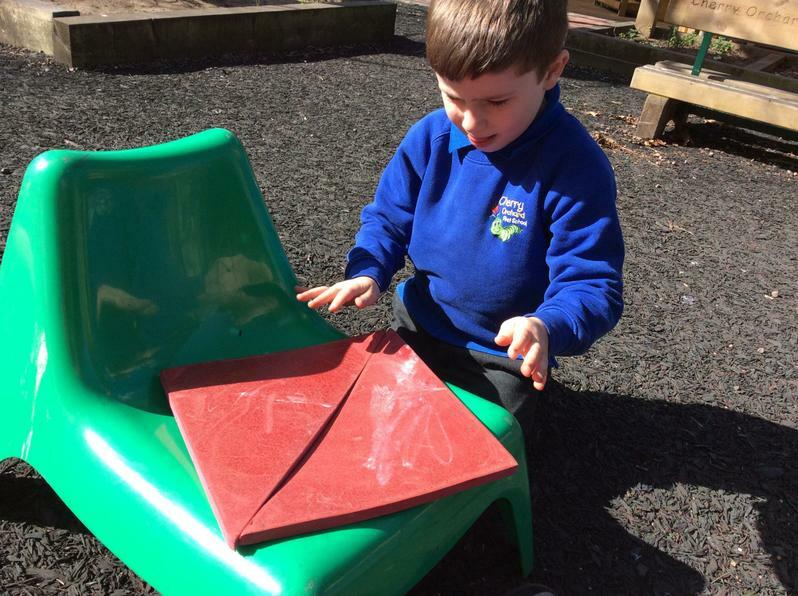 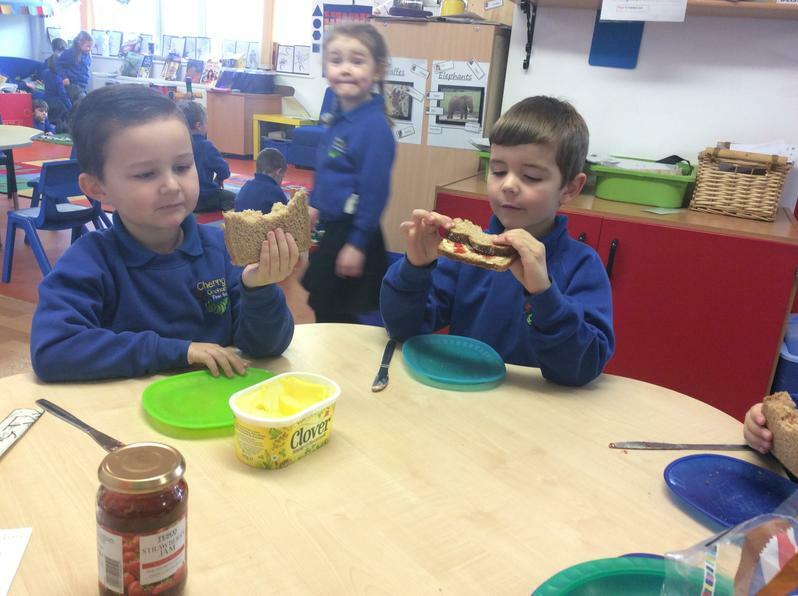 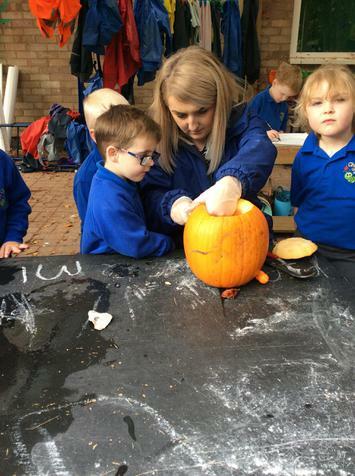 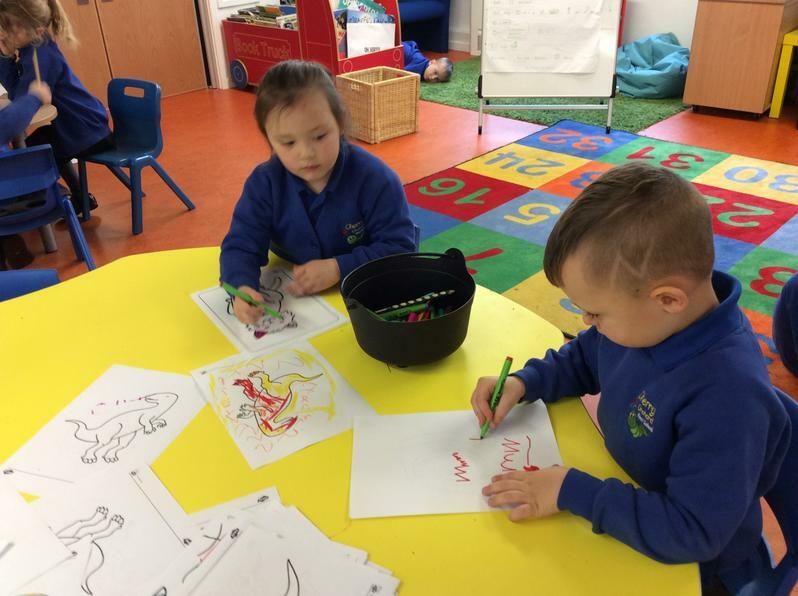 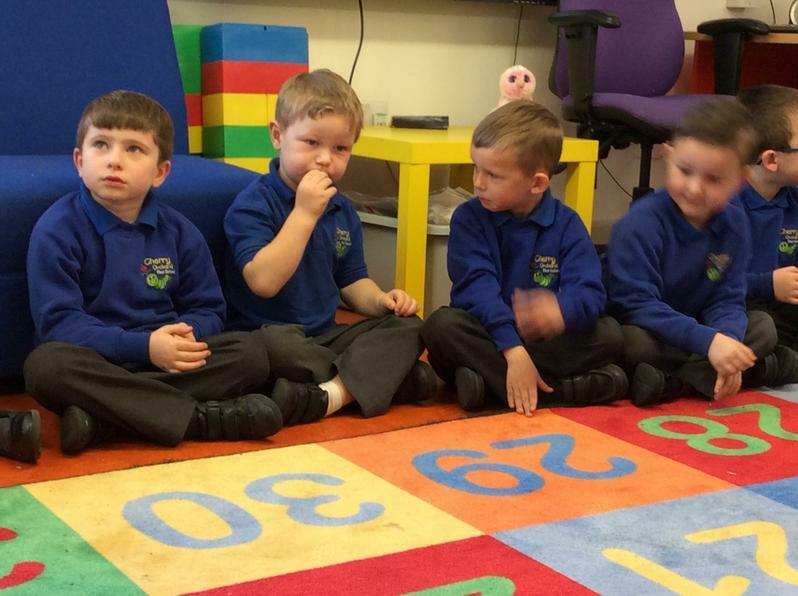 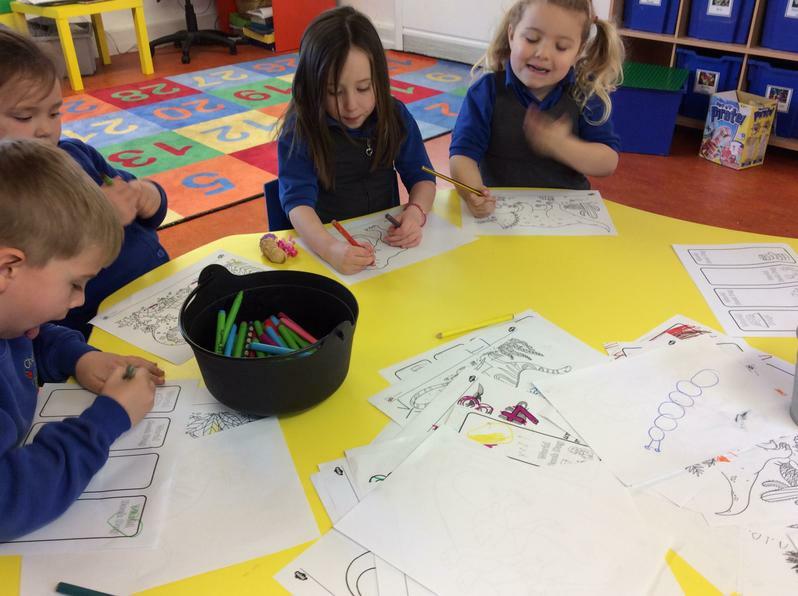 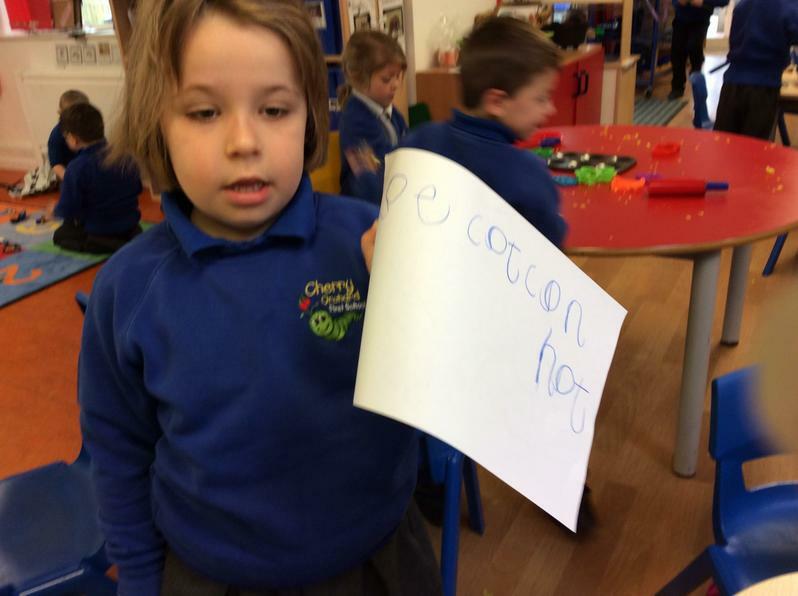 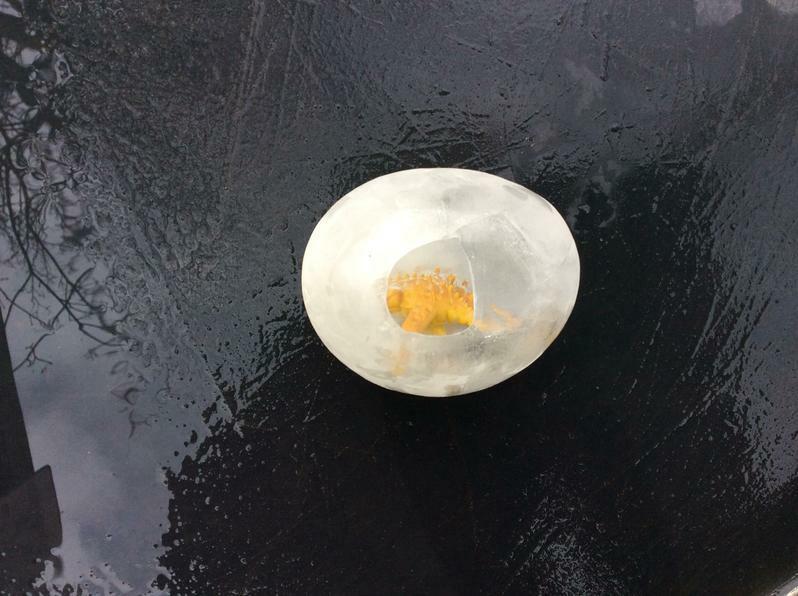 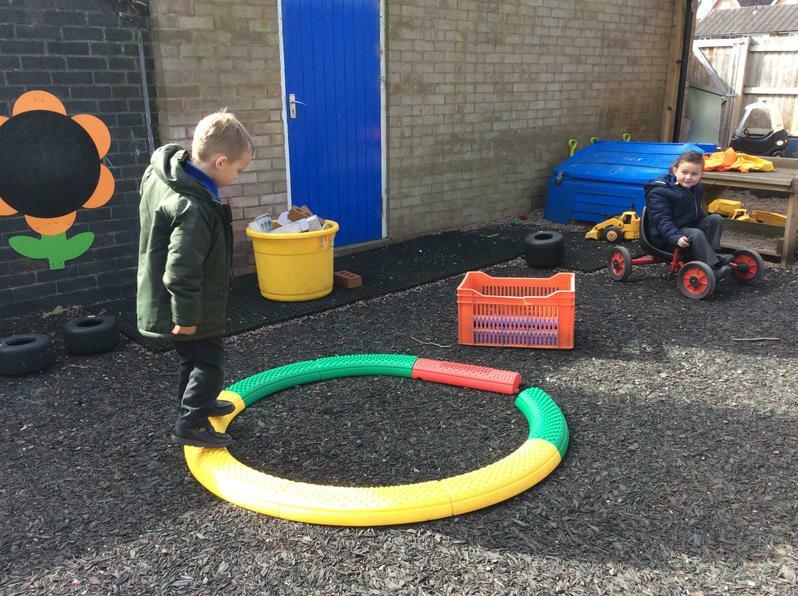 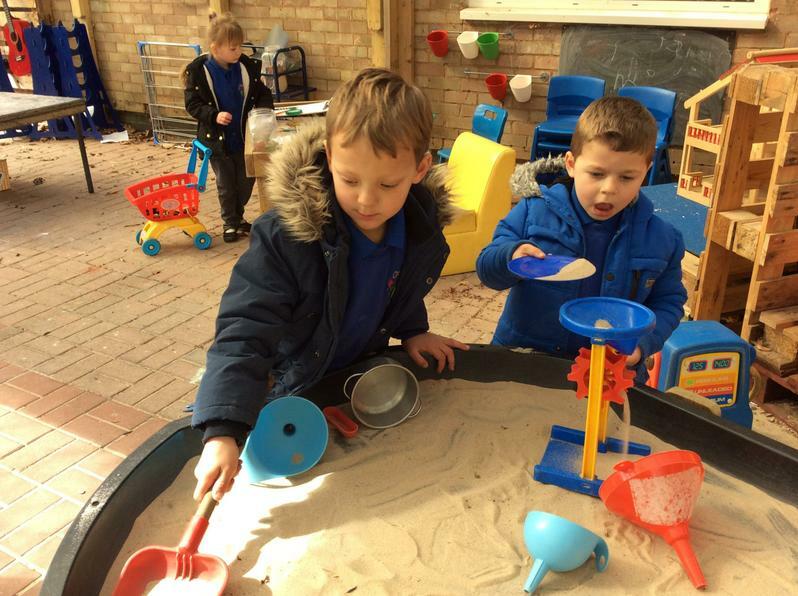 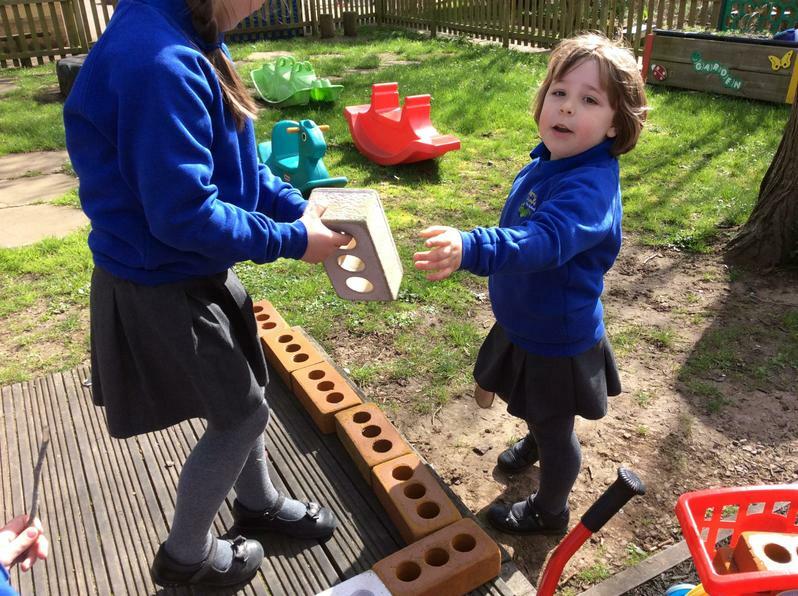 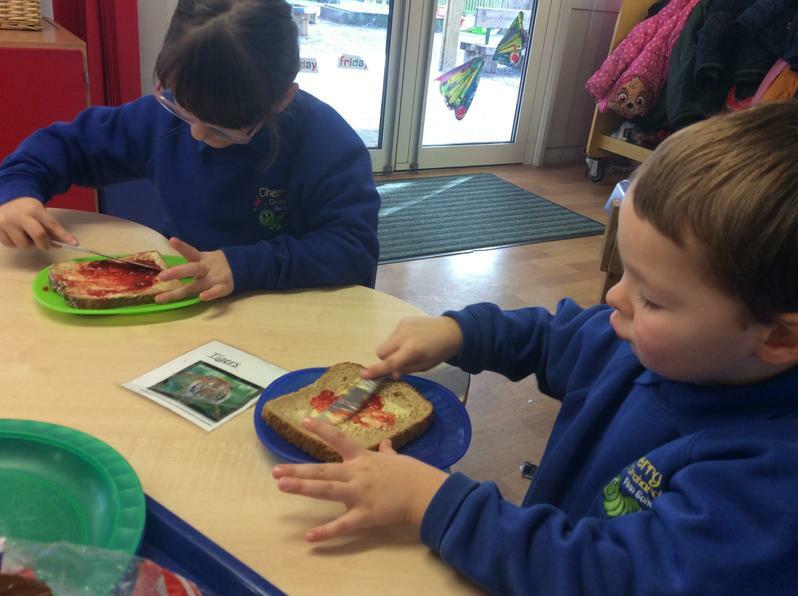 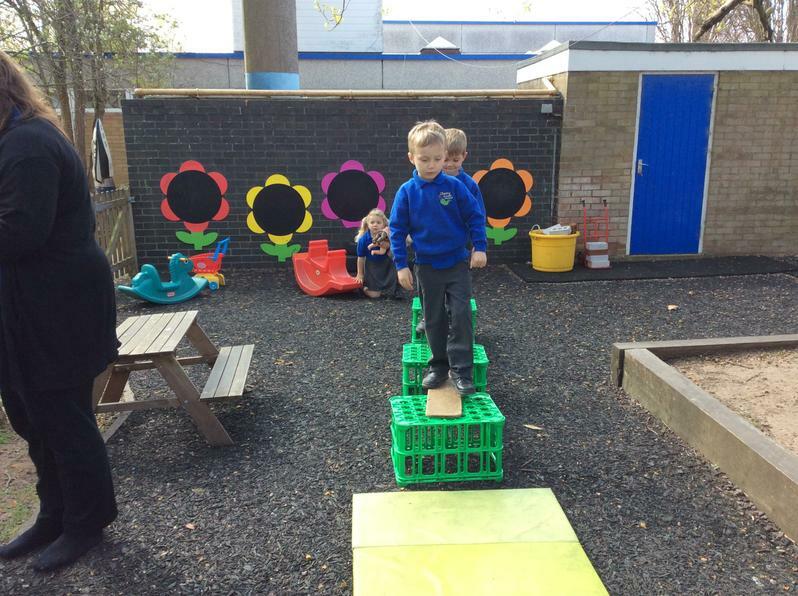 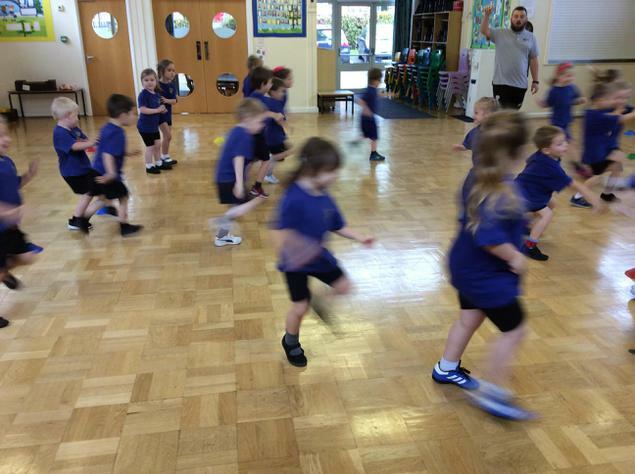 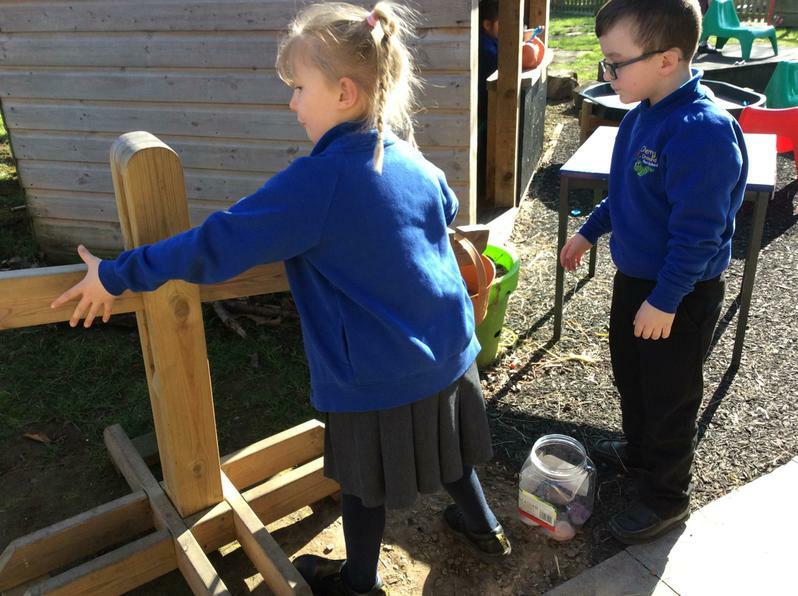 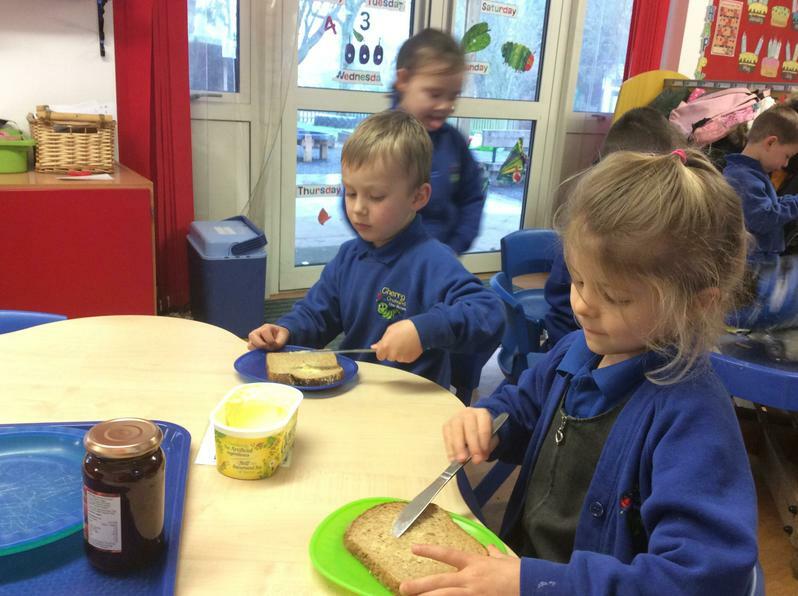 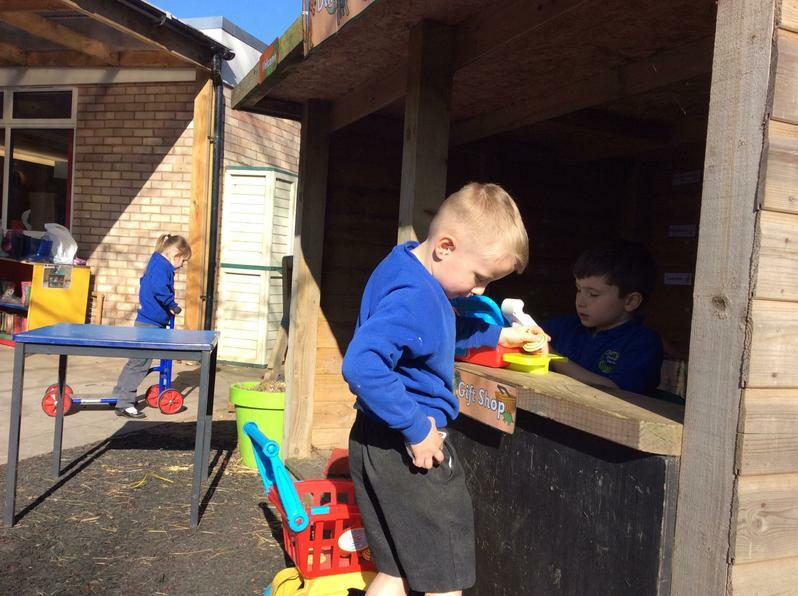 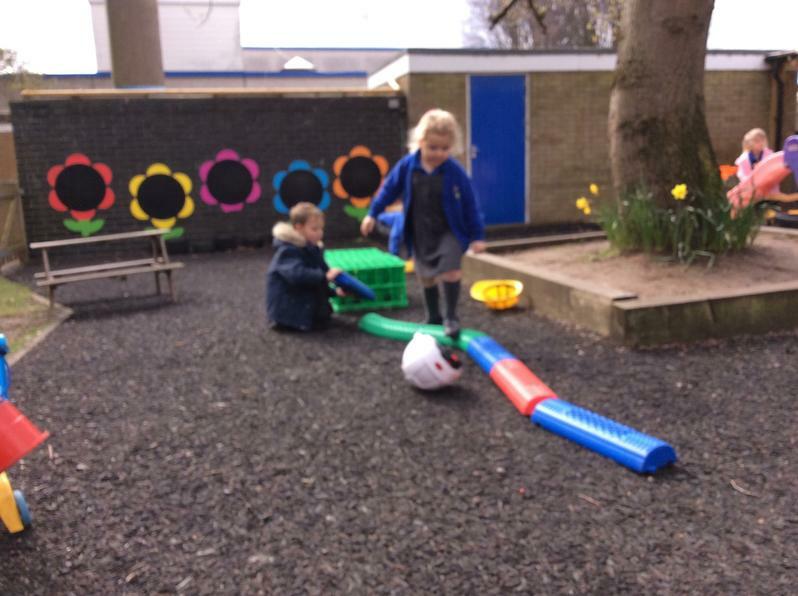 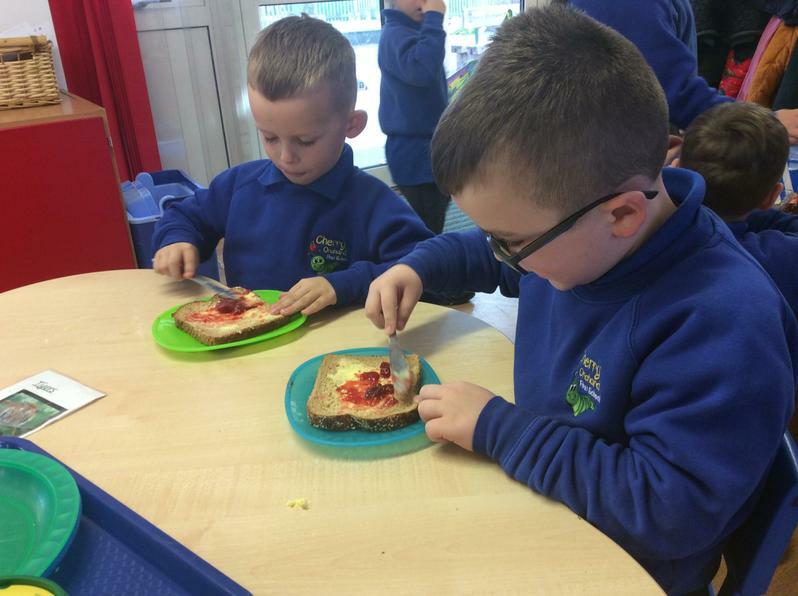 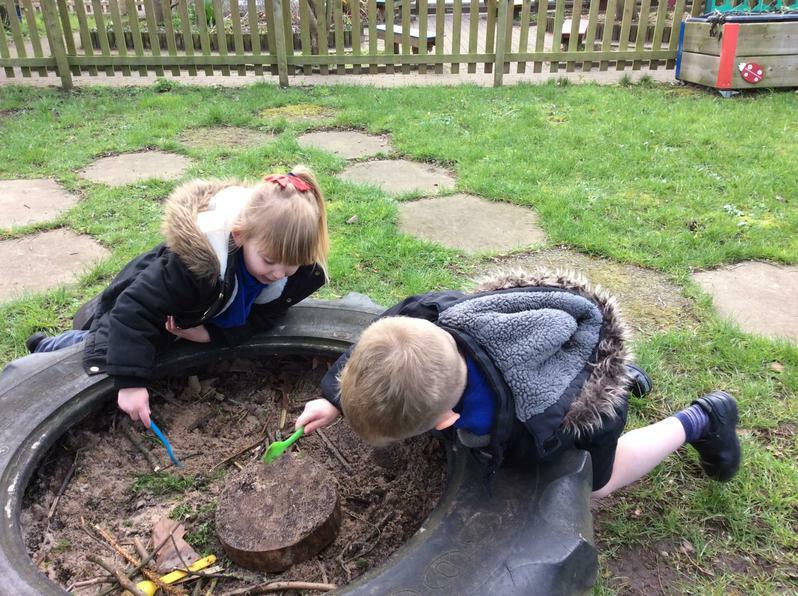 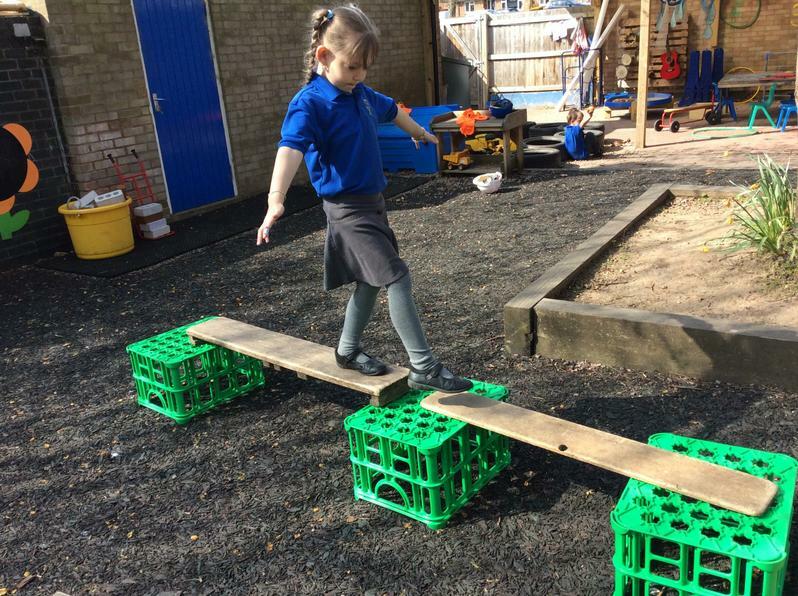 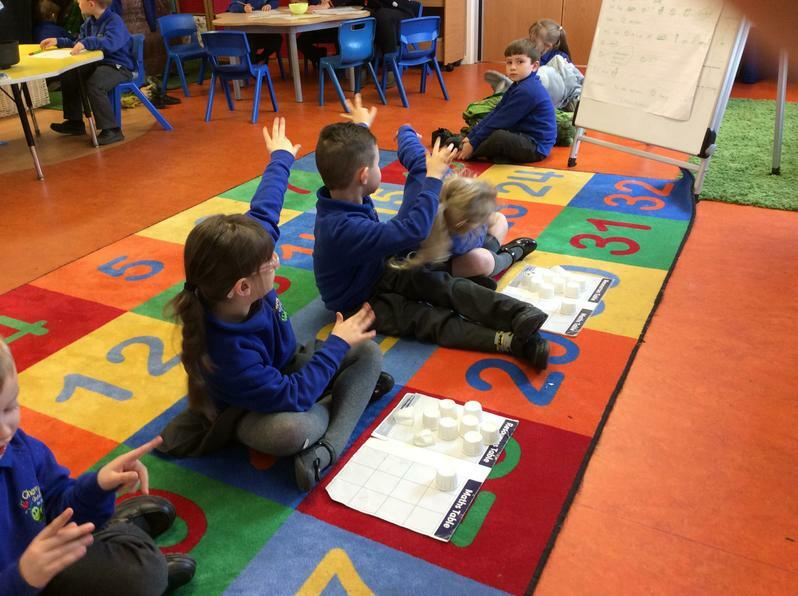 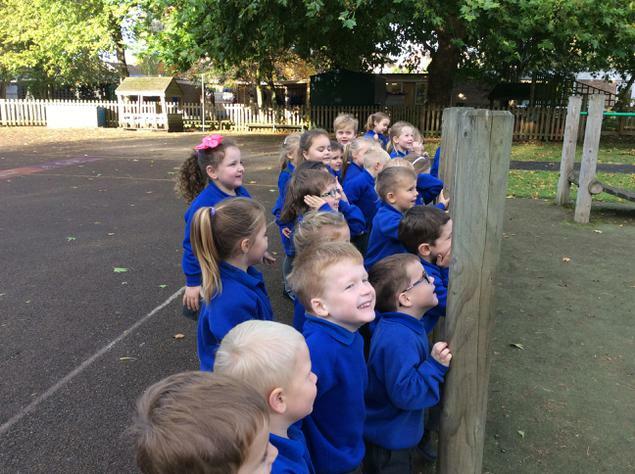 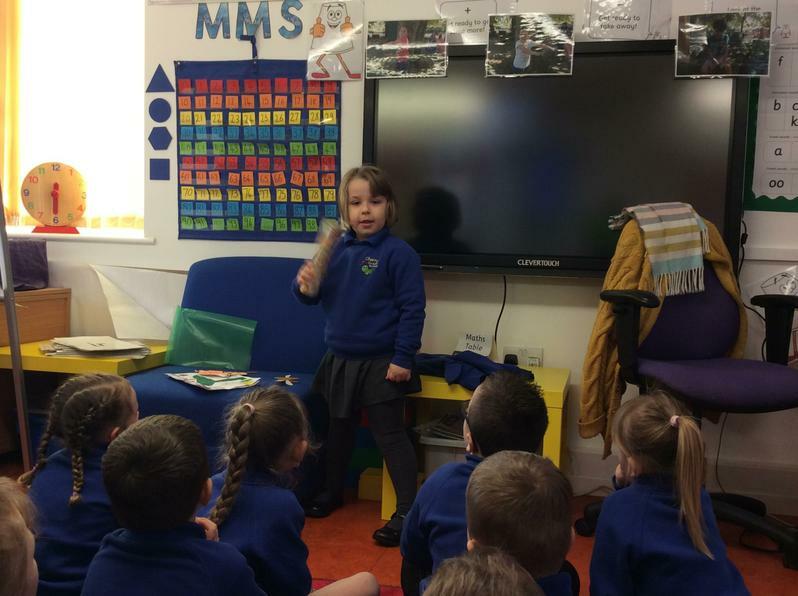 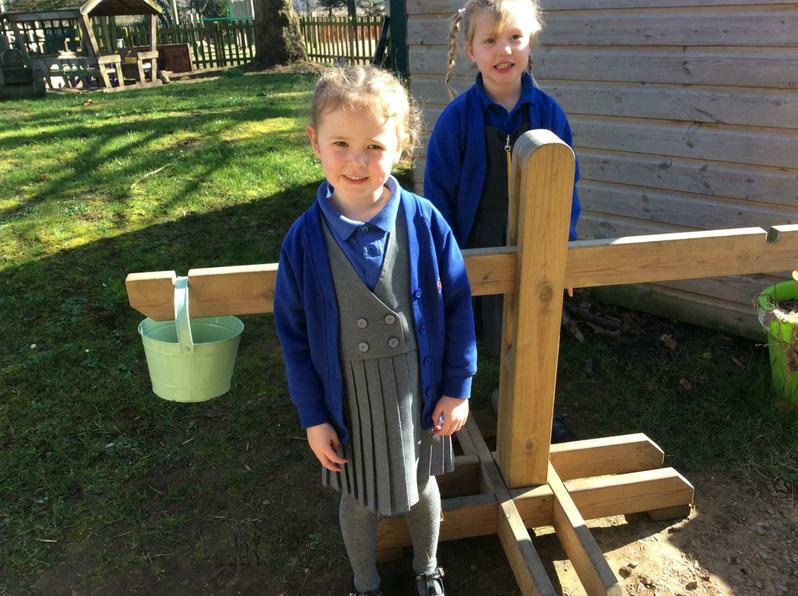 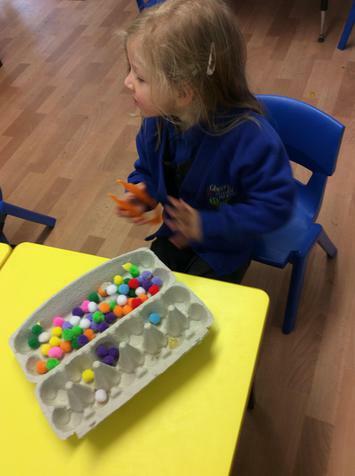 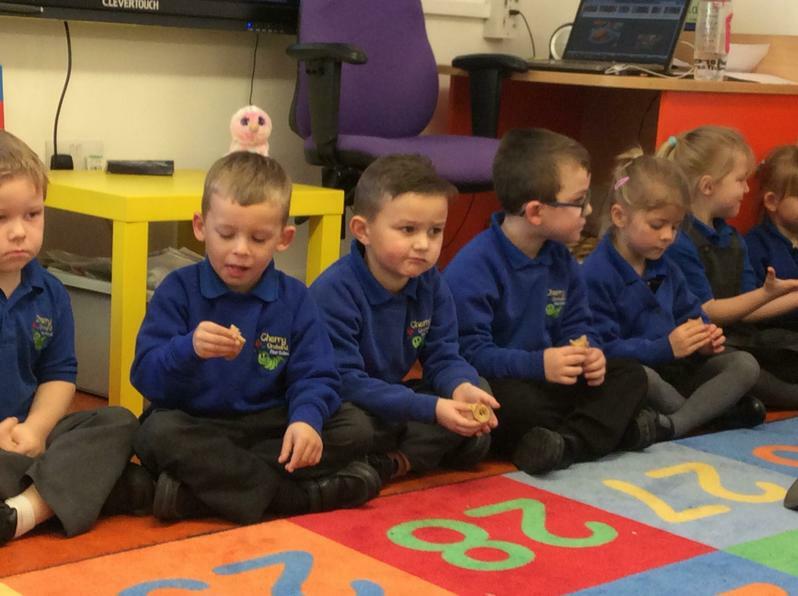 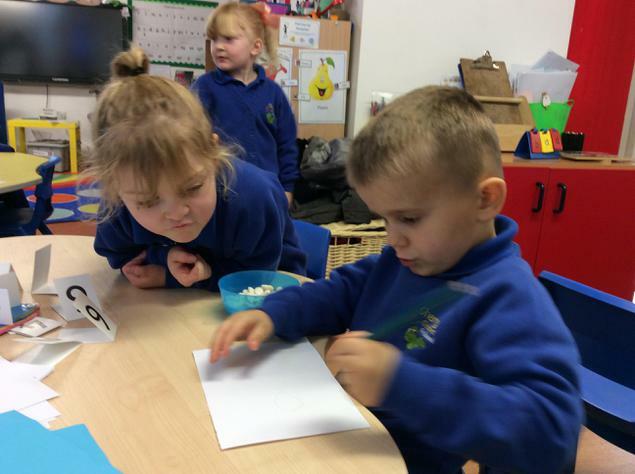 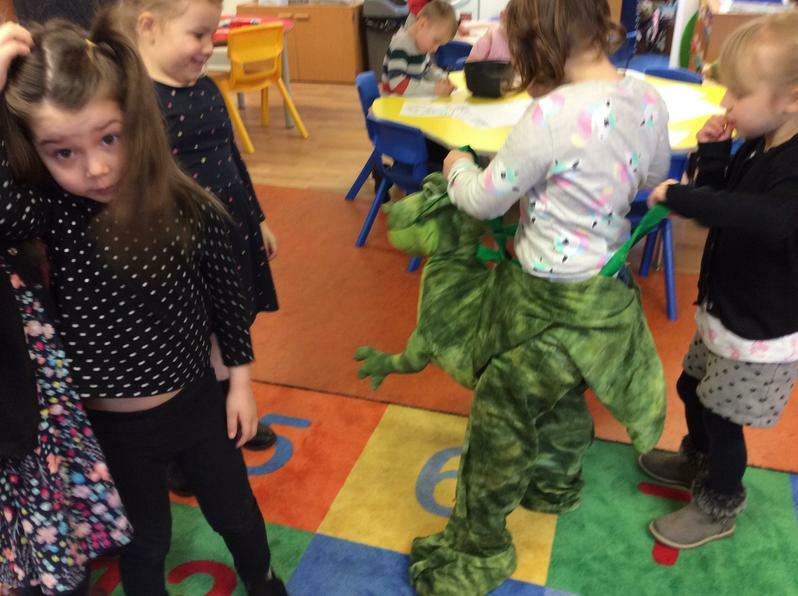 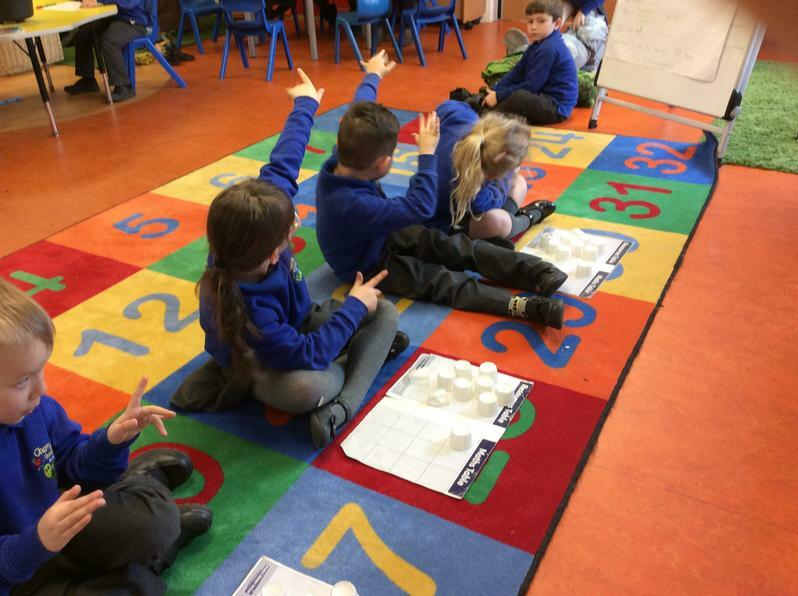 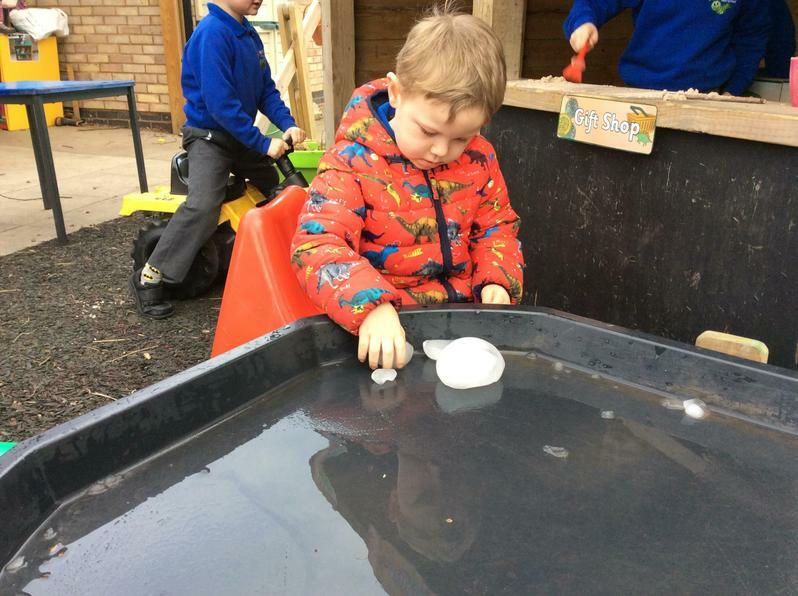 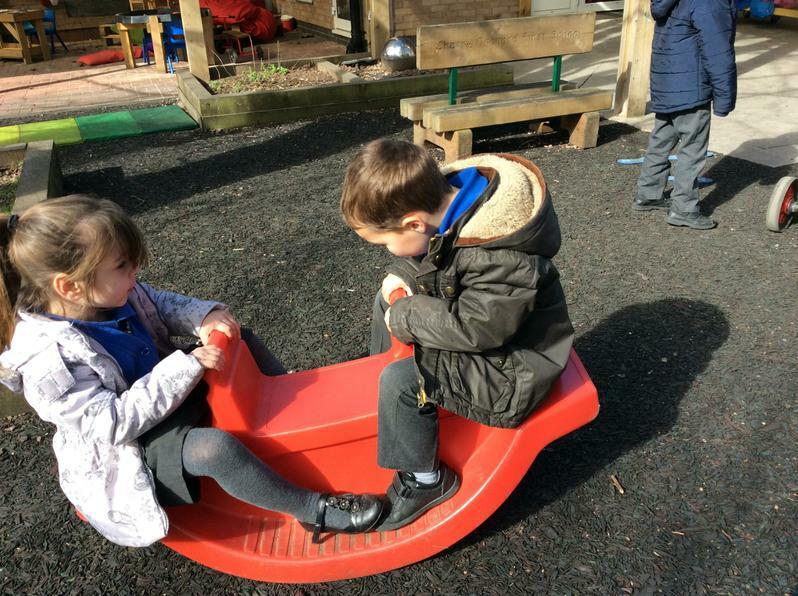 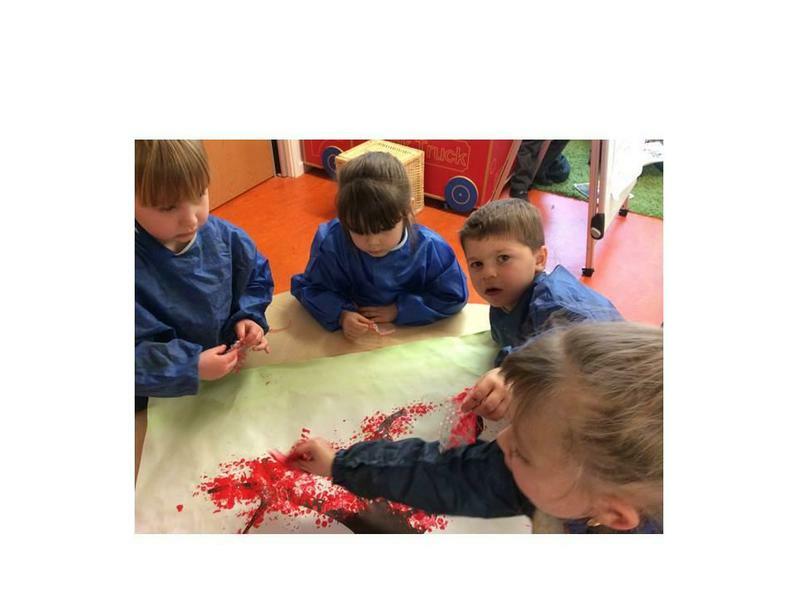 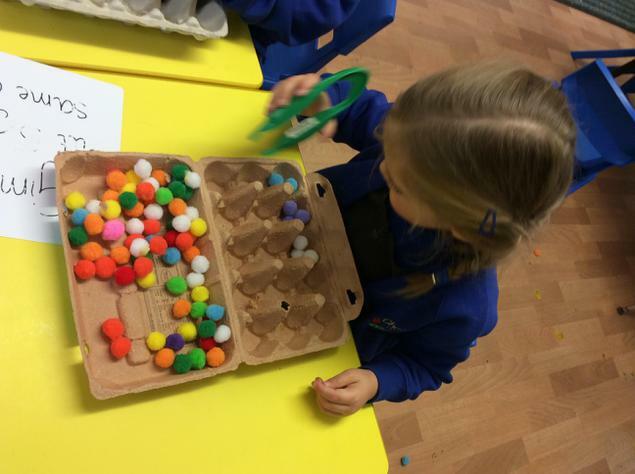 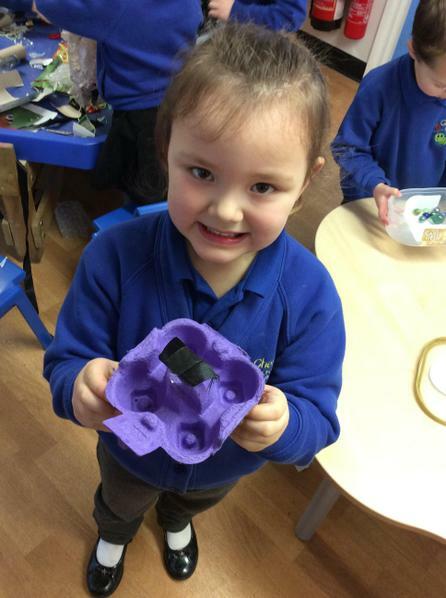 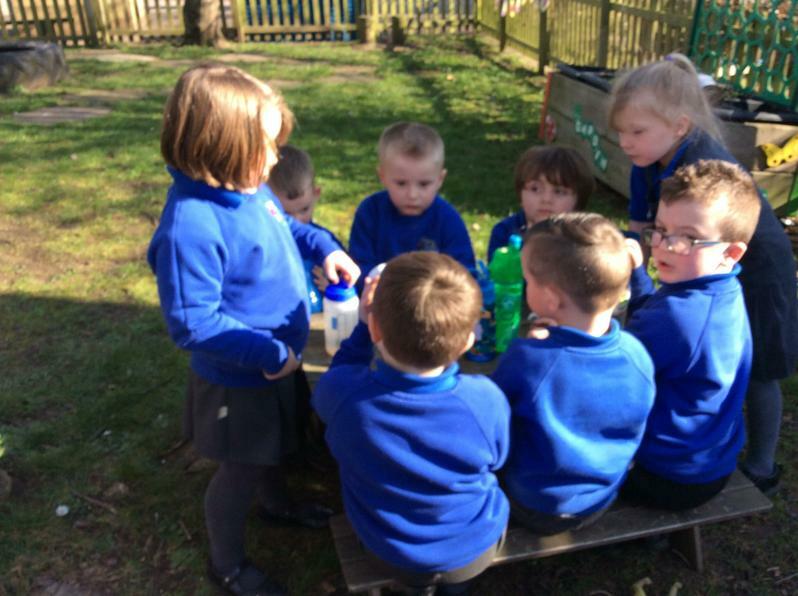 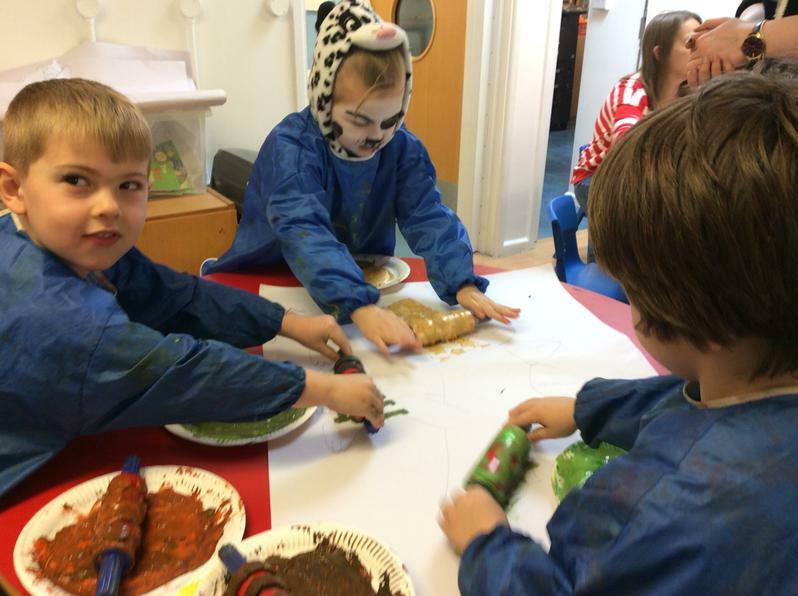 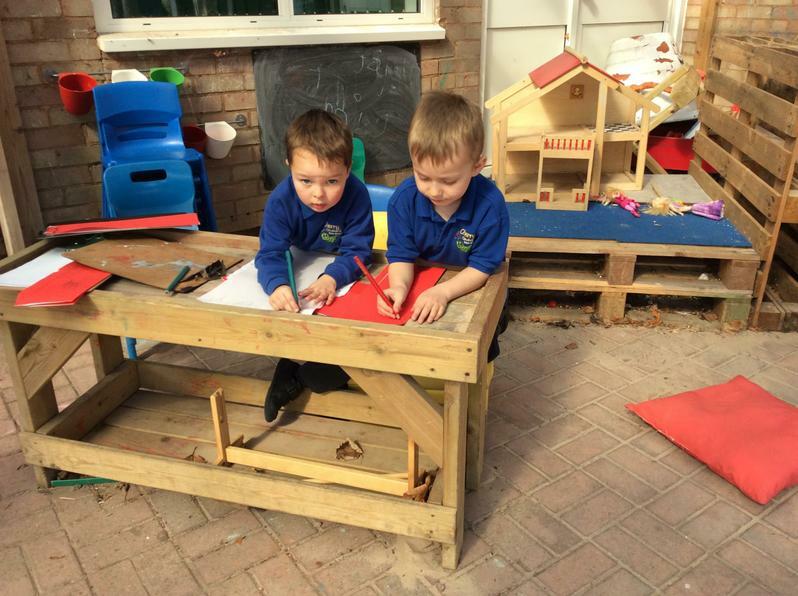 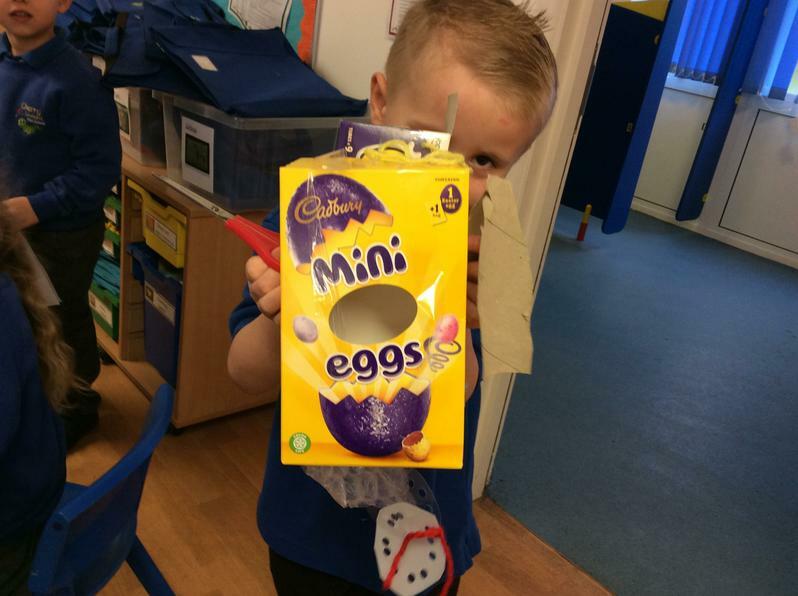 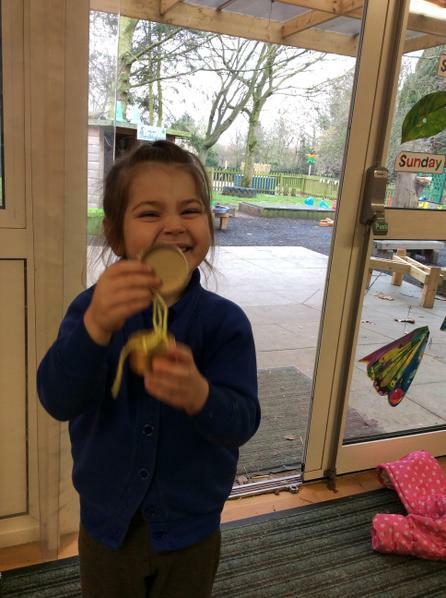 The letter sounds we are focussing on this week are i and n.
We acted out the Humpty Dumpty nursery rhyme using eggs and we had a magic egg that didn't break. 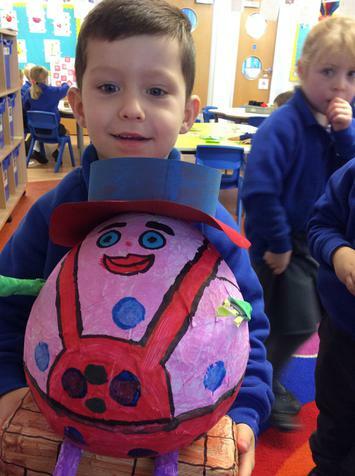 Humpty Dumpty is our focus this week....watch this space for pictures. 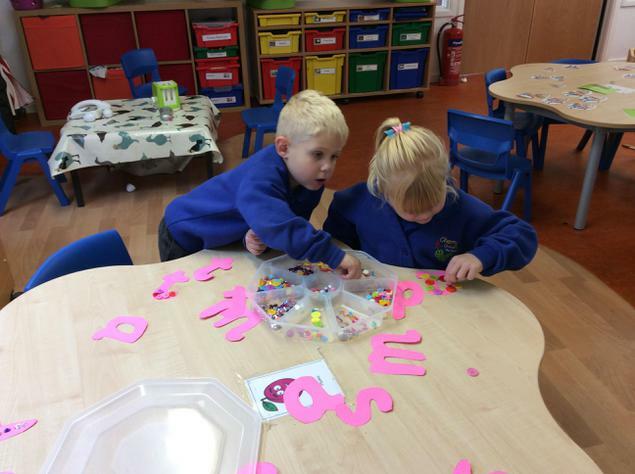 We are focussing on letter sounds d and t this week. 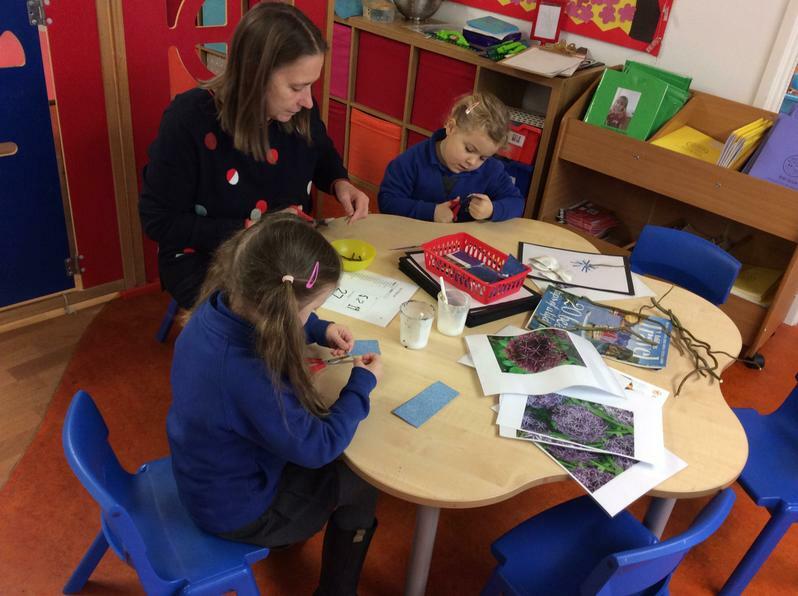 Christmas begins here...we have designed our Christmas cards for mums and dads to buy. 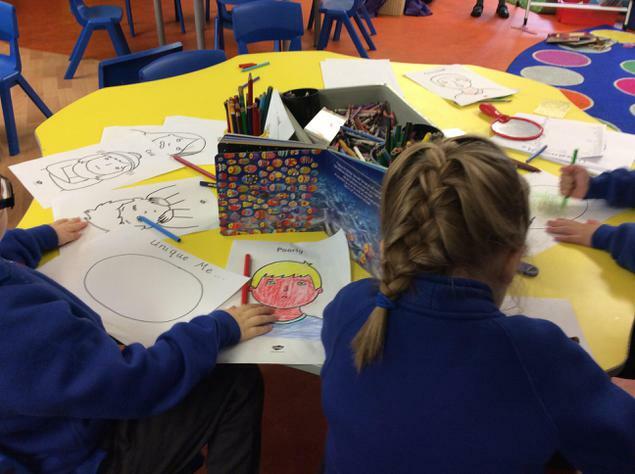 This week ,25.9.17, we will be looking at what makes us unique and thinking about feelings. 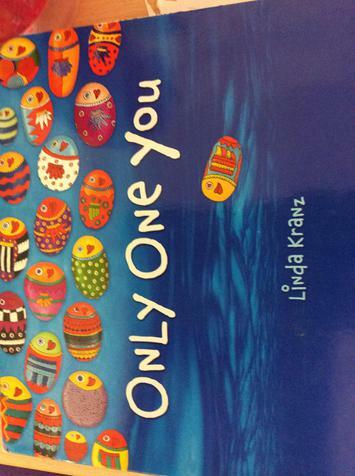 We will be reading the story Only One You. 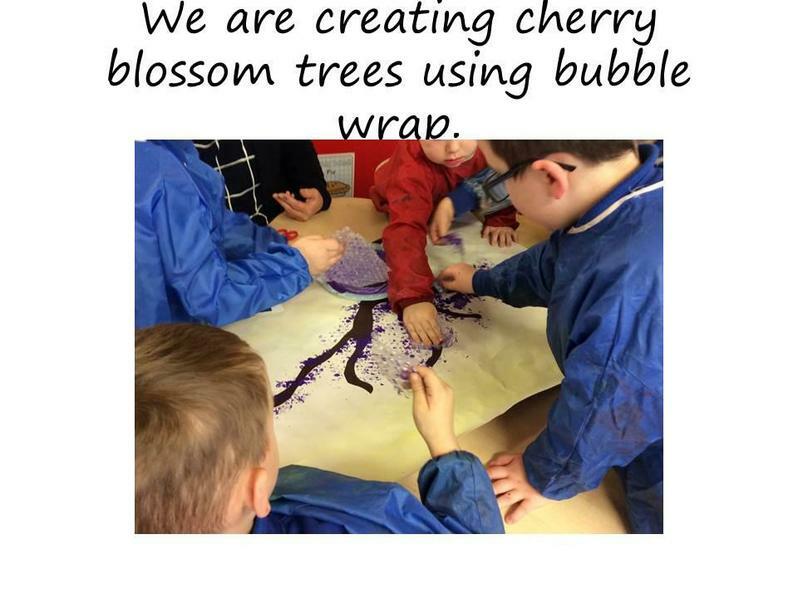 Later on in the week we will show you some of our unique fish pictures we are creating. 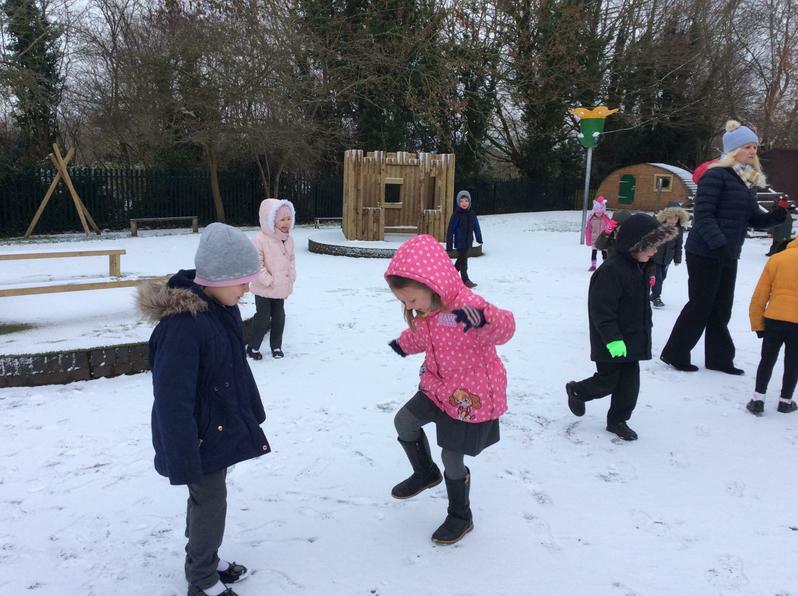 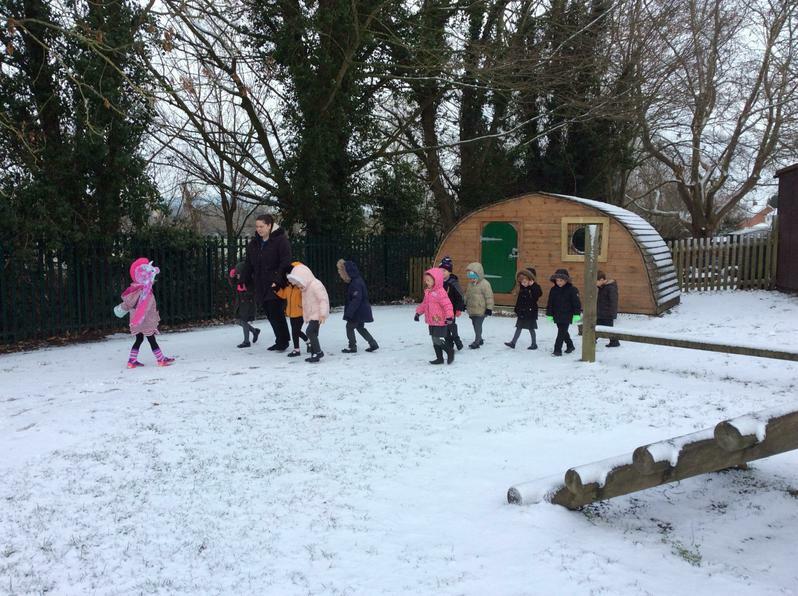 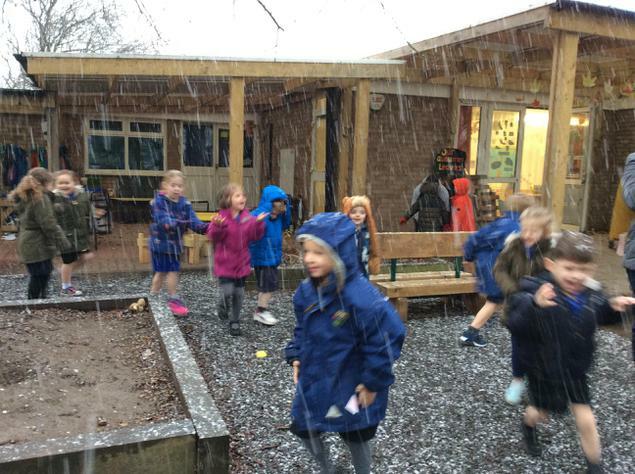 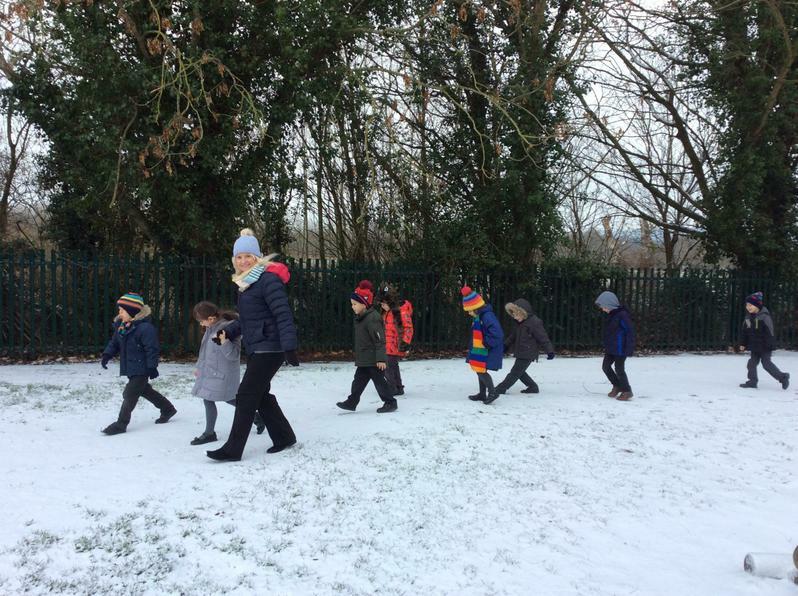 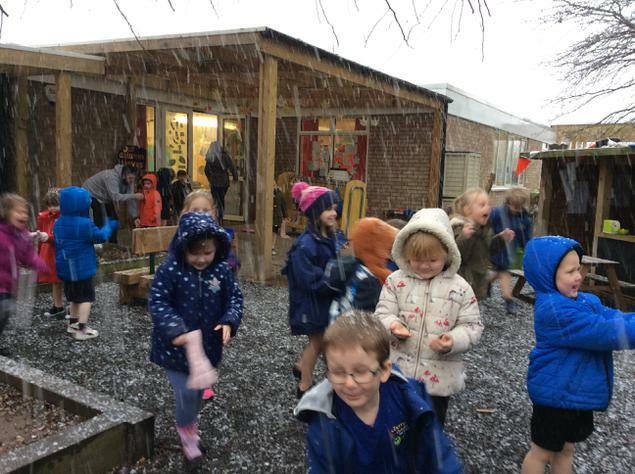 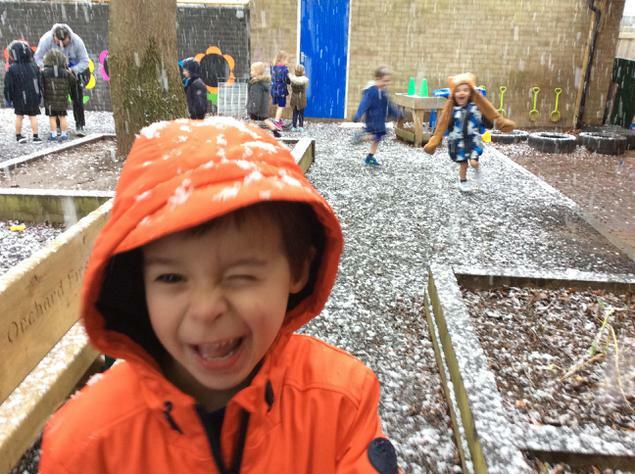 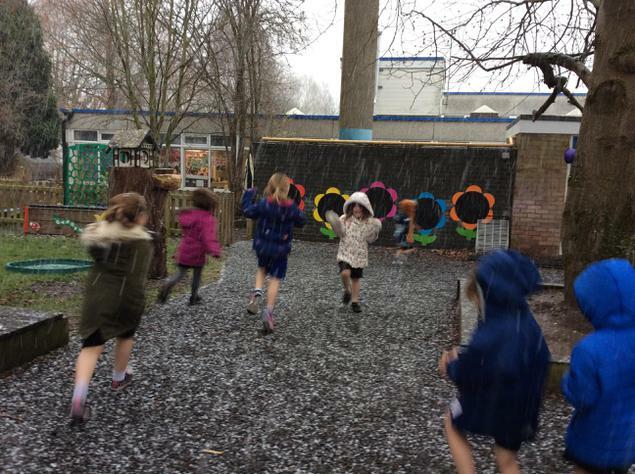 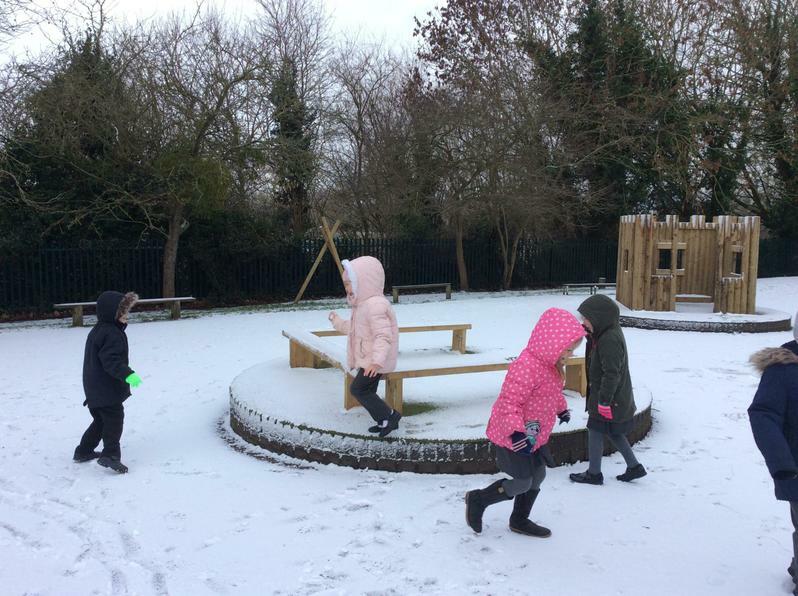 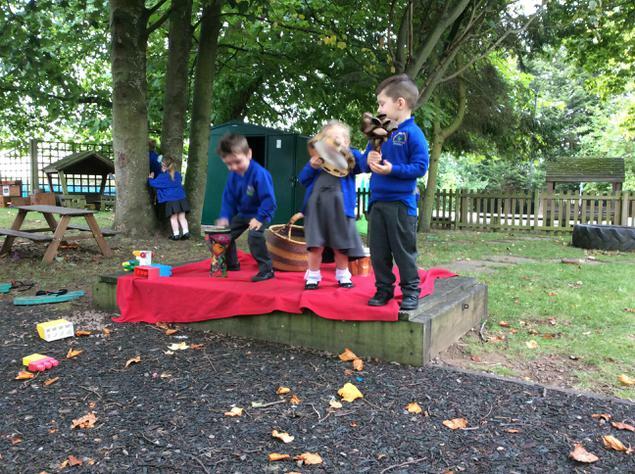 What a wonderful start to the term. 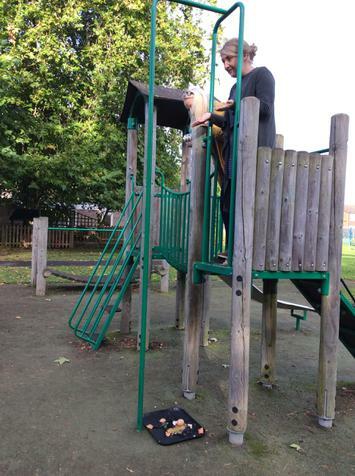 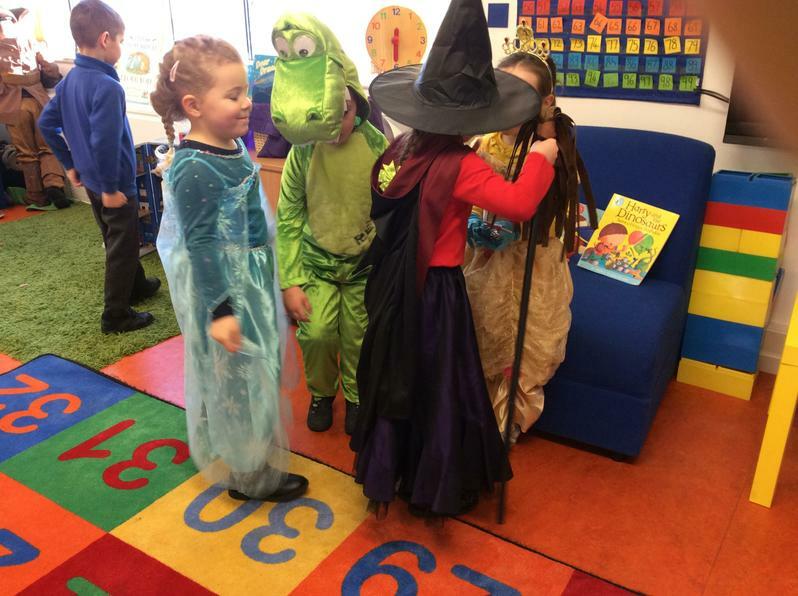 The children were so happy, kind and polite. 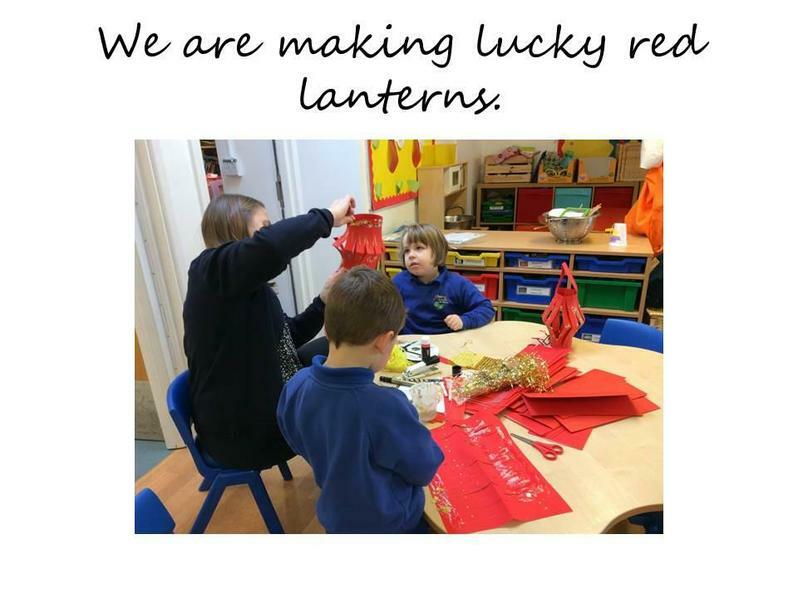 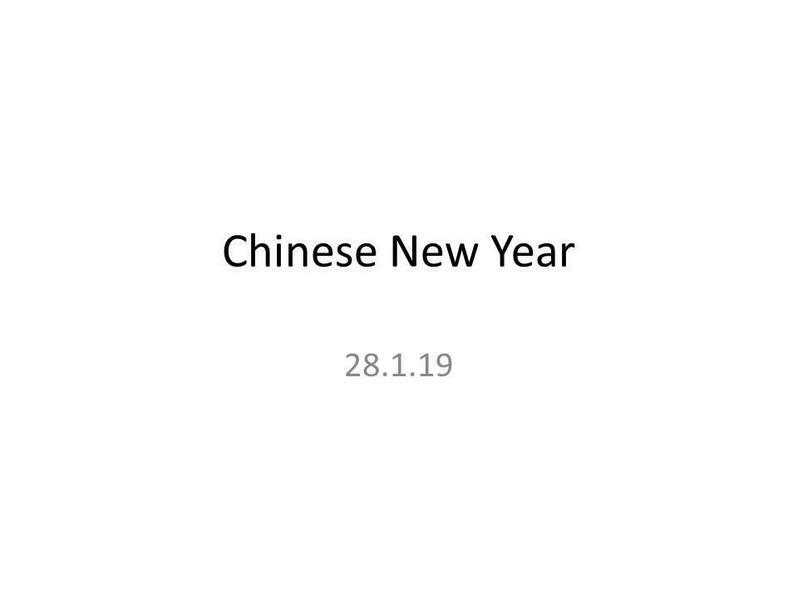 We are so looking forward to the year ahead. 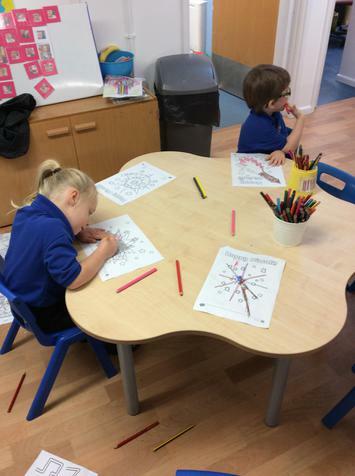 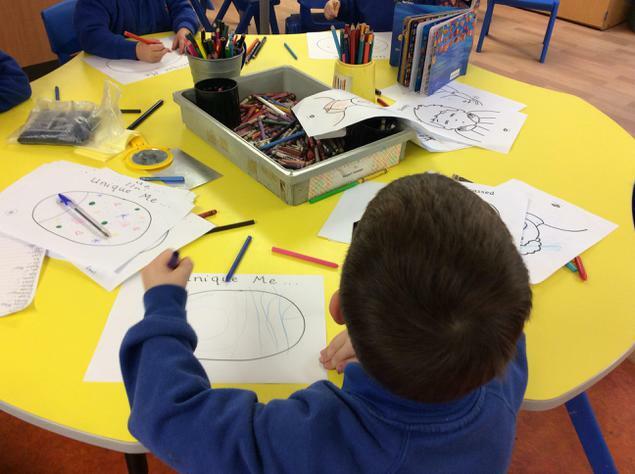 This week we have drawn self-portraits using pencil then adding colour with crayons. 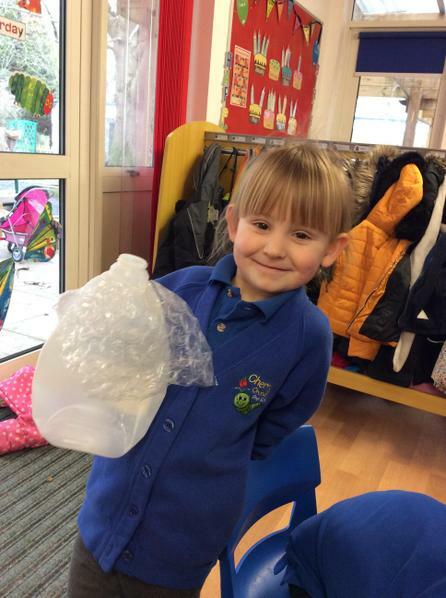 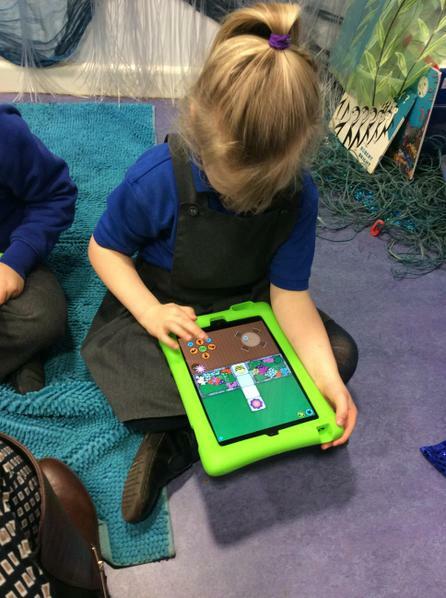 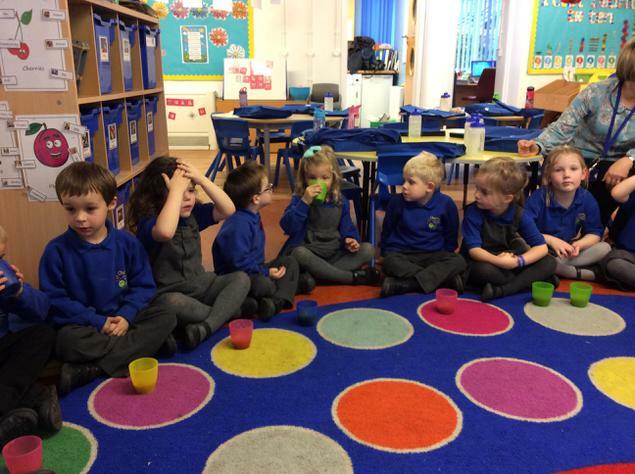 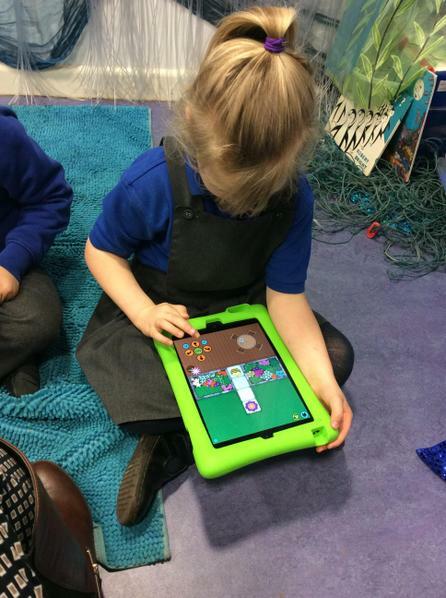 We have been looking at Cup Man and learning about MMS . 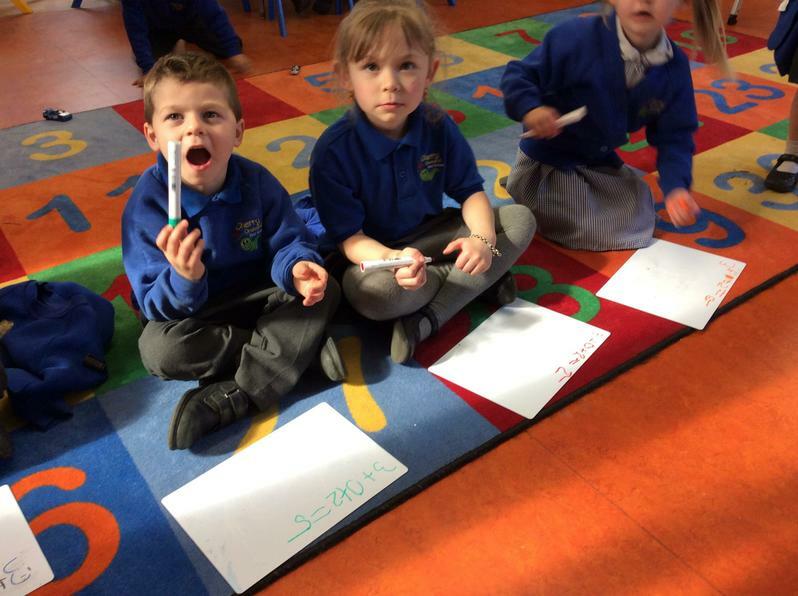 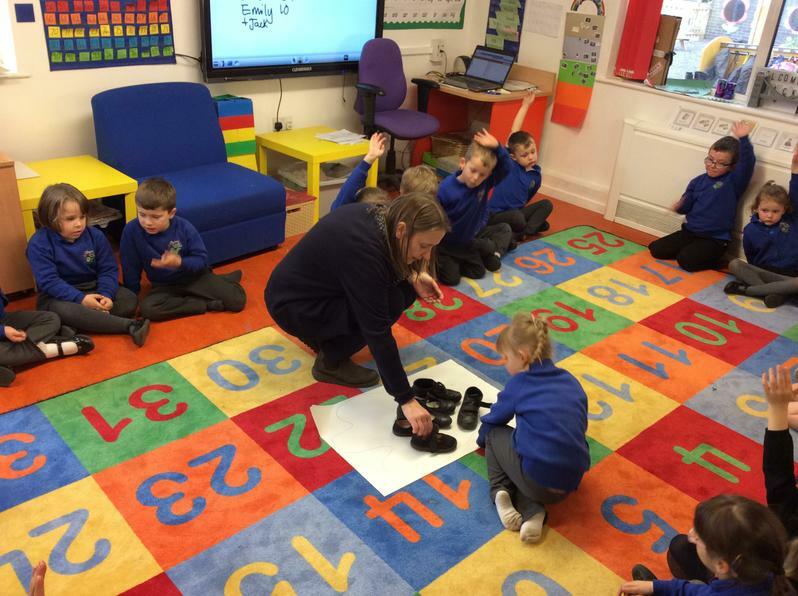 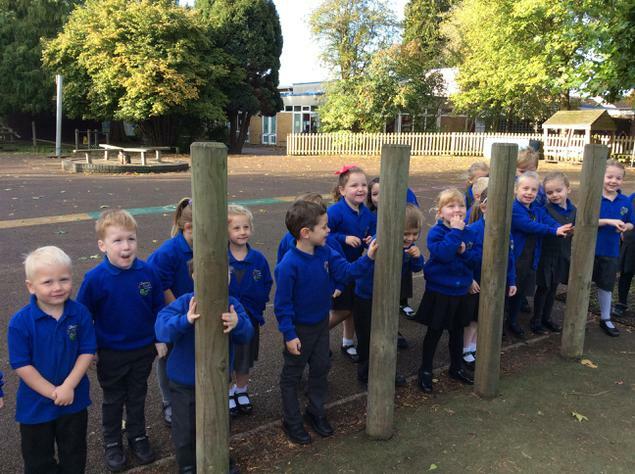 We have started learning our sound beginning with m, Maisie mountain. 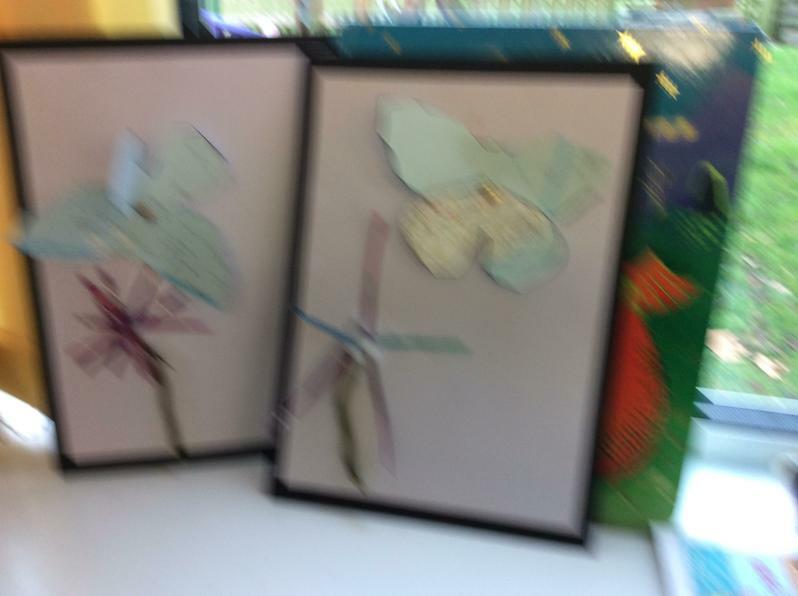 Hurricane Irma. 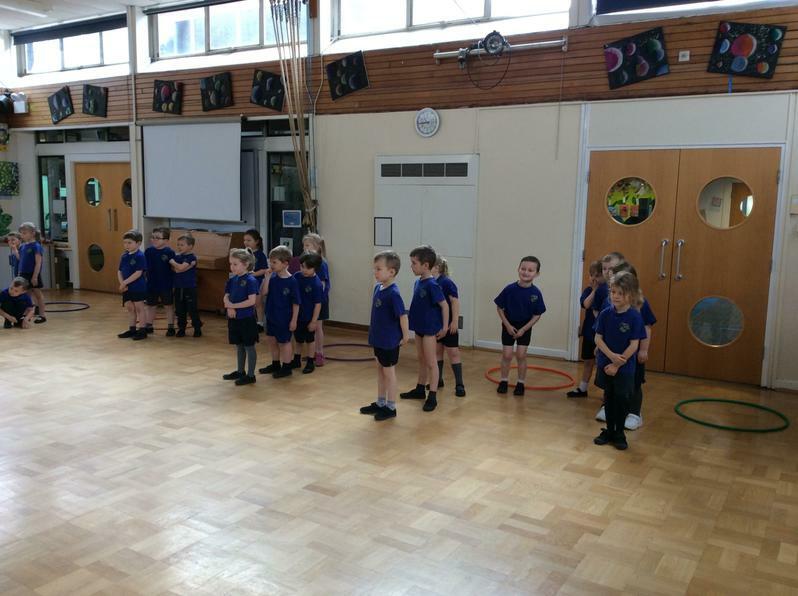 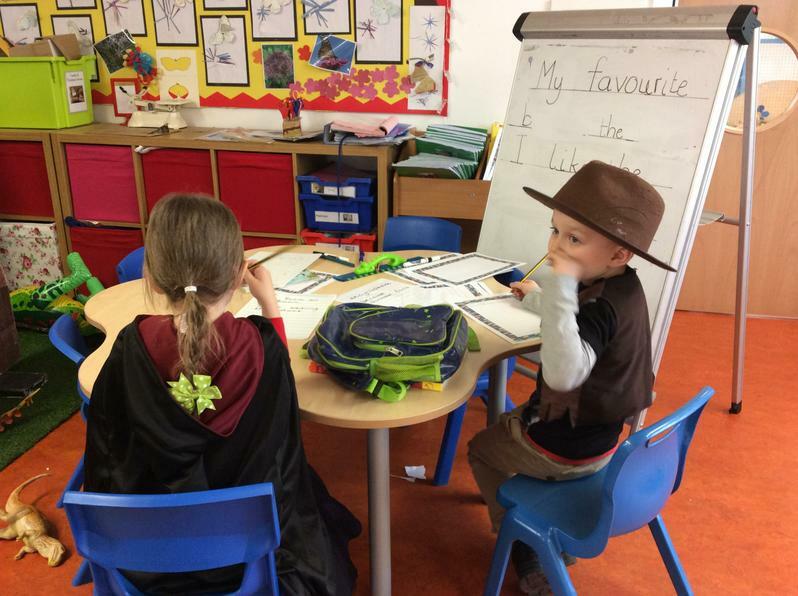 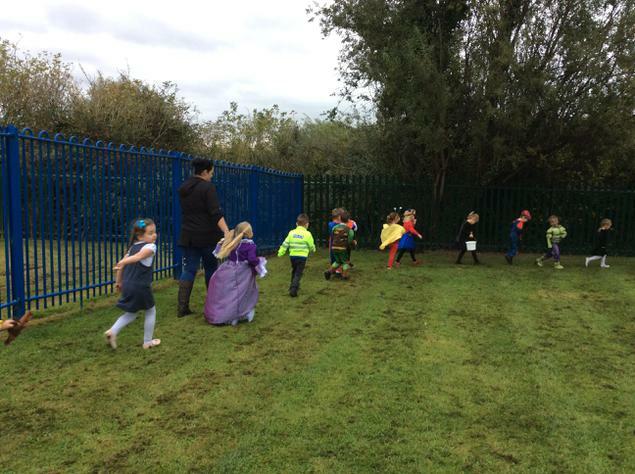 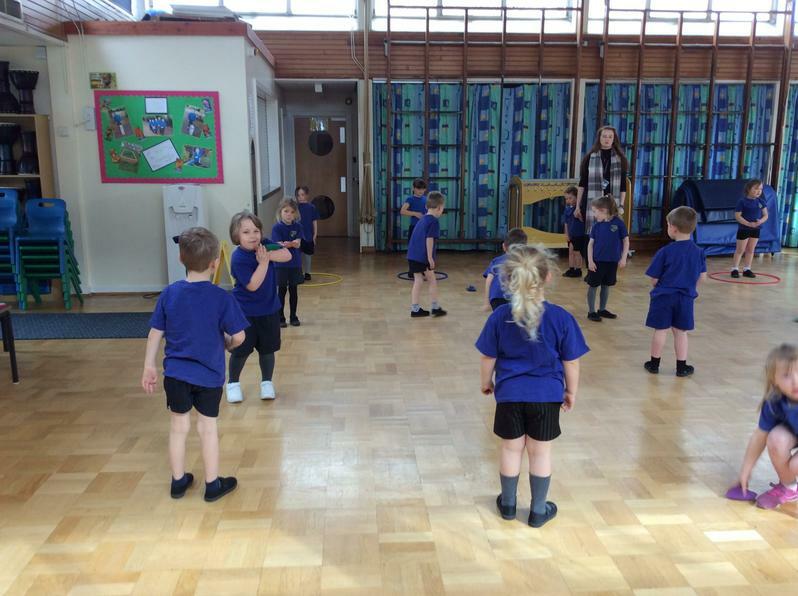 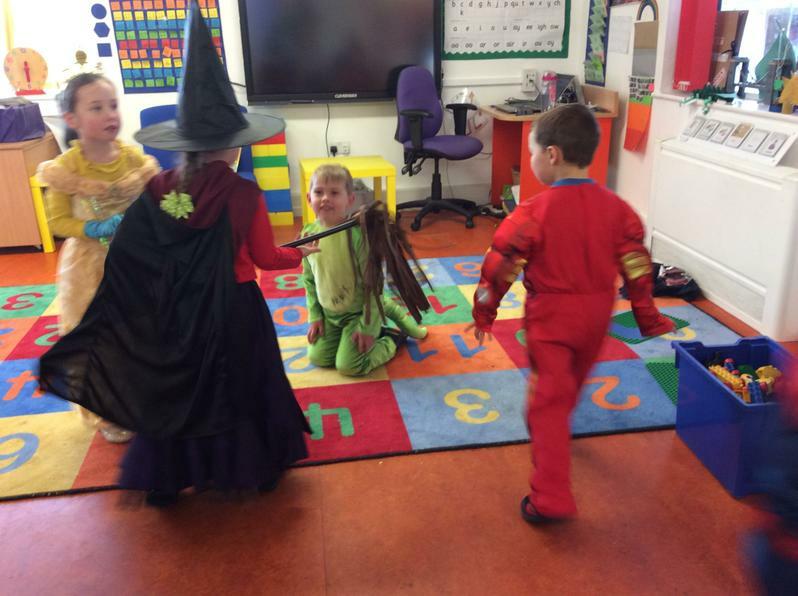 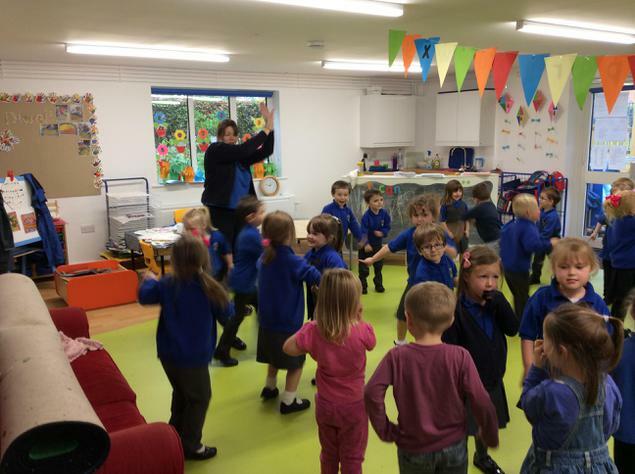 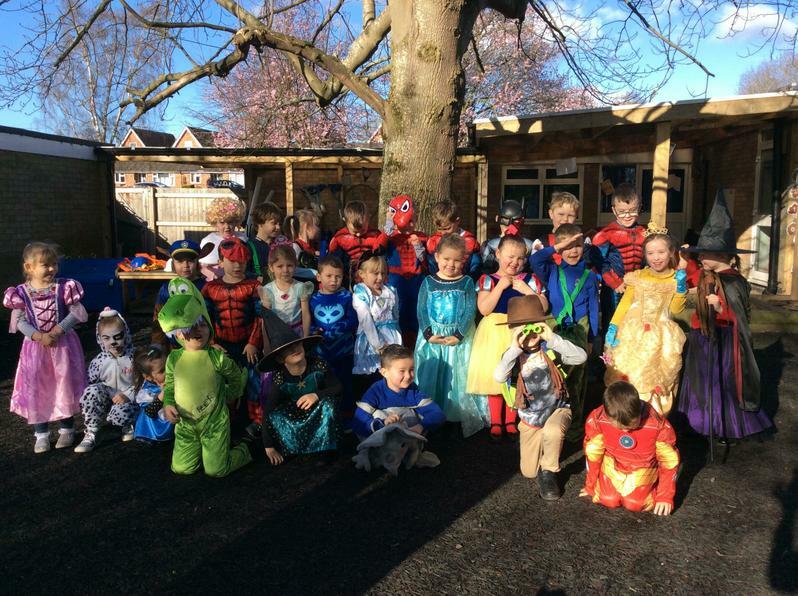 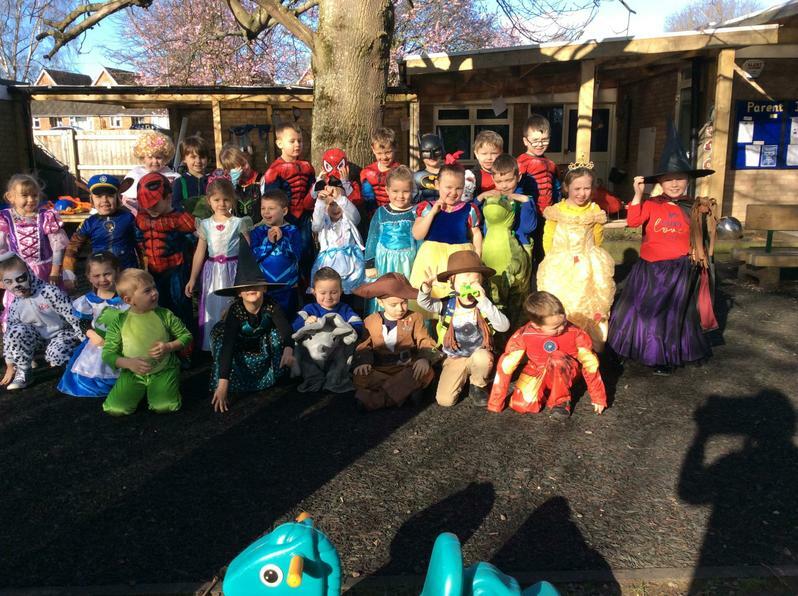 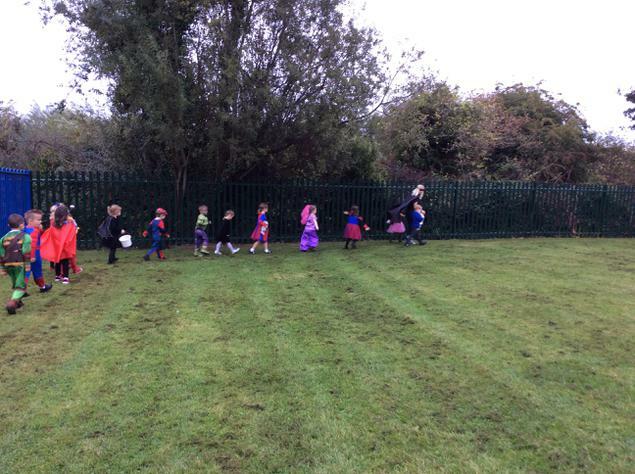 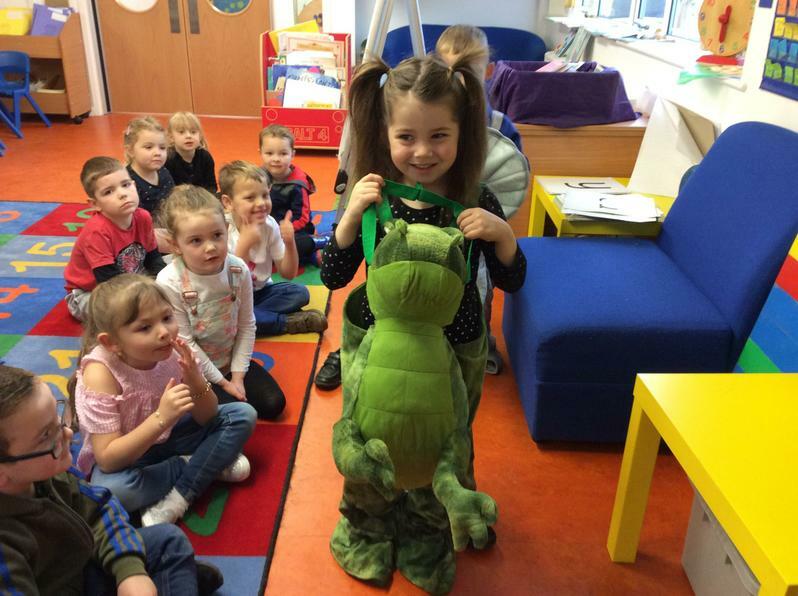 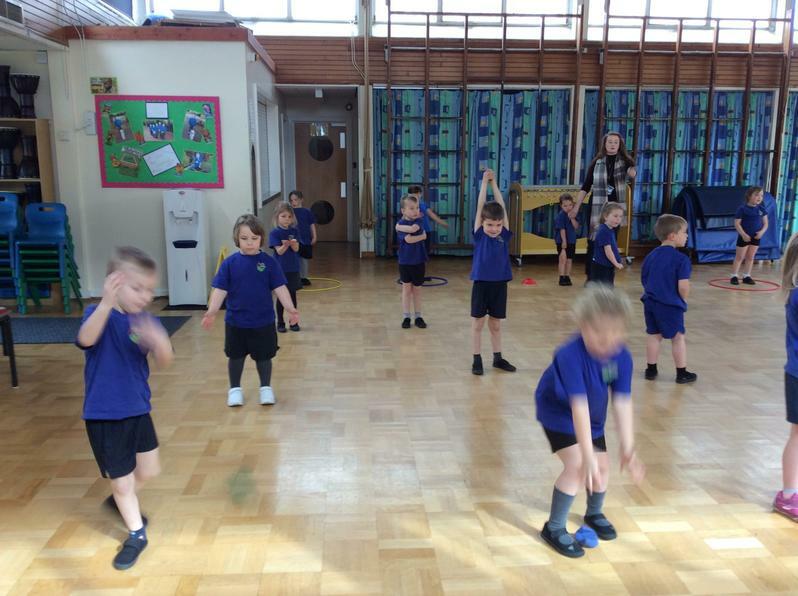 The children all looked very colourful and being a super hero helped them learn their new sound m.